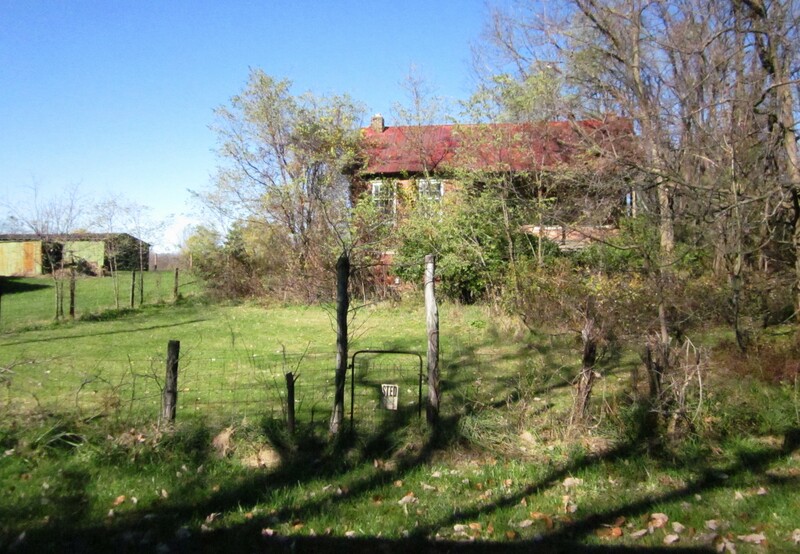 It is with deep regret that I must tell you our former tenants, Doreen & Steve Piechota are no longer at Walker Homestead. 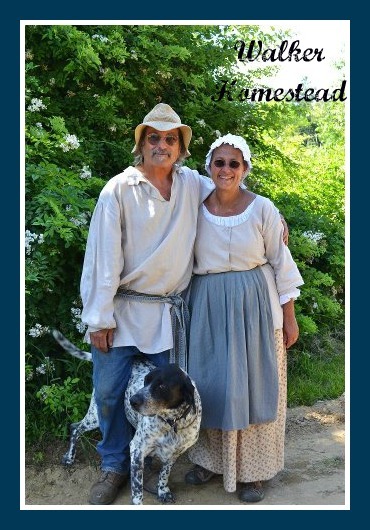 Our differences in business practices made it impossible to continue working together and we were forced to ask them to leave Walker Homestead and discontinue the use of our name. 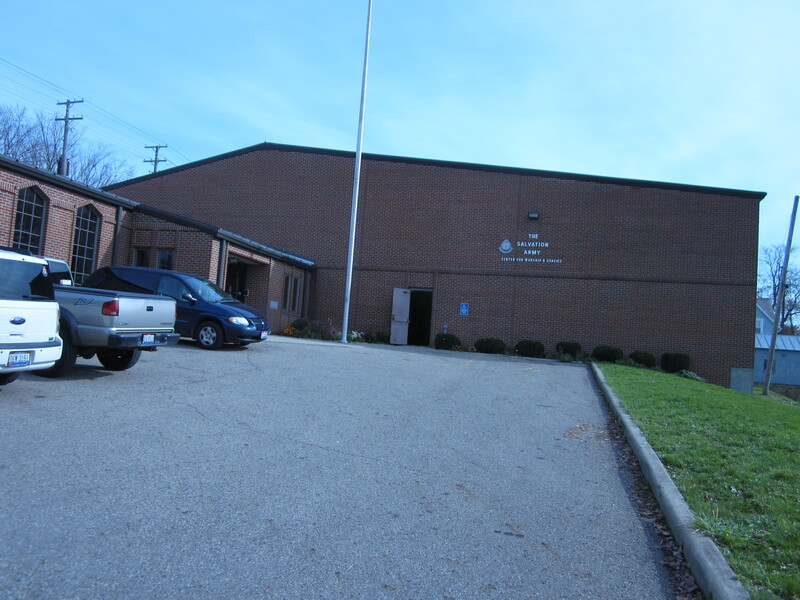 I am extremely disappointed in their handling of the situation and hope that they are able to move forward in their lives with a more positive attitude, wishing them great success in all that they do. 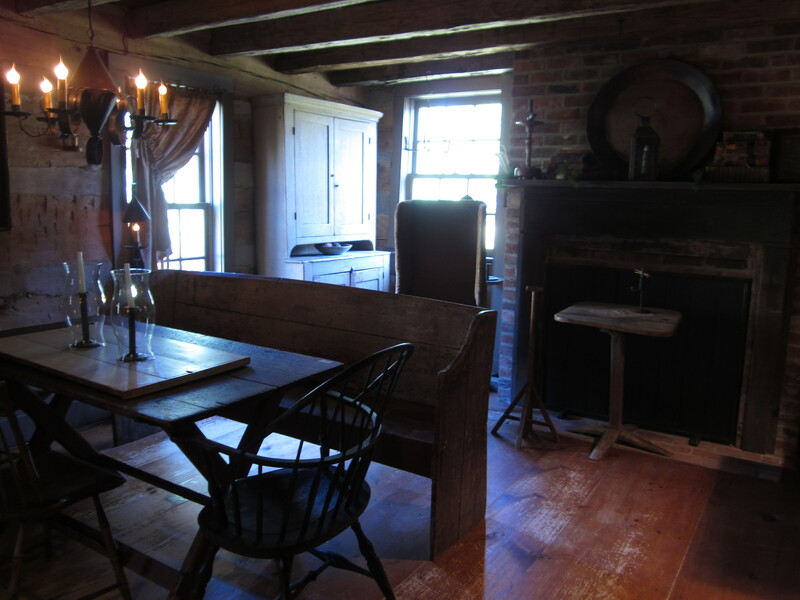 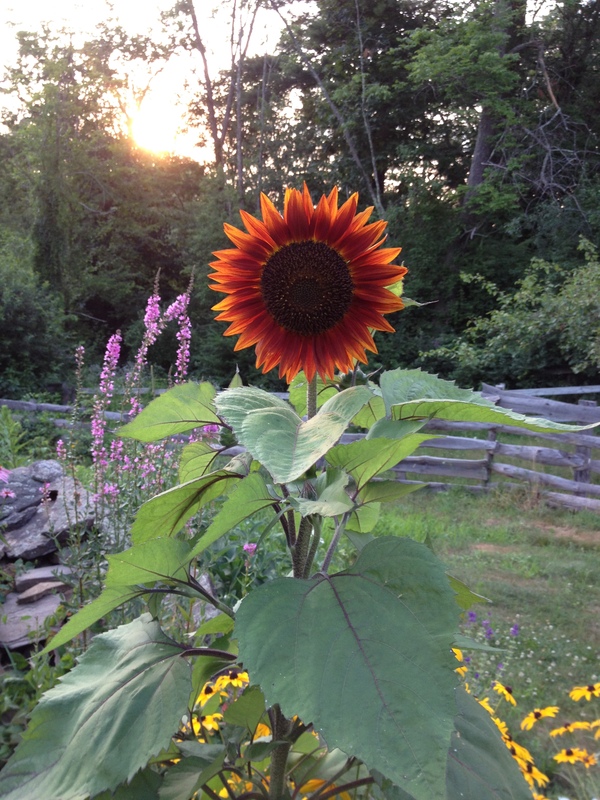 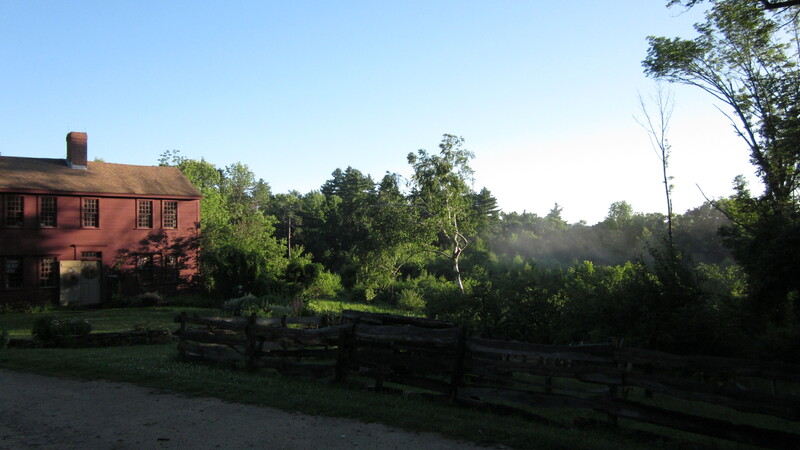 As we await the return of our e-mail and mailing lists, please sign up for updates by contacting me directly at info@walkerhomestead.com (note the NEW E-MAIL) or calling 508-867-4466. 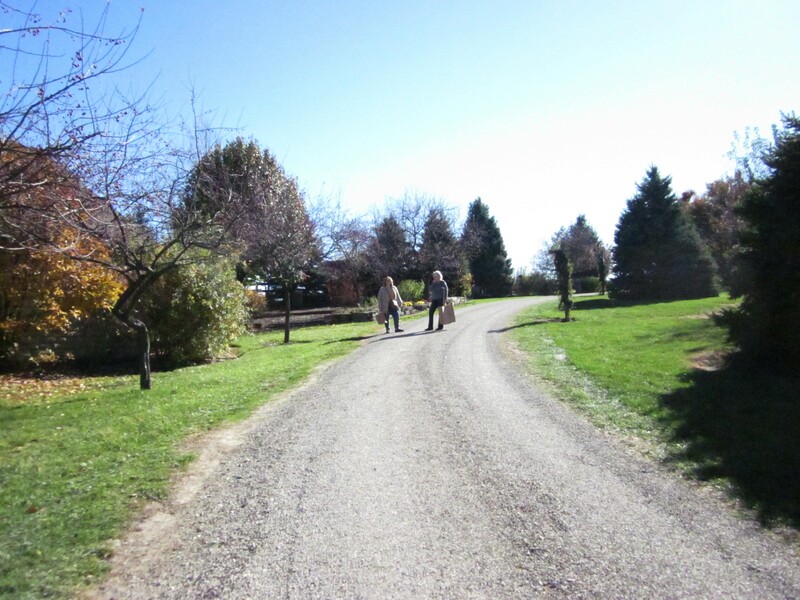 I welcome your comments and concerns and look forward to working with you in the future. 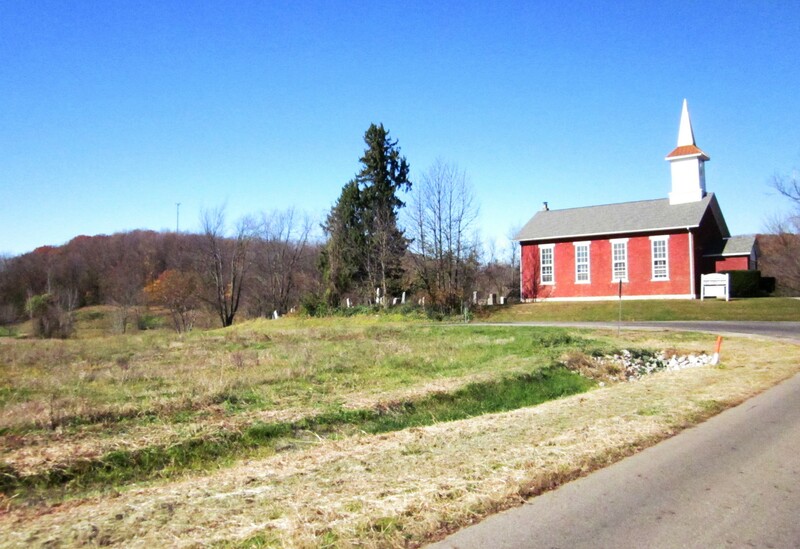 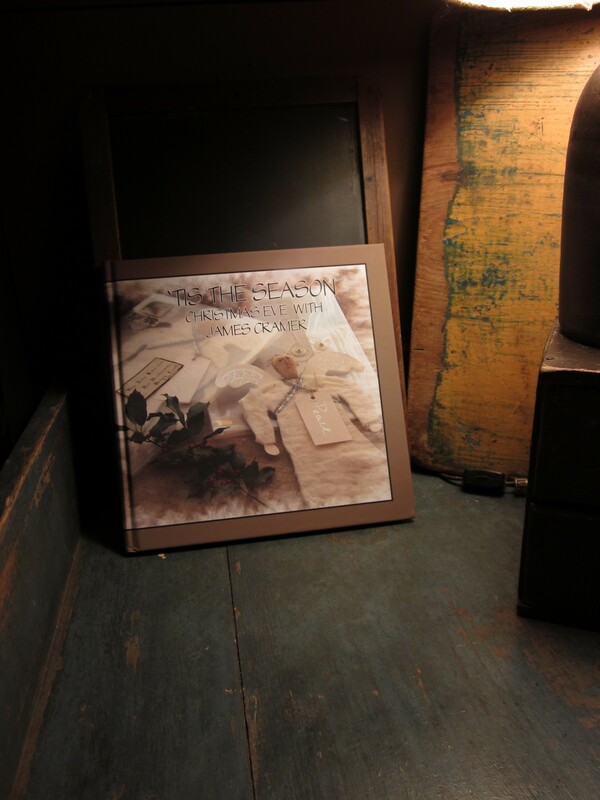 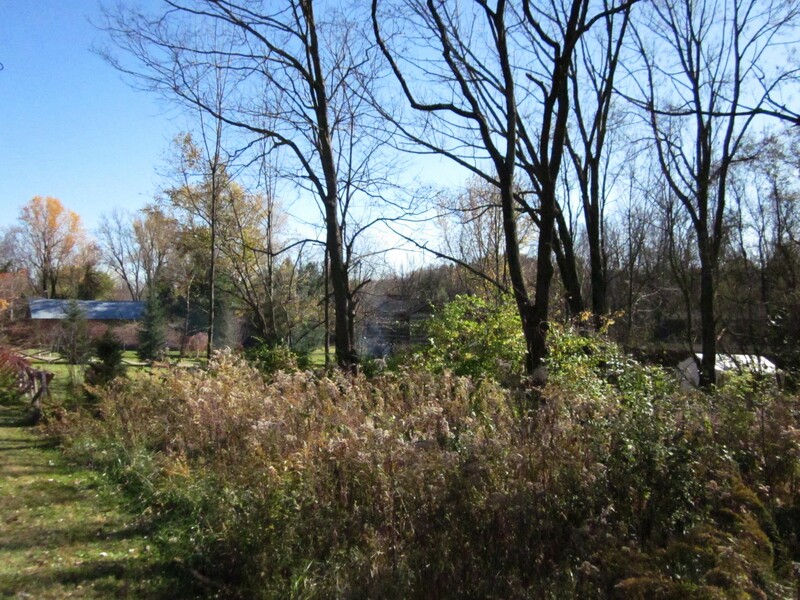 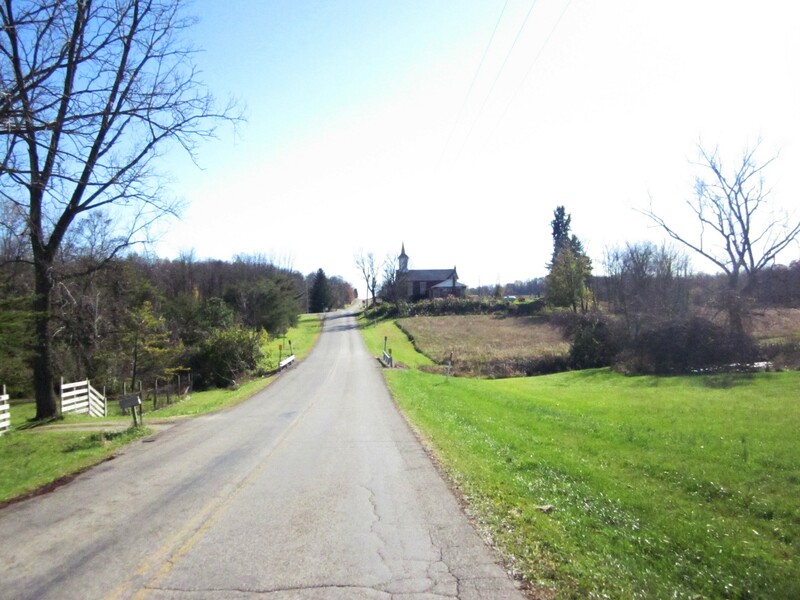 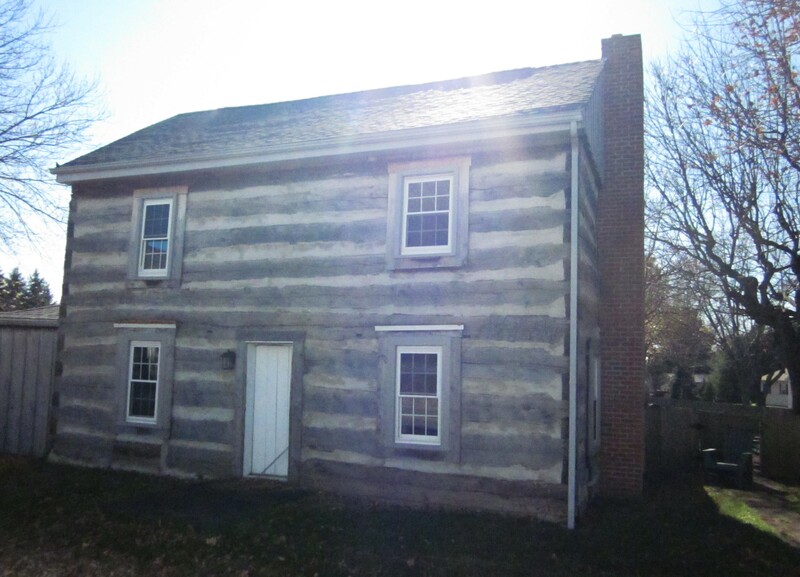 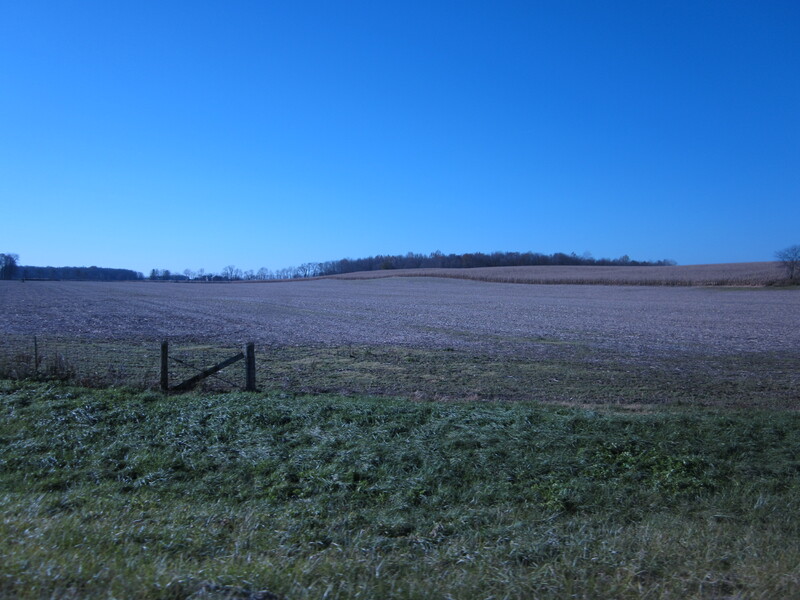 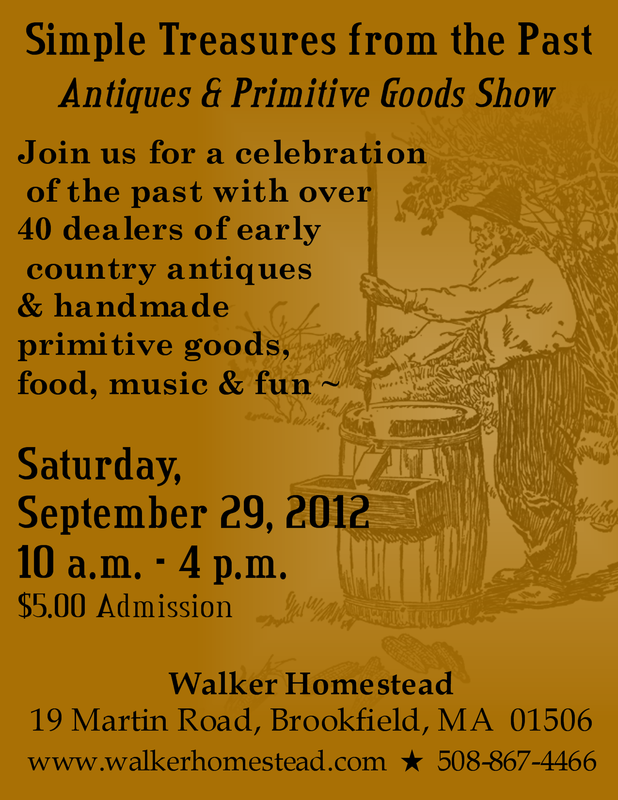 That being said, we are continuing to move forward with our plans for Walker Homestead. 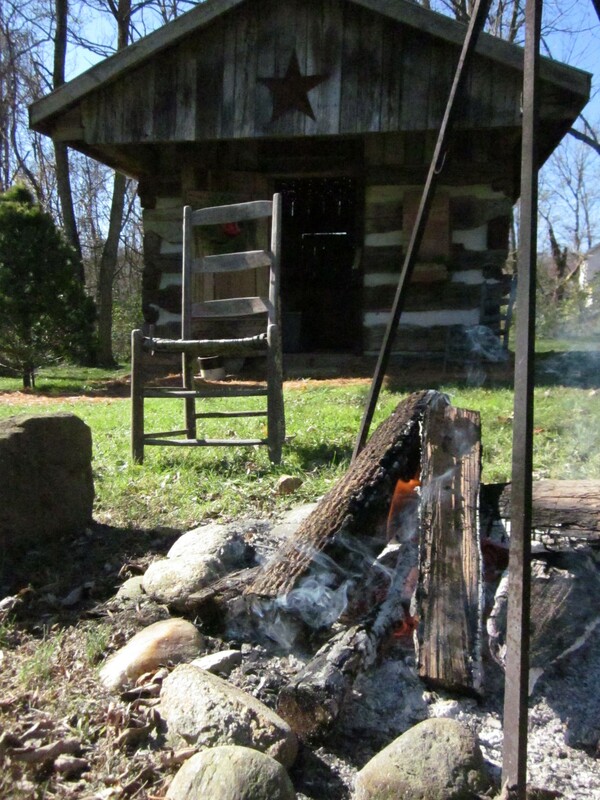 ALL EVENTS SCHEDULED AT WALKER HOMESTEAD WILL CONTINUE AND WE ARE STILL IN BUSINESS, contrary to insinuations made by others. 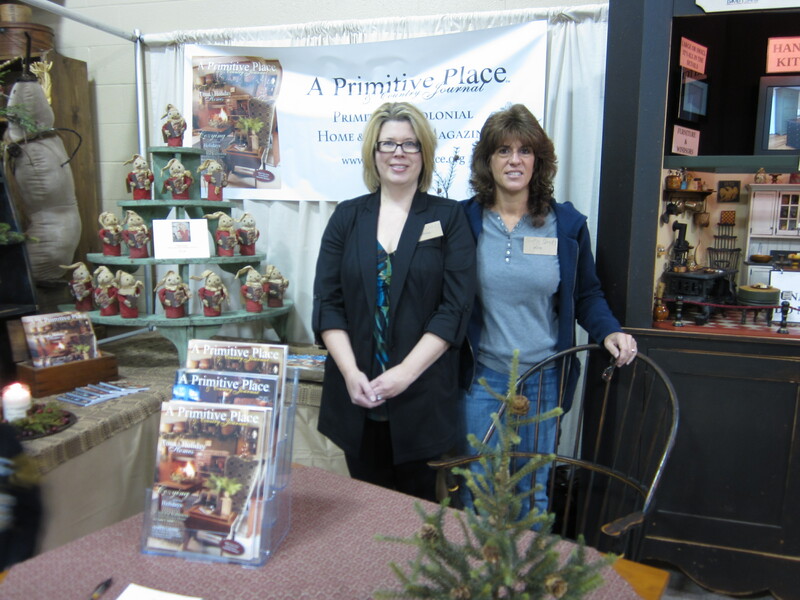 Please visit our website for our current schedule of events and appearances. 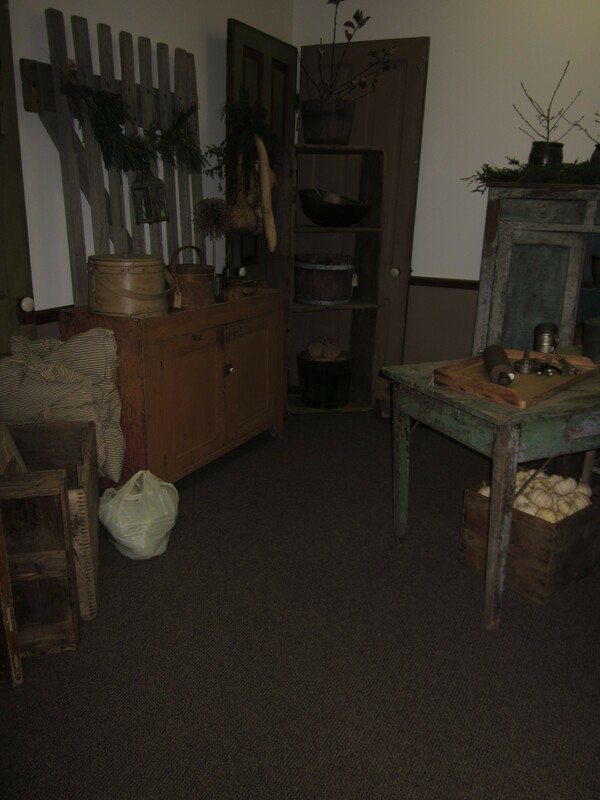 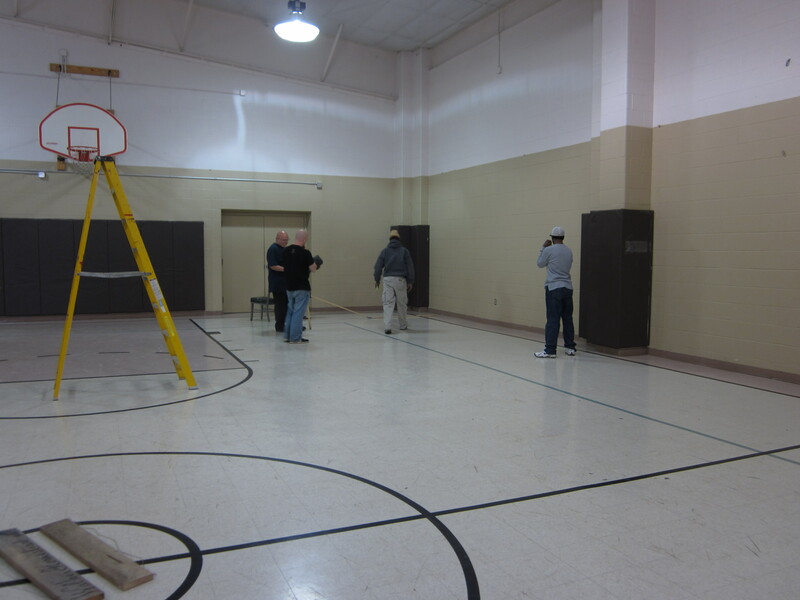 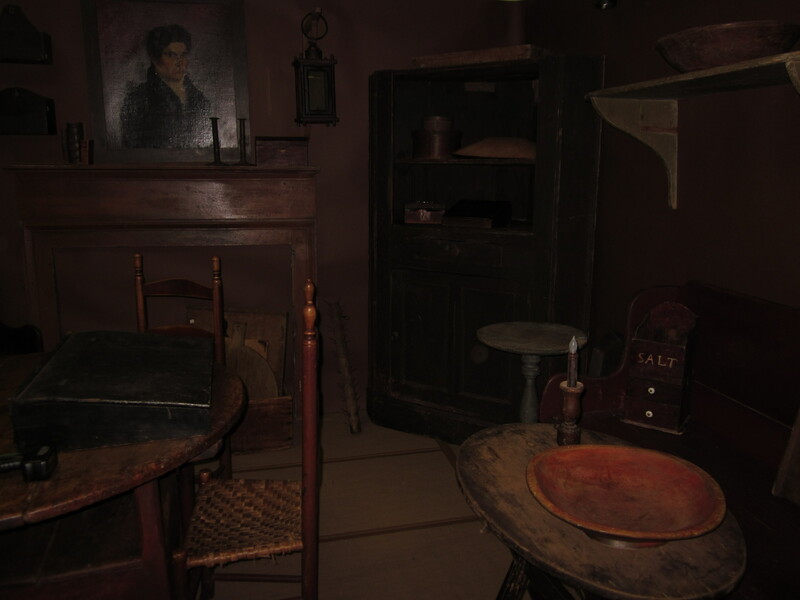 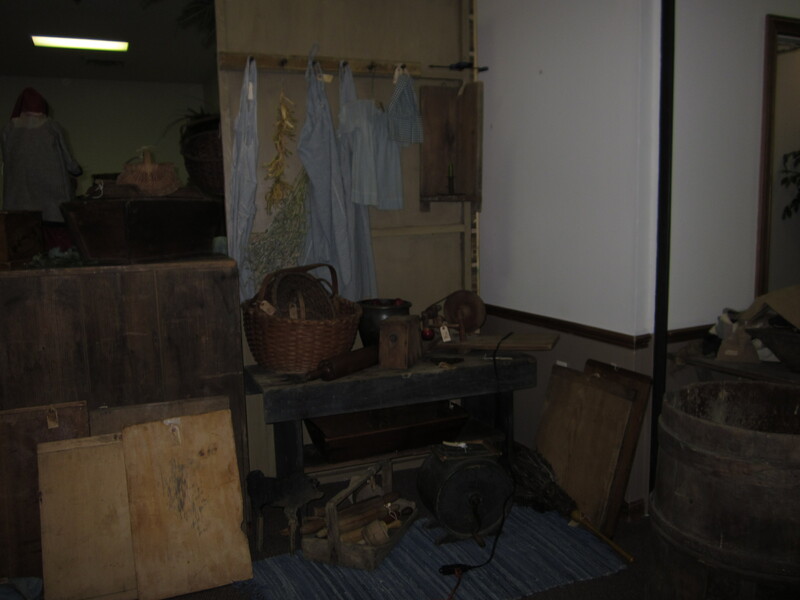 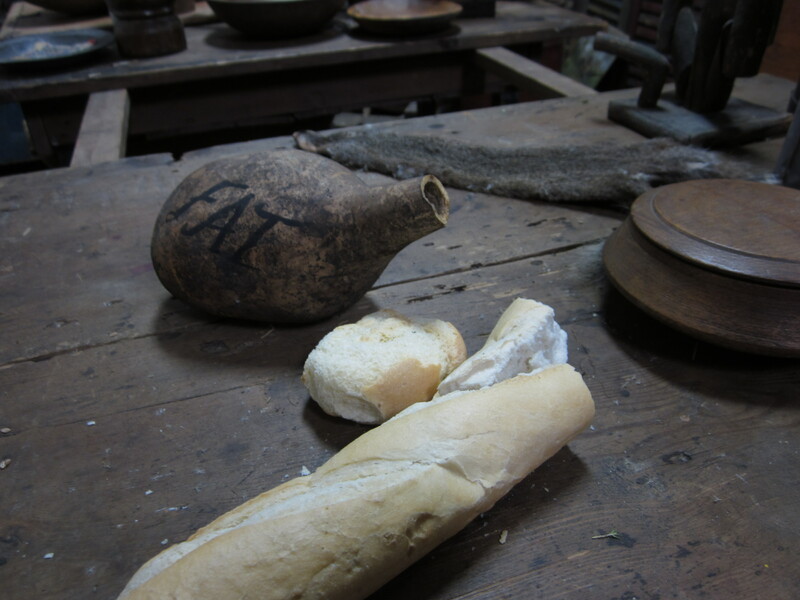 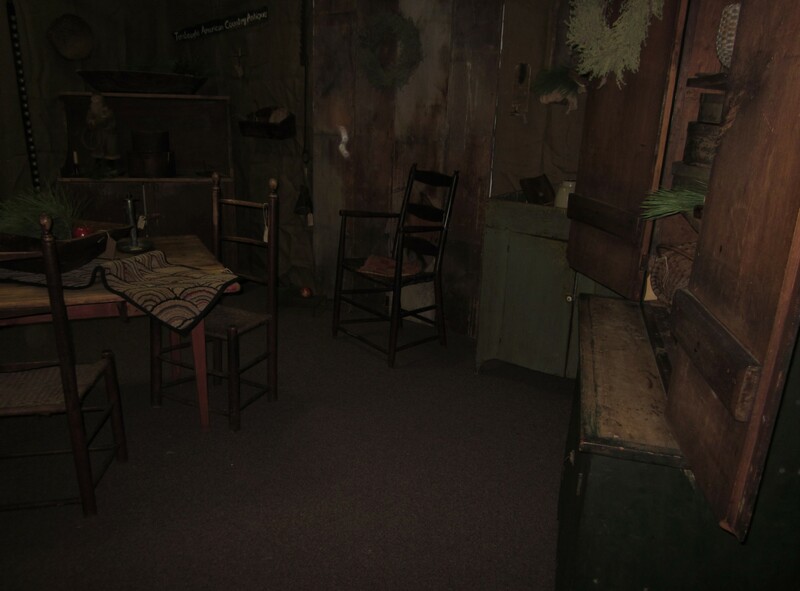 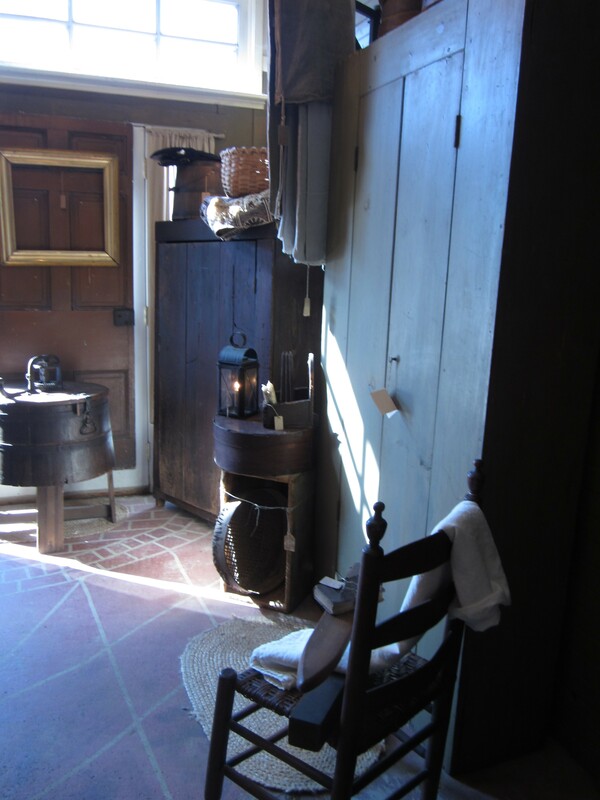 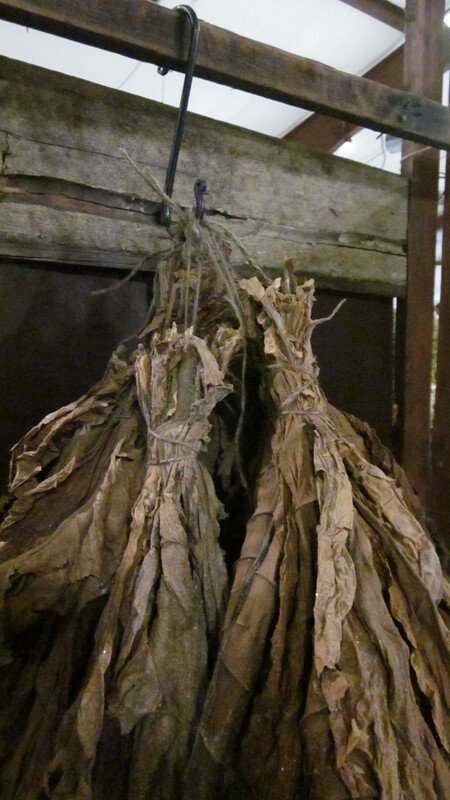 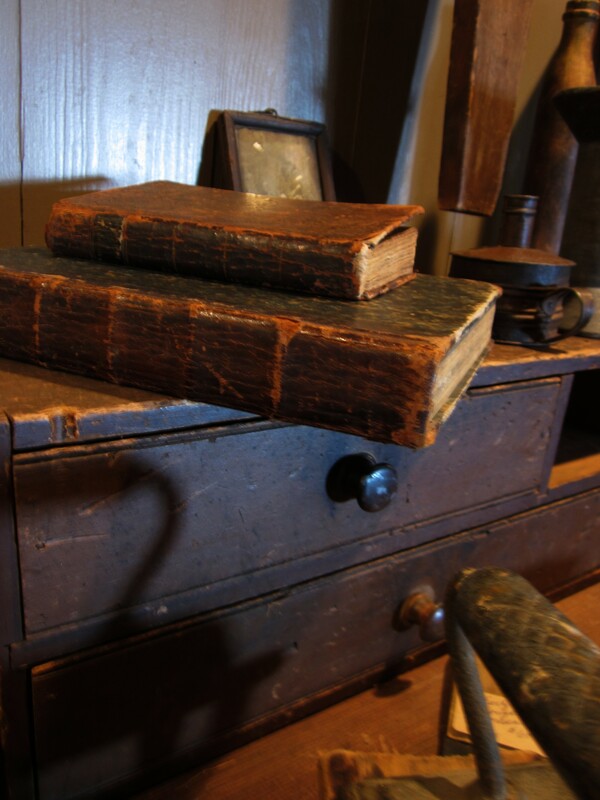 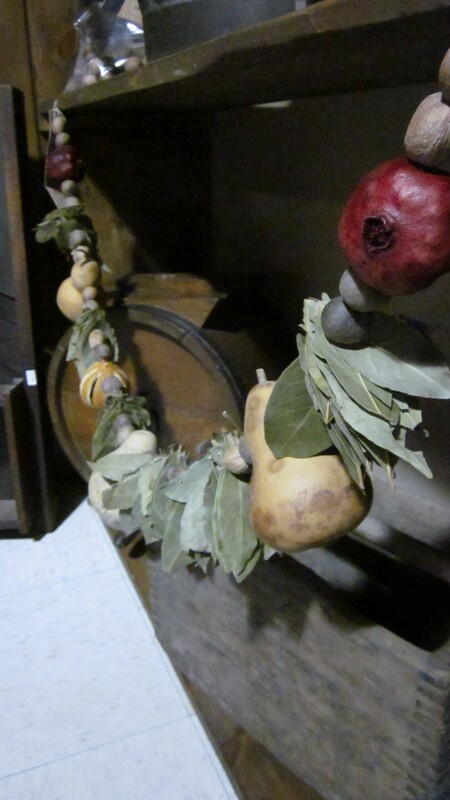 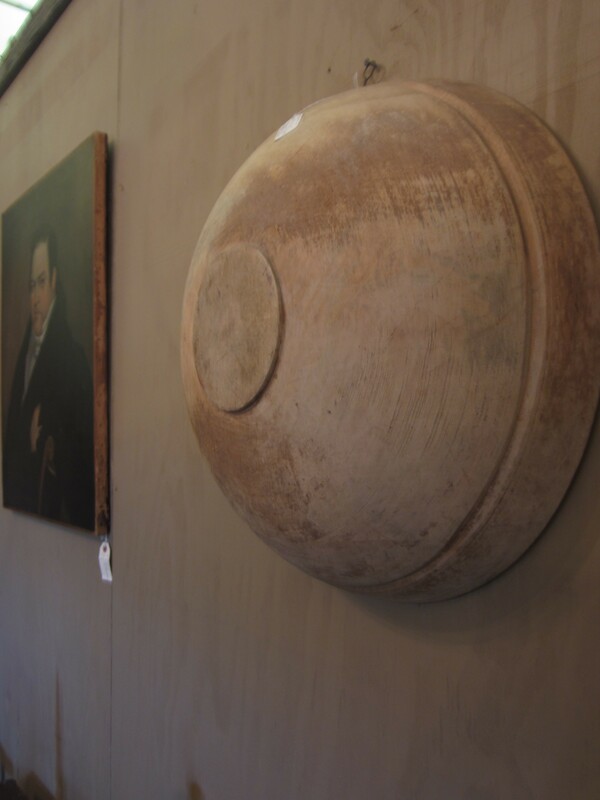 Surprises are in store for you in the Lower West Chamber as we give it a good cleaning, fresh paint… and??? 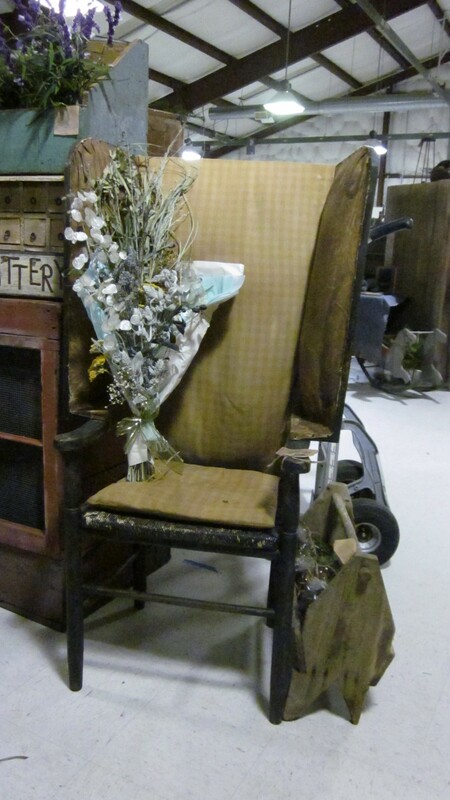 It’s a surprise!!! 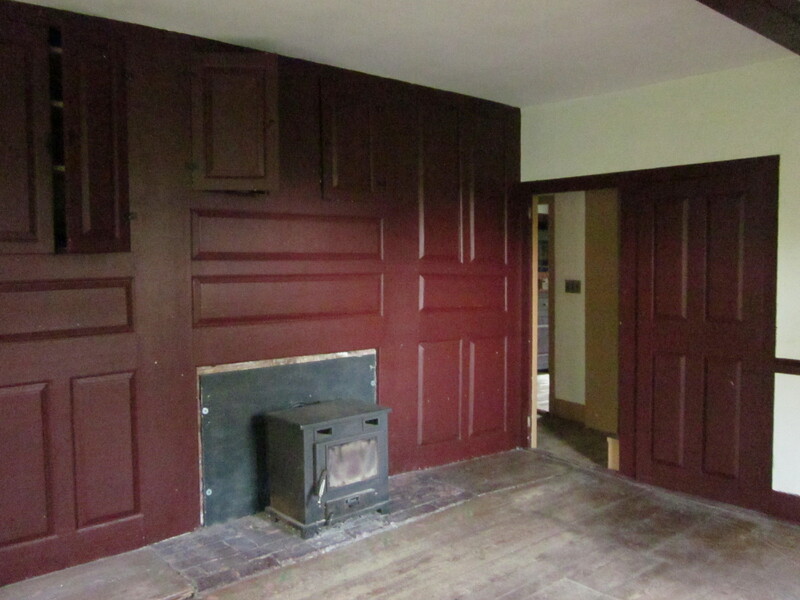 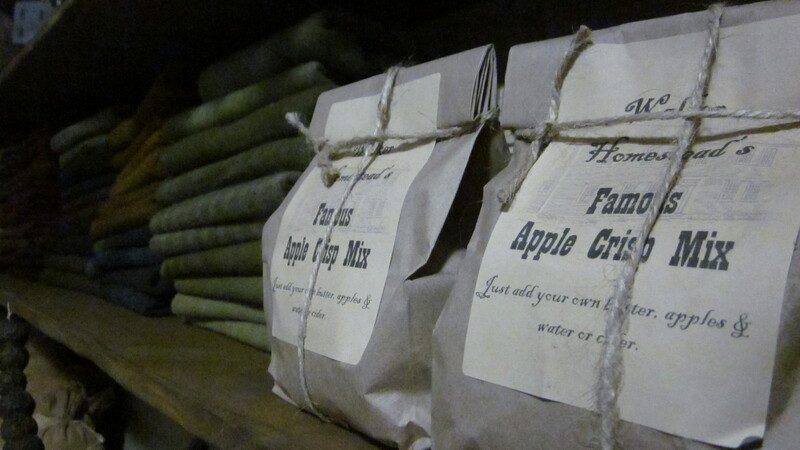 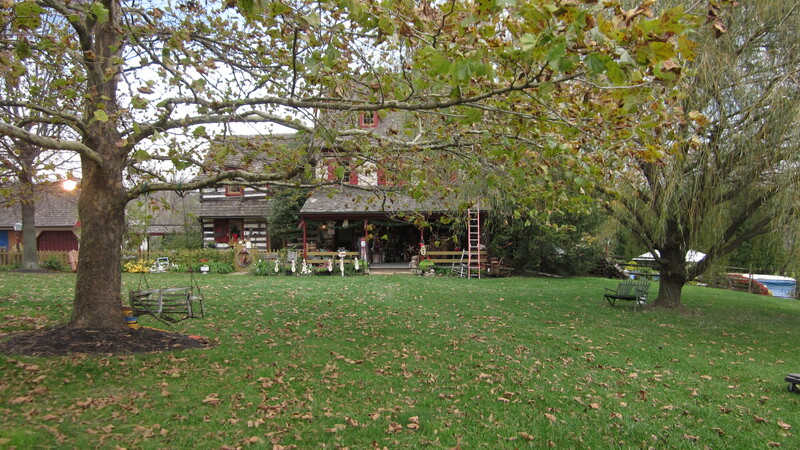 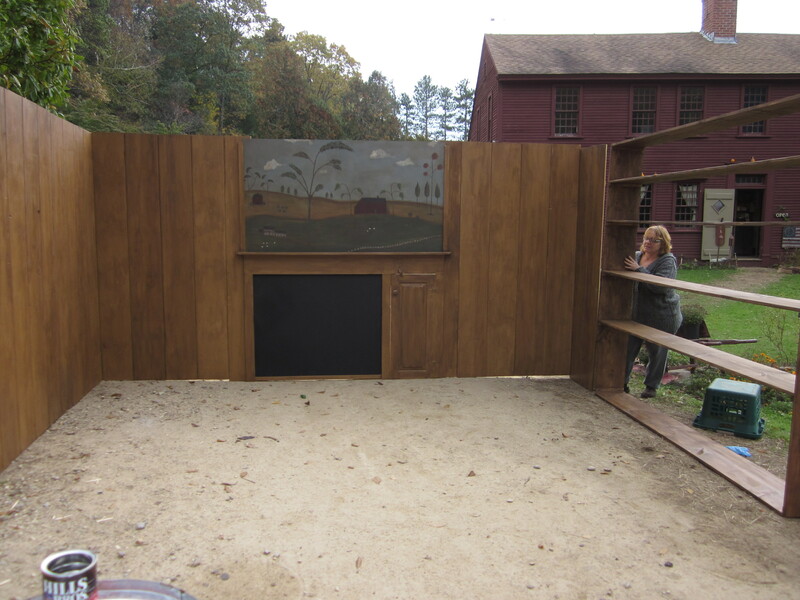 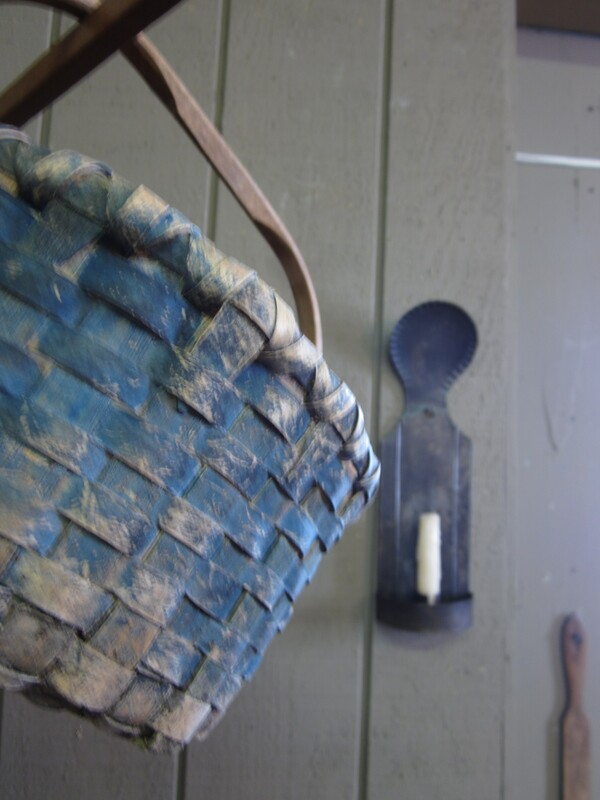 Over the next couple of weeks, many changes are coming to Walker Homestead! 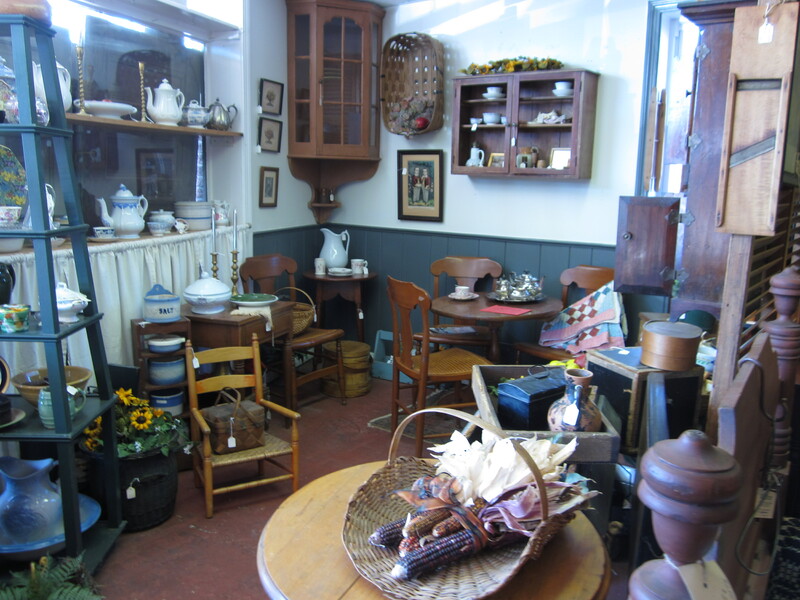 We are renovating the shop, cleaning & repainting, to make it the best it can be. 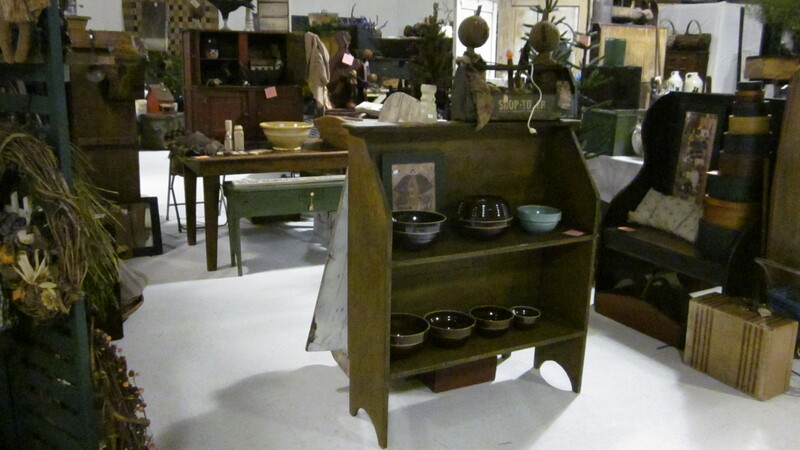 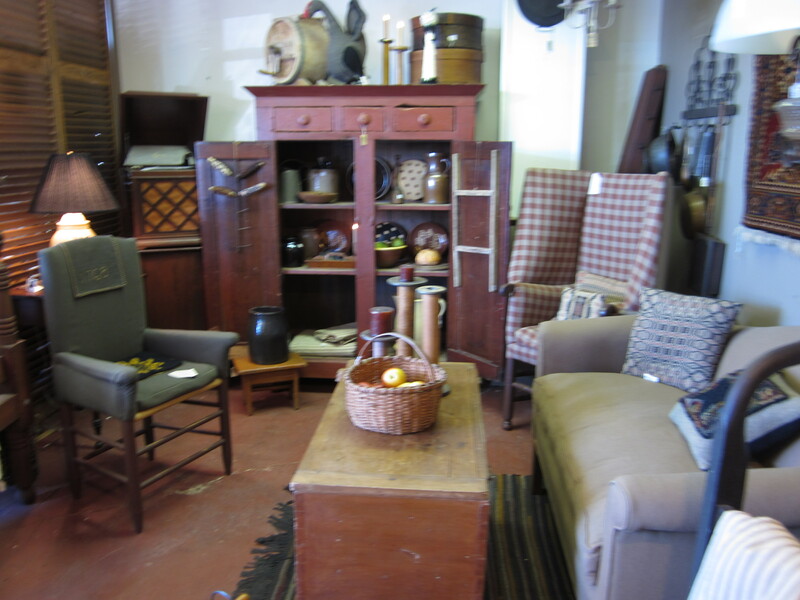 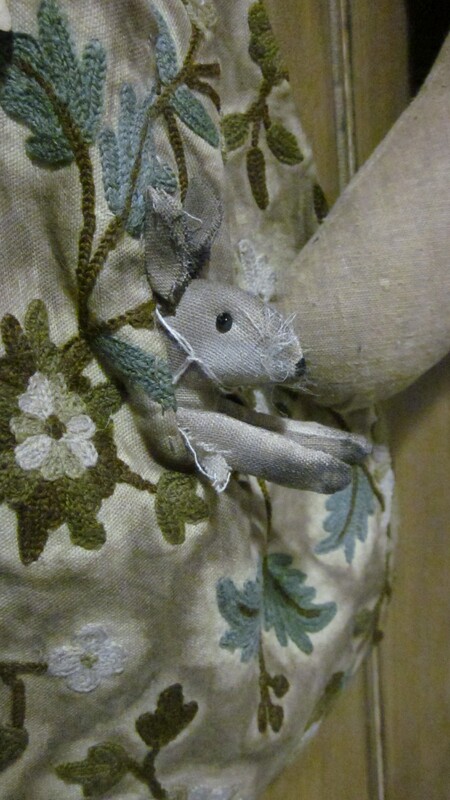 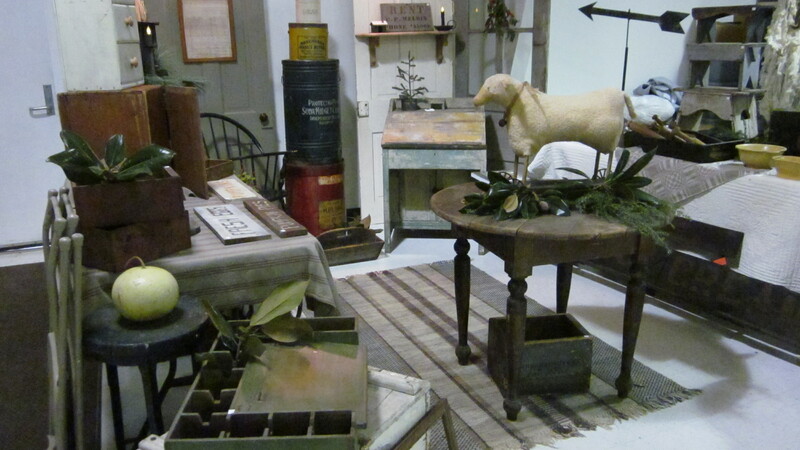 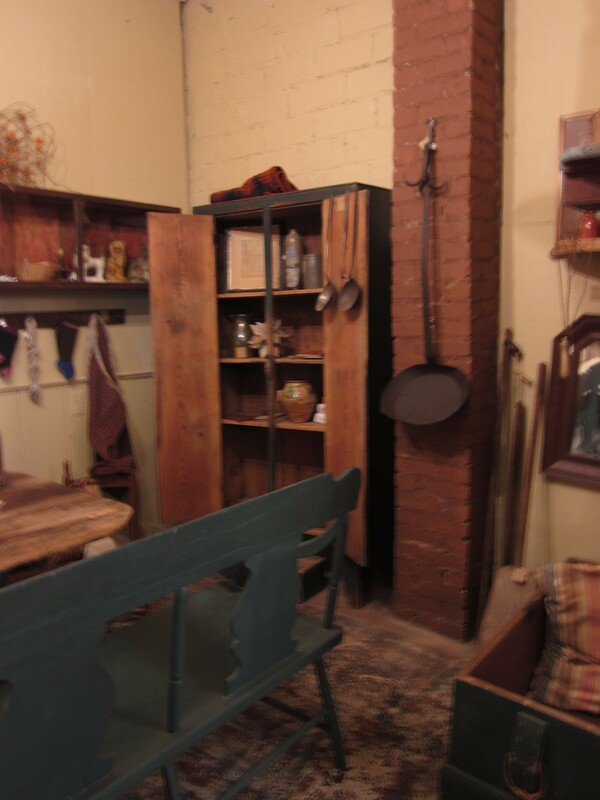 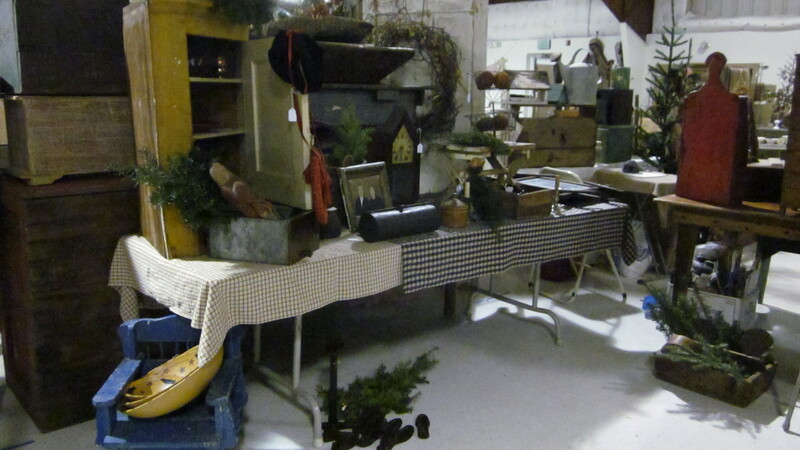 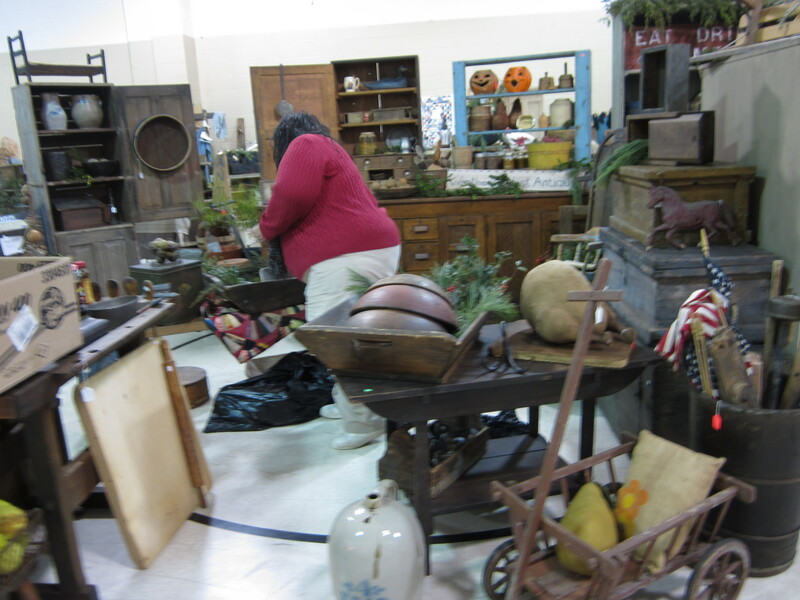 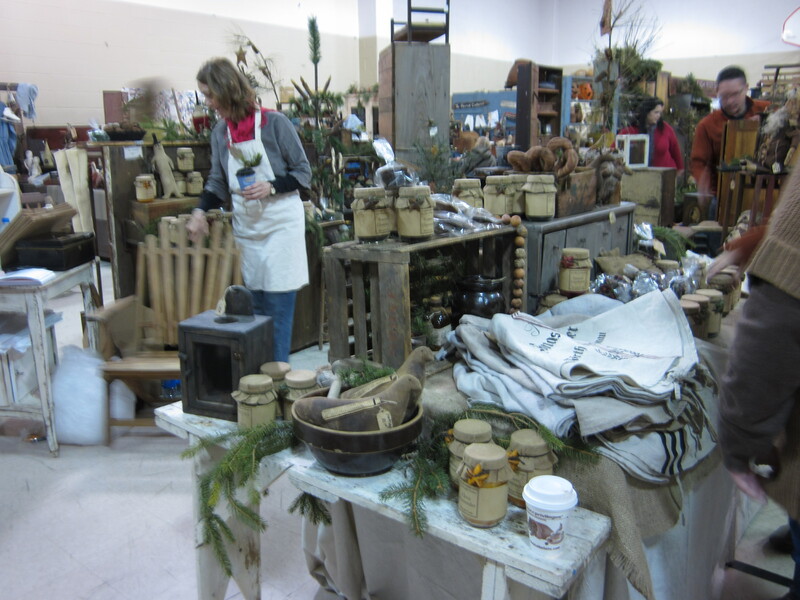 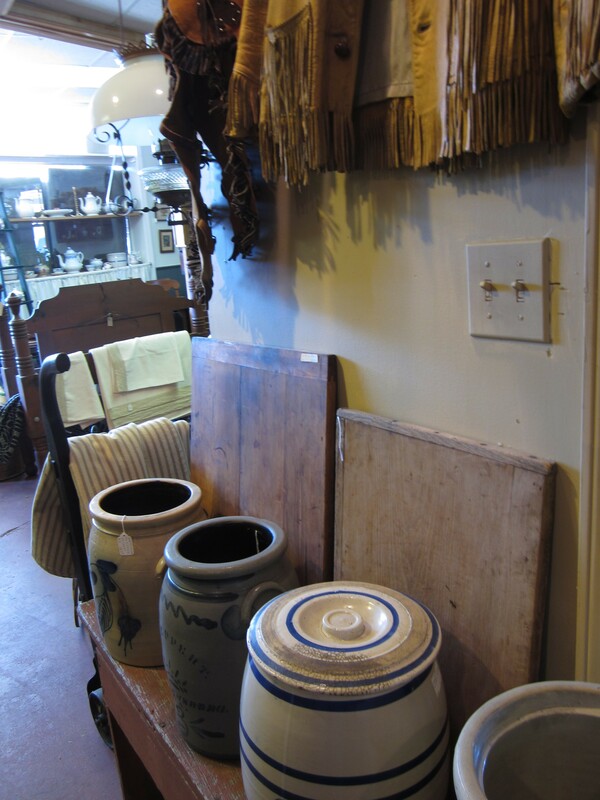 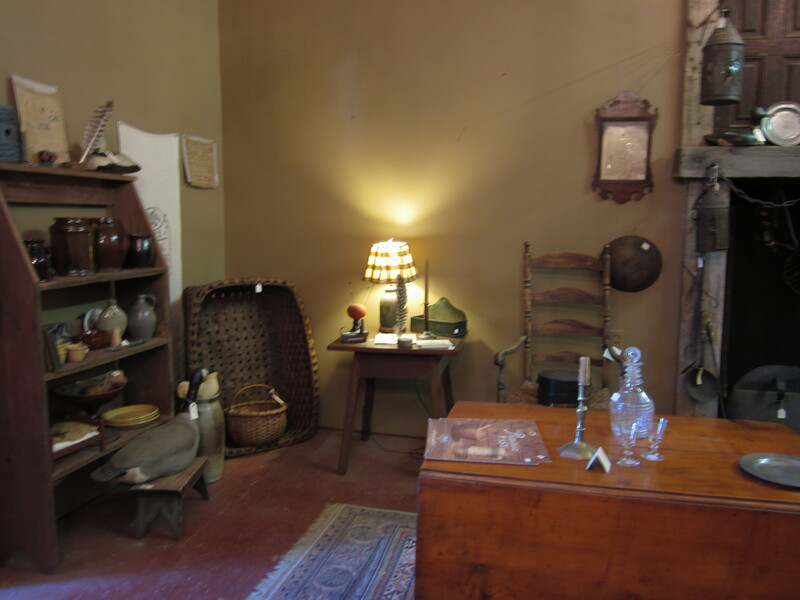 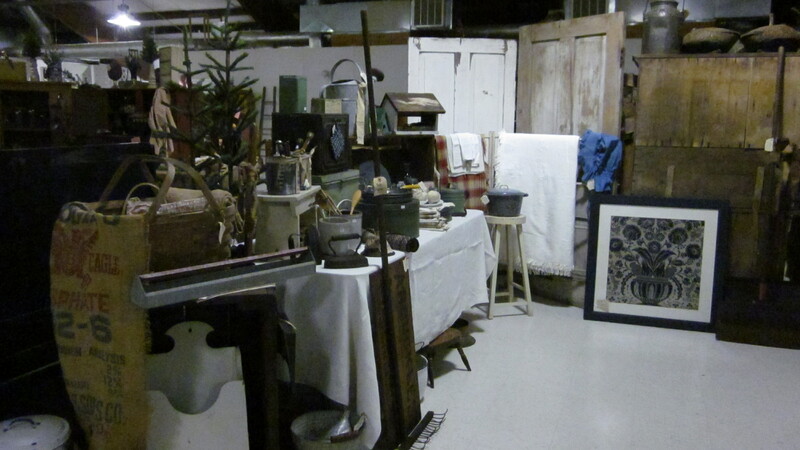 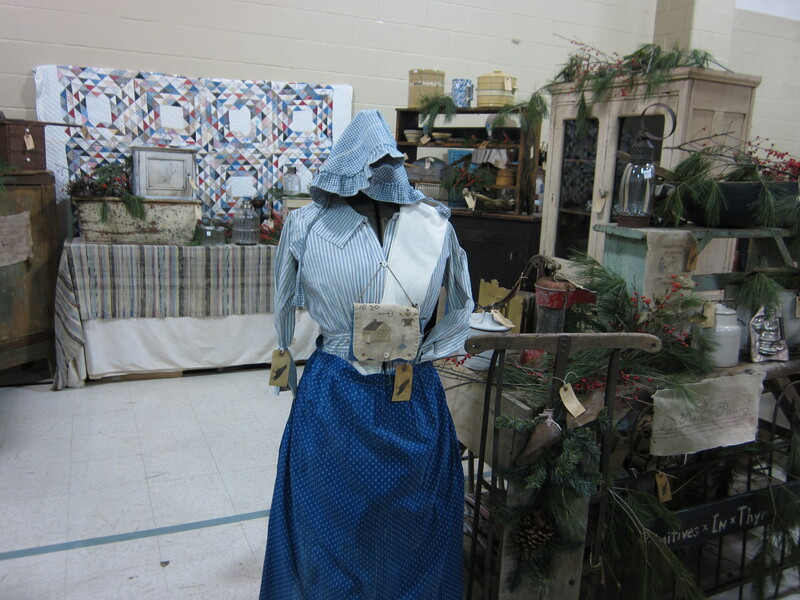 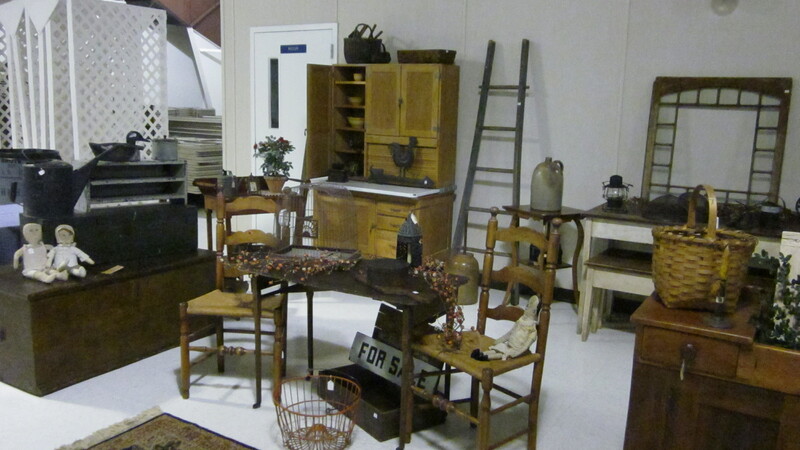 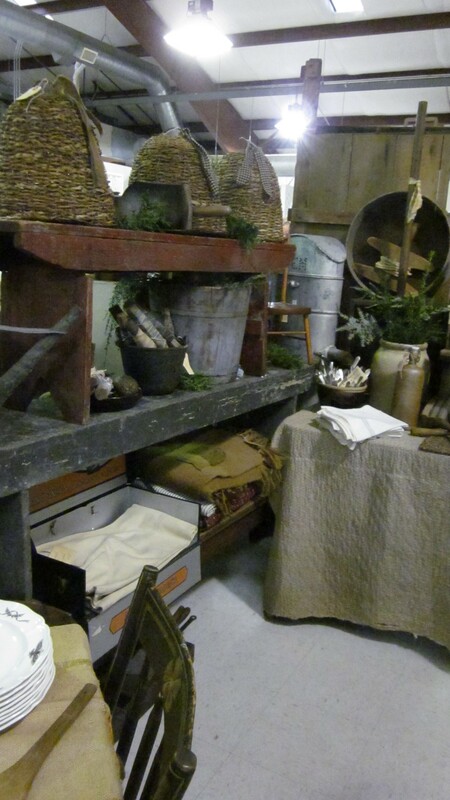 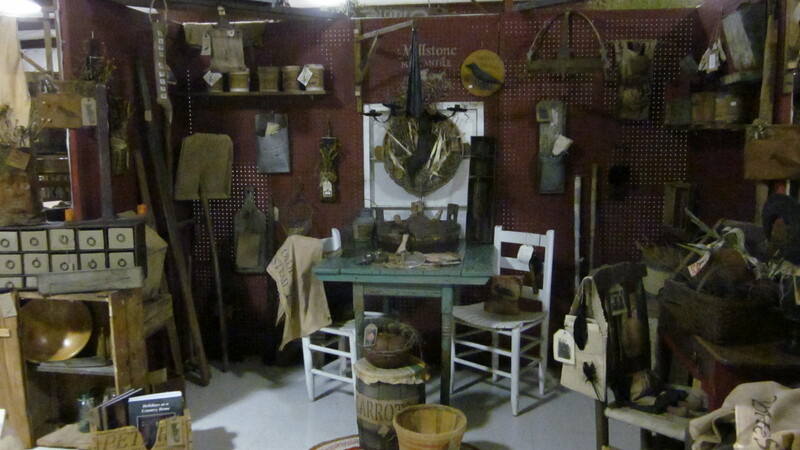 You will find a new look, lots of new merchandise and plenty of wonderful country antiques! 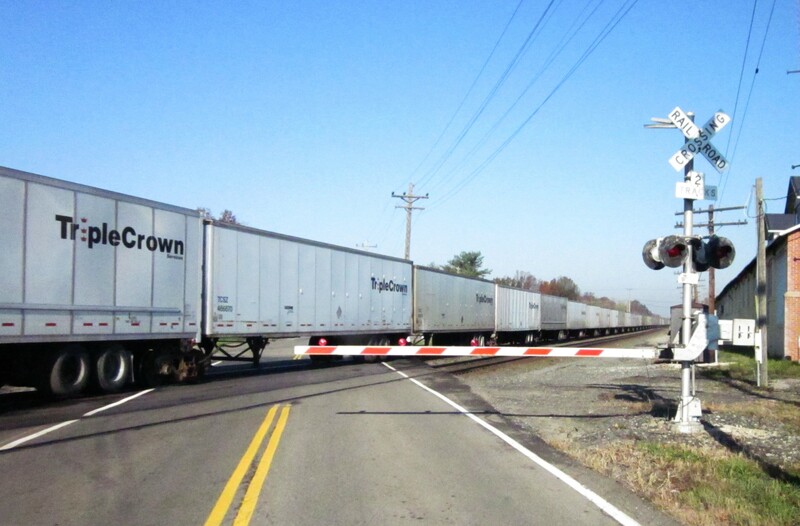 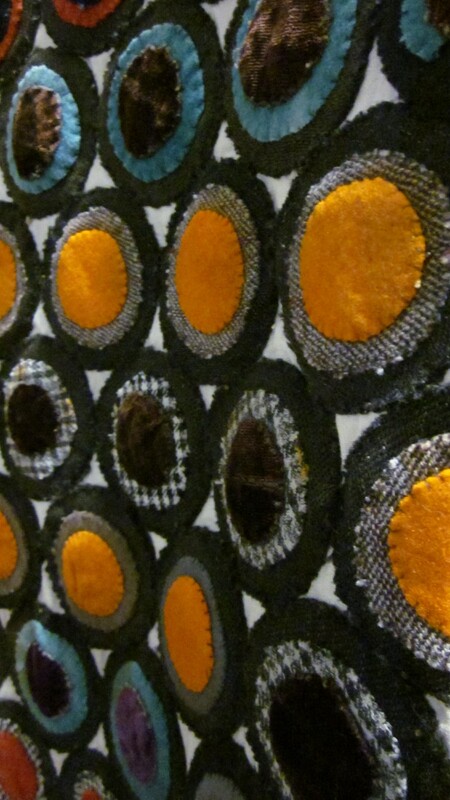 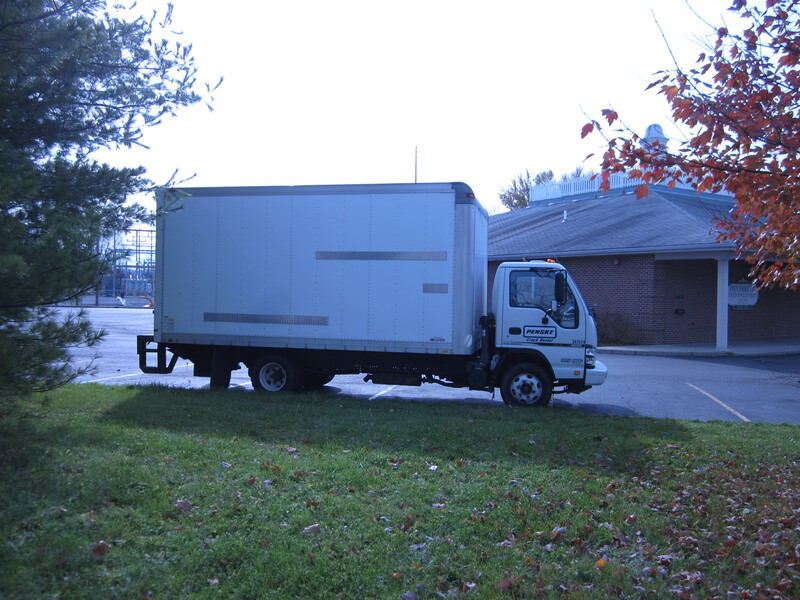 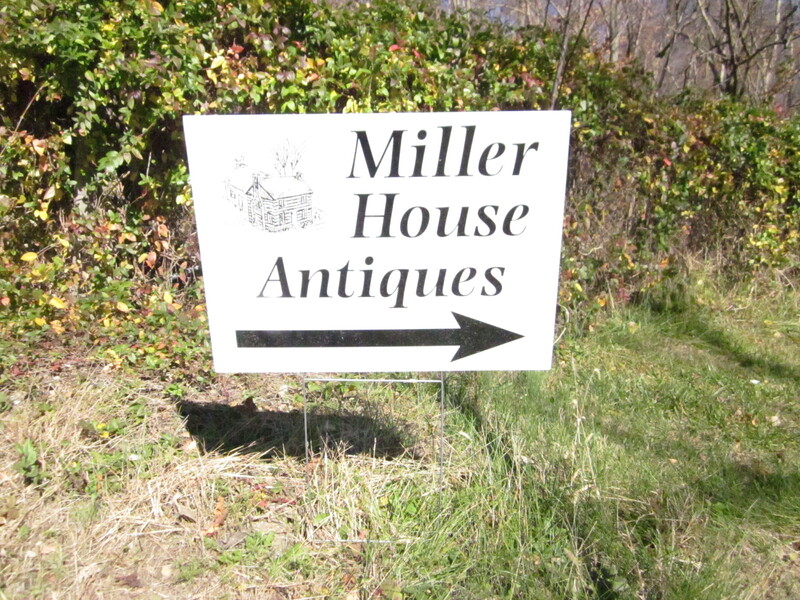 Feel free to stop by and watch our progress as we move forward… we’d love to have you! 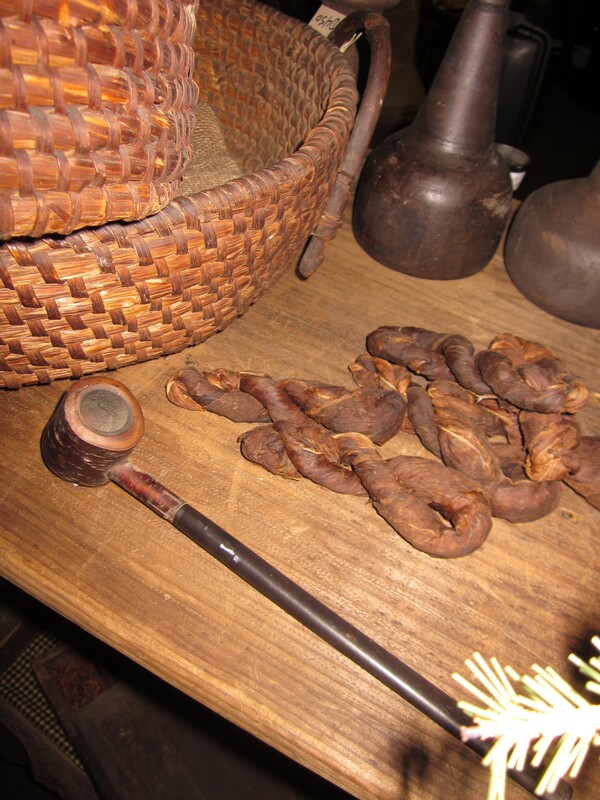 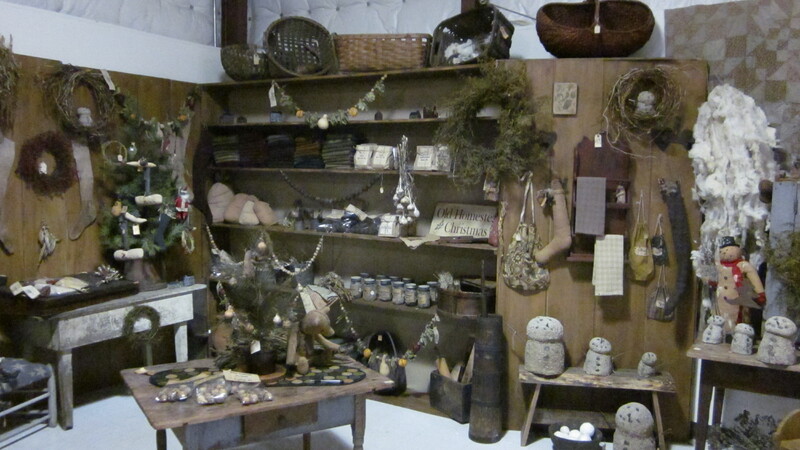 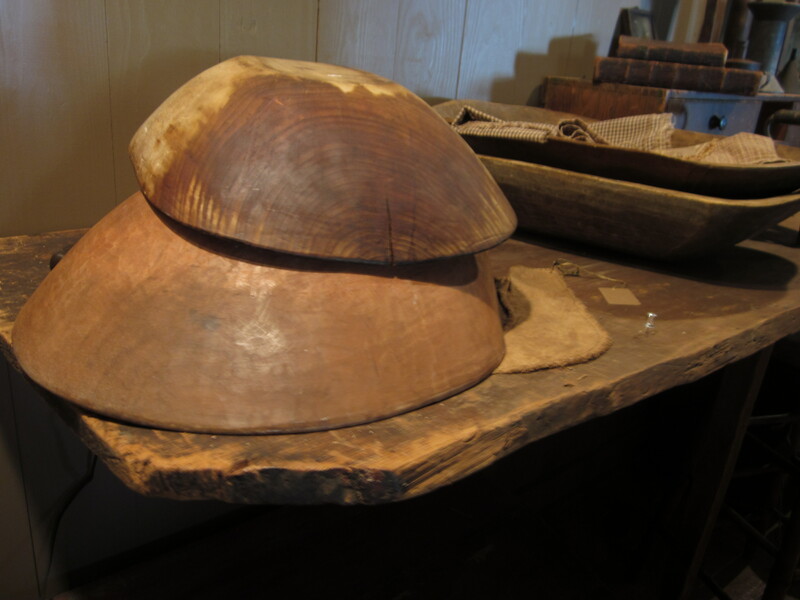 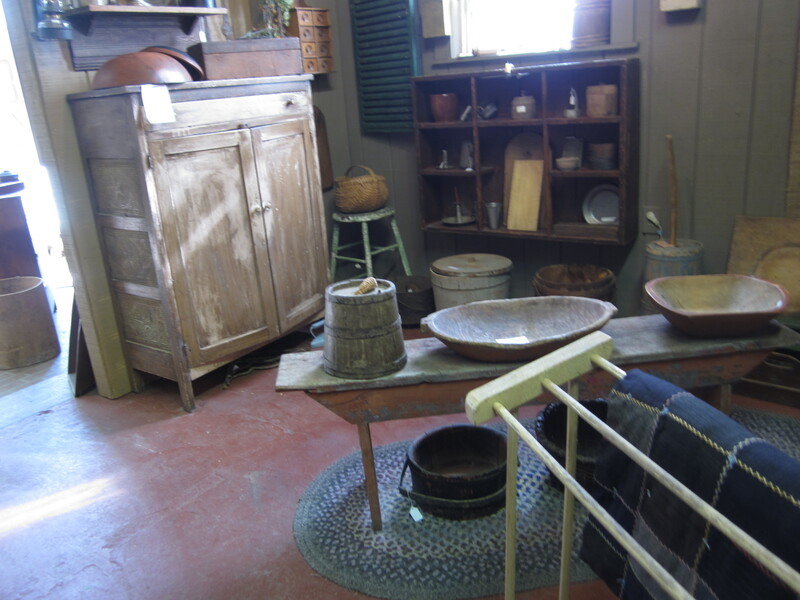 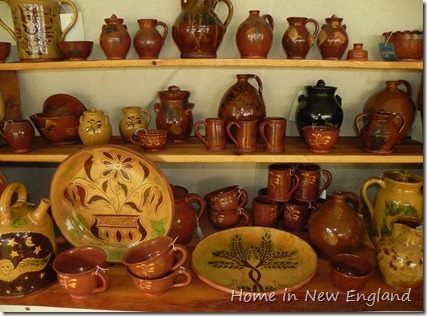 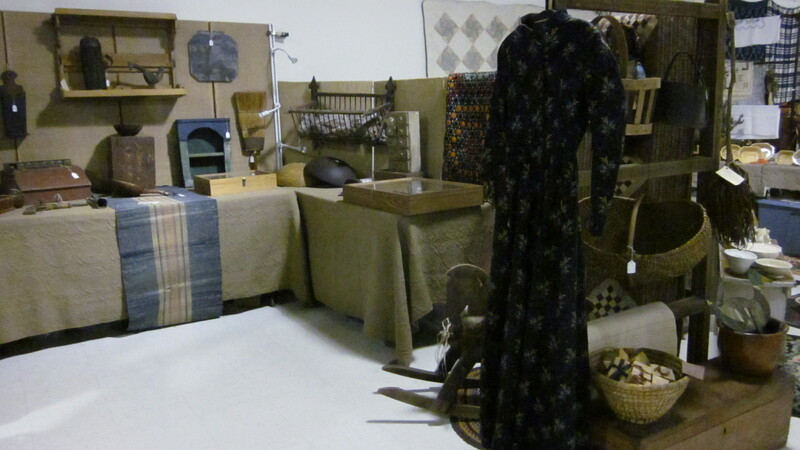 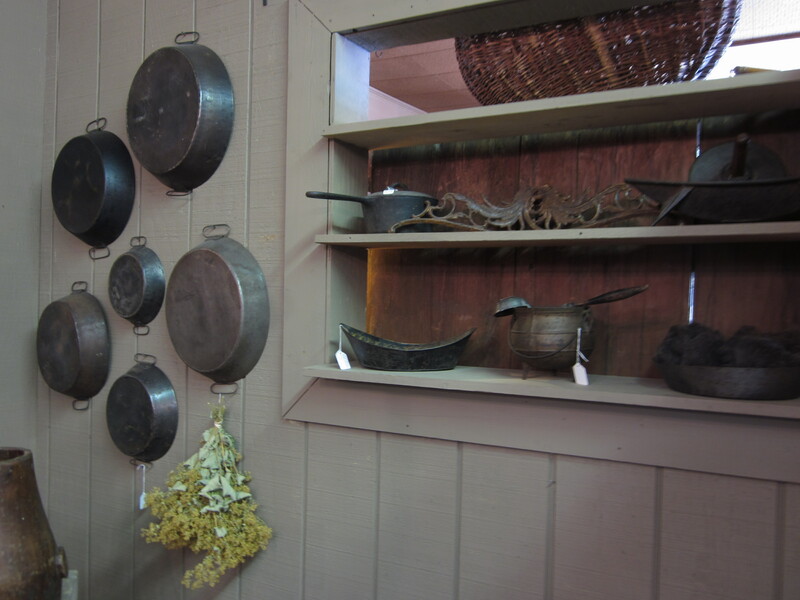 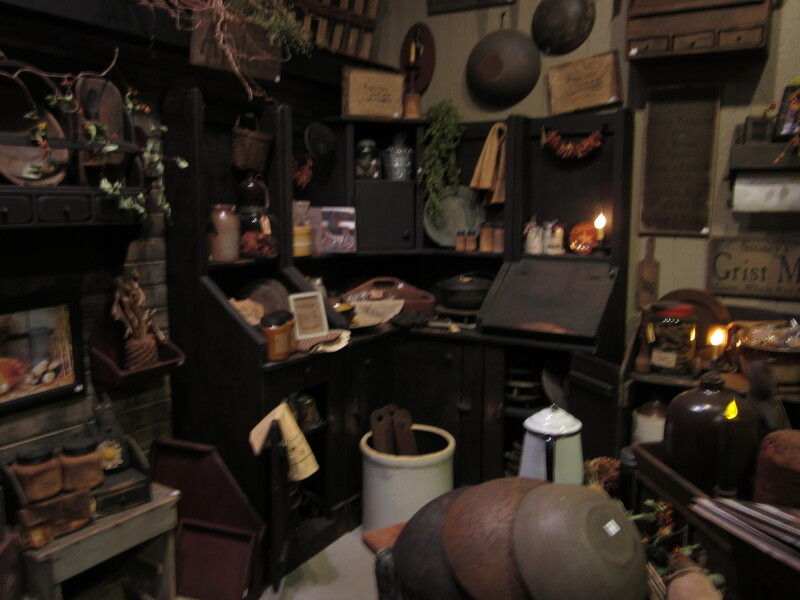 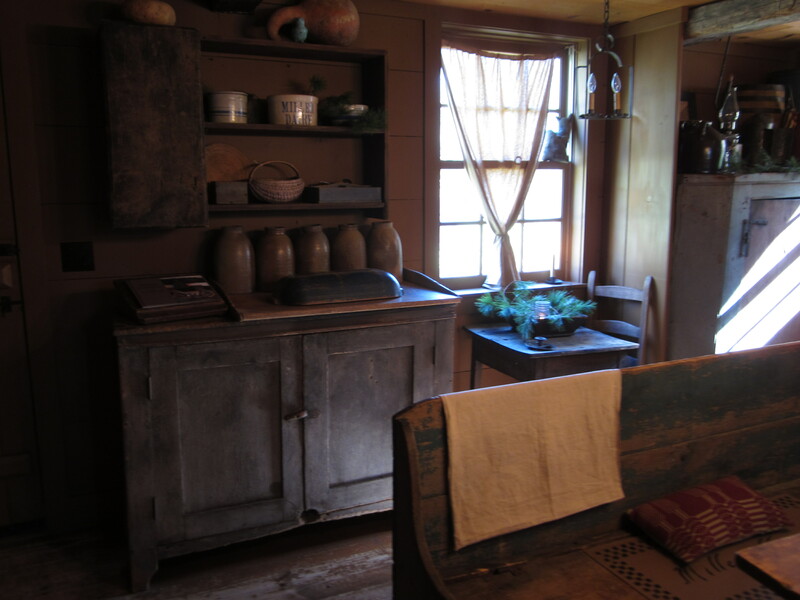 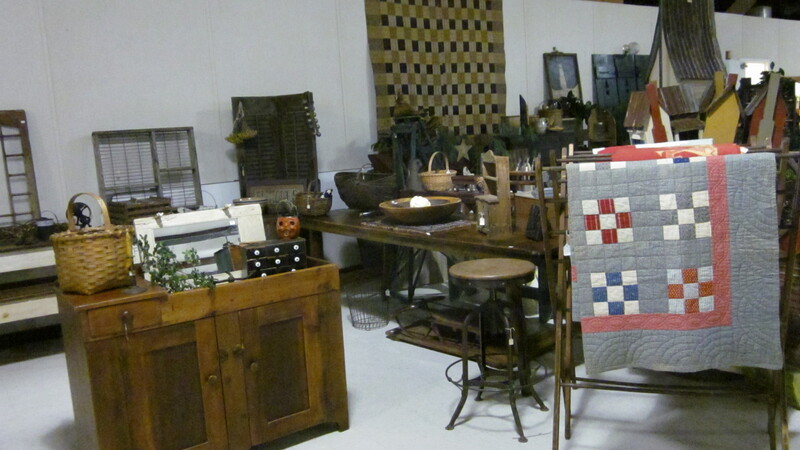 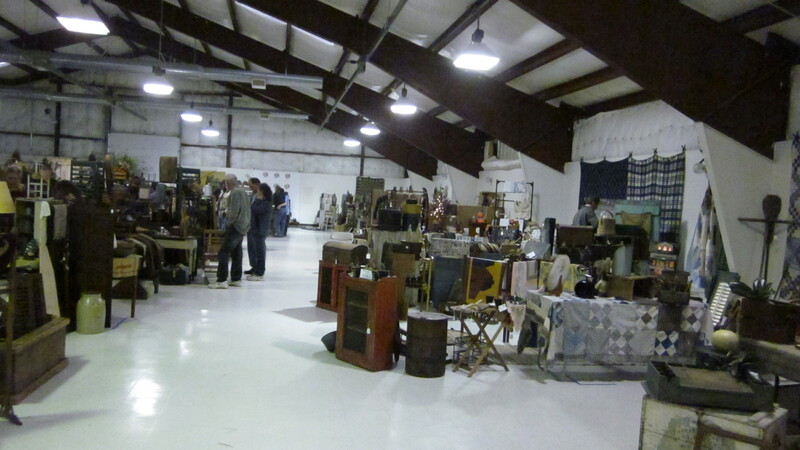 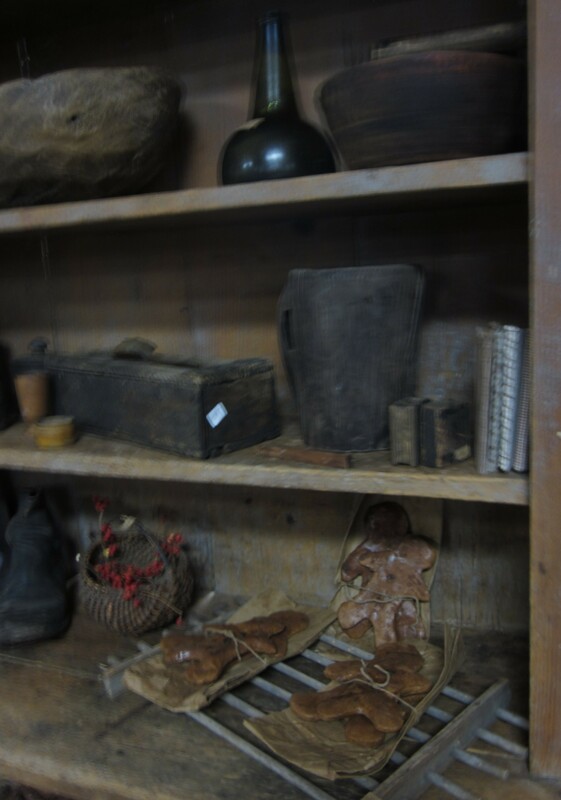 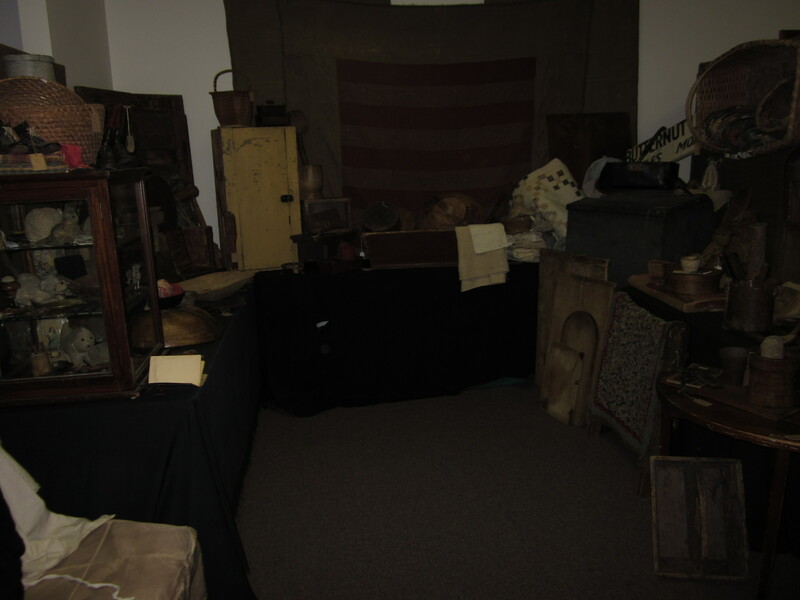 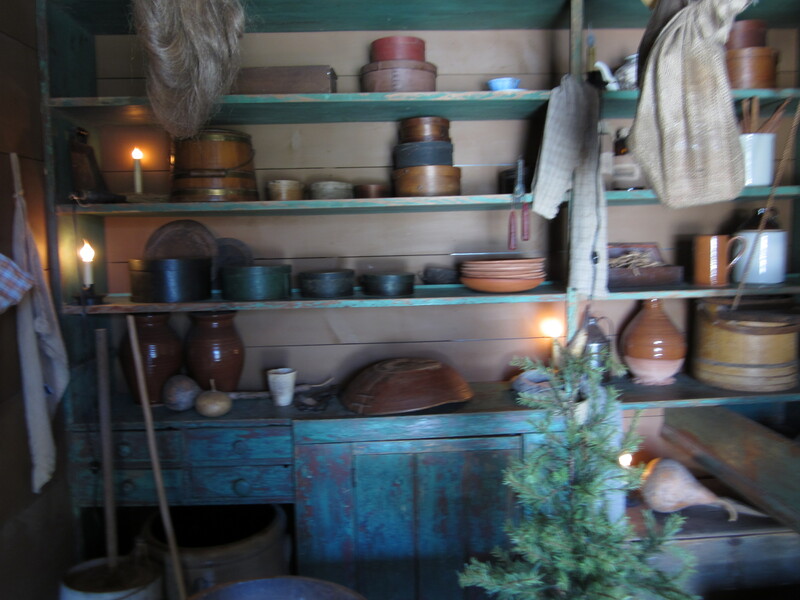 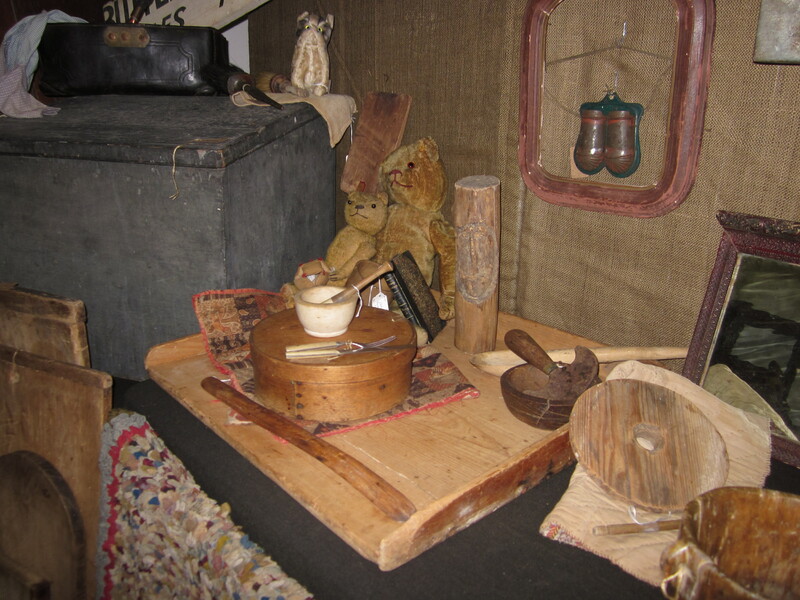 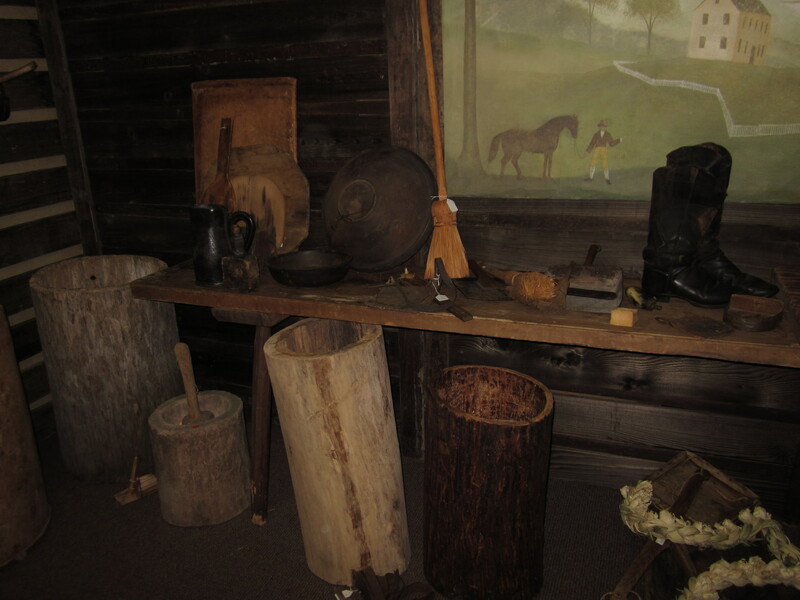 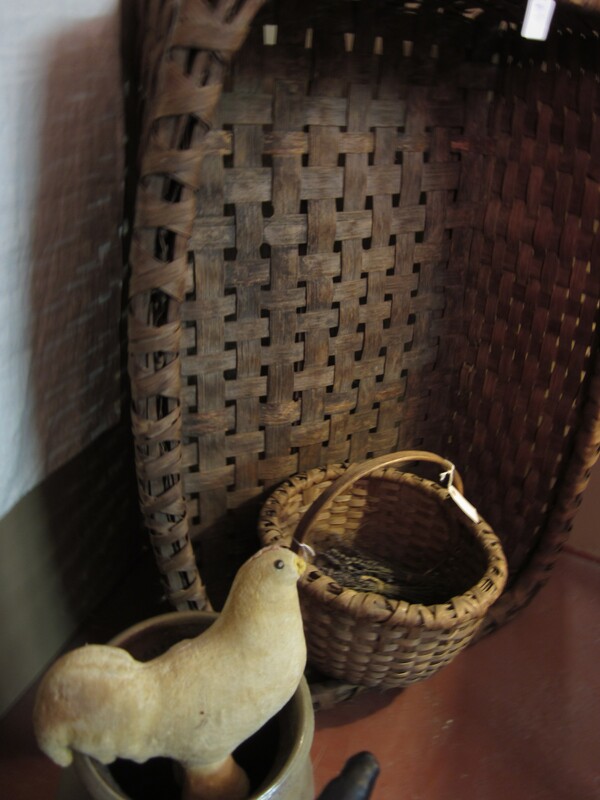 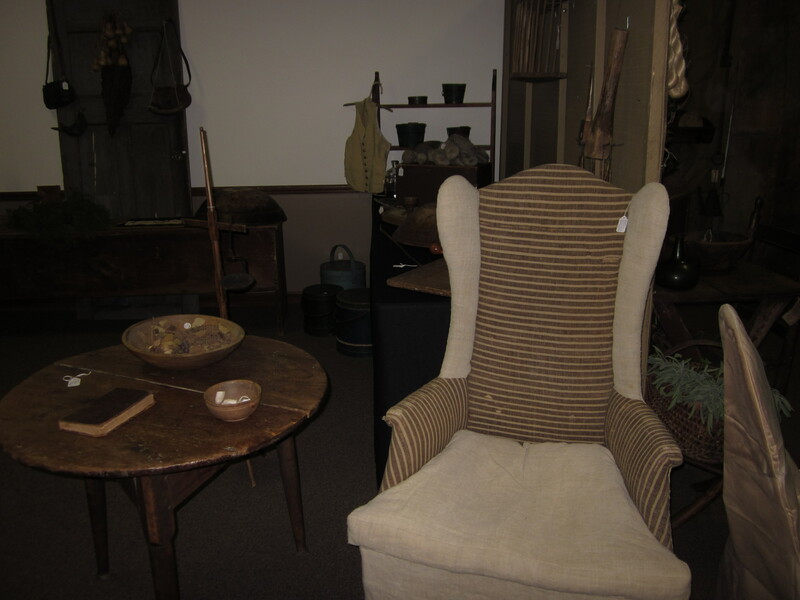 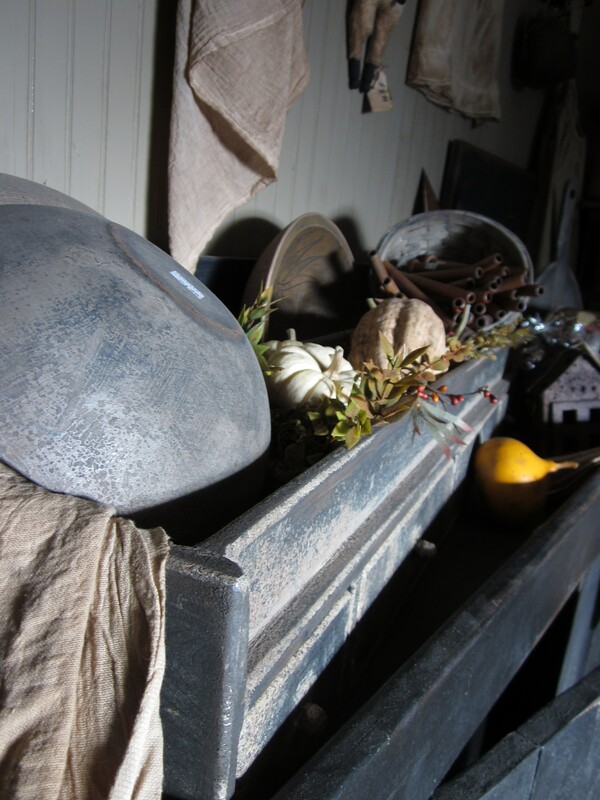 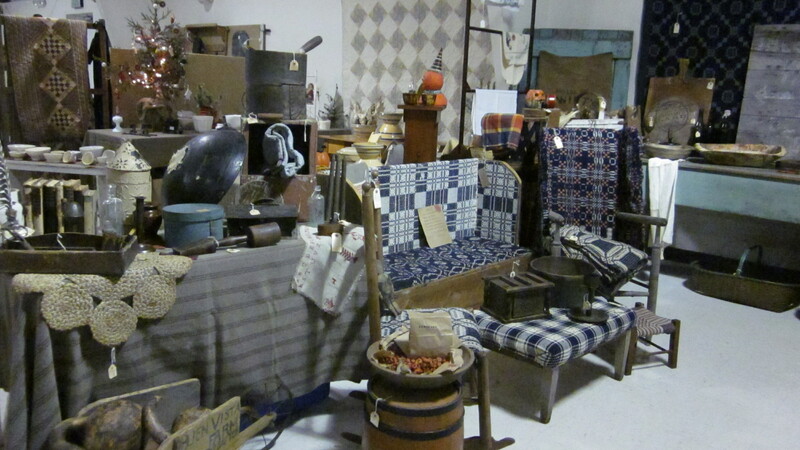 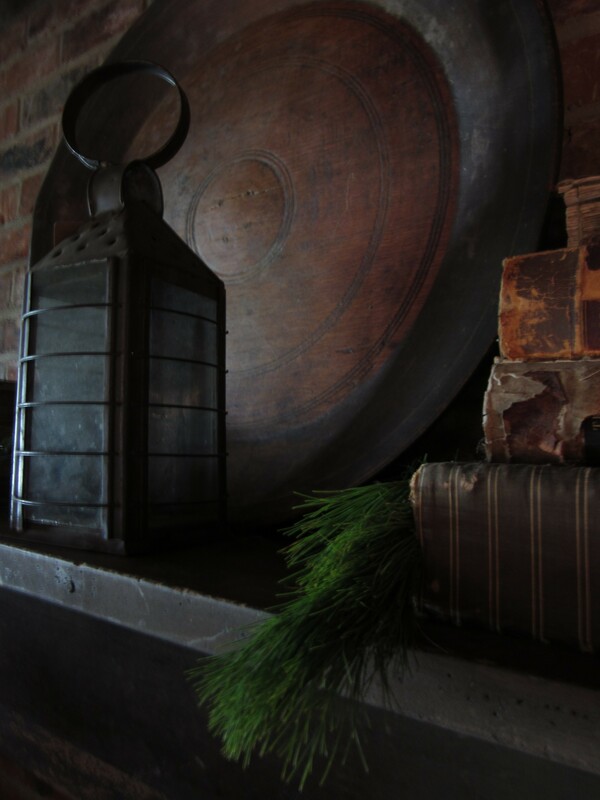 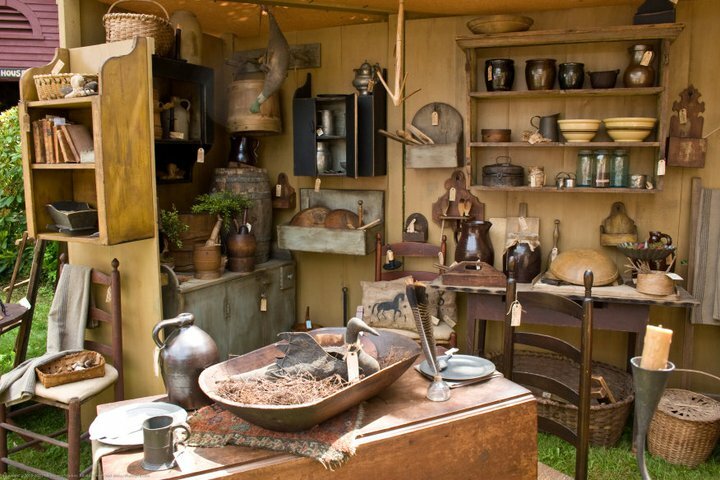 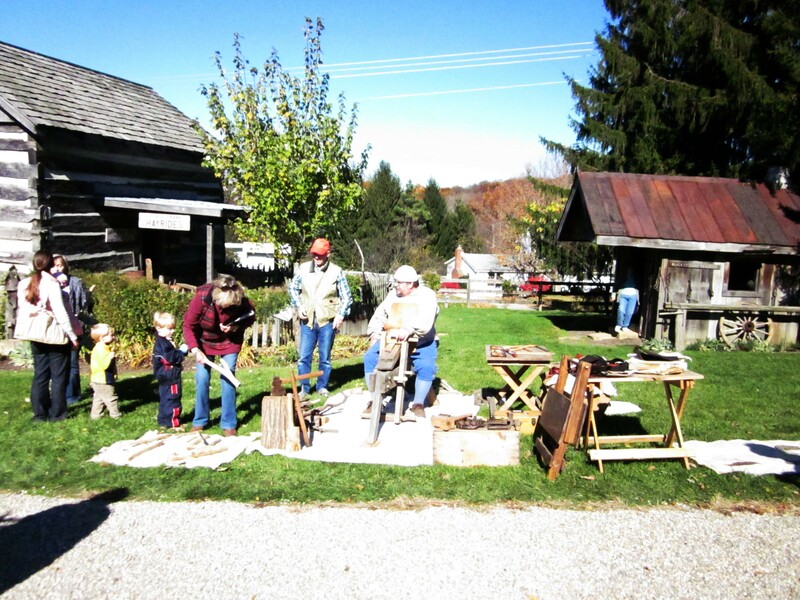 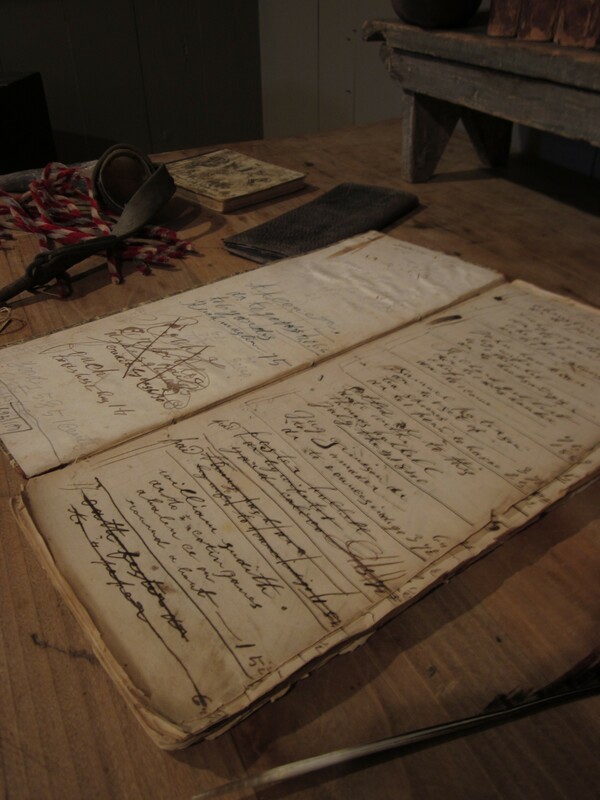 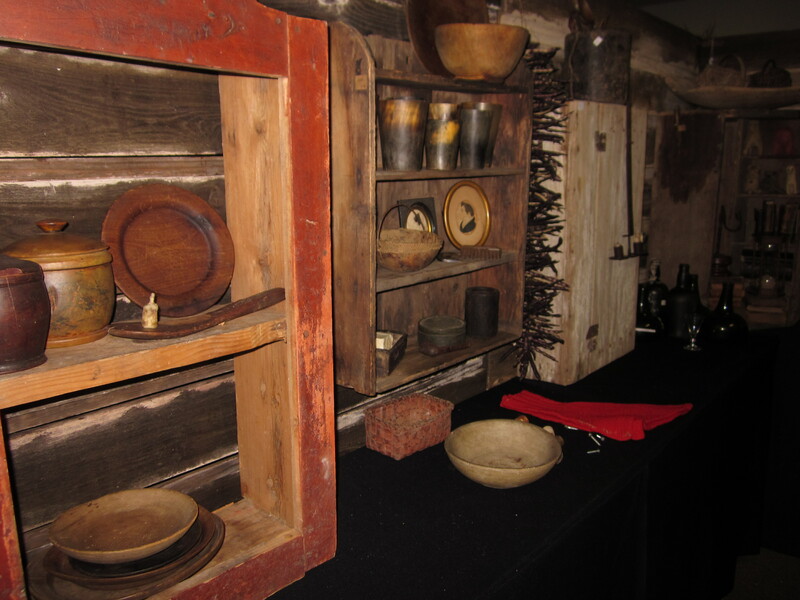 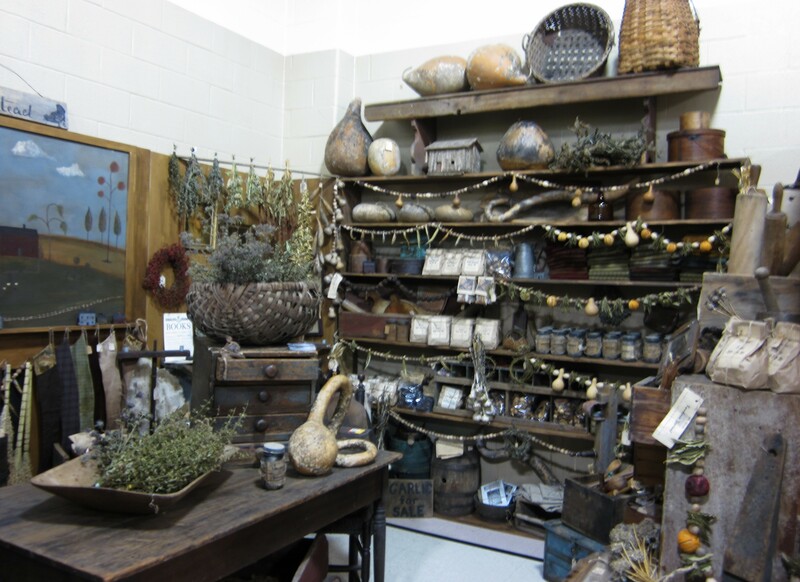 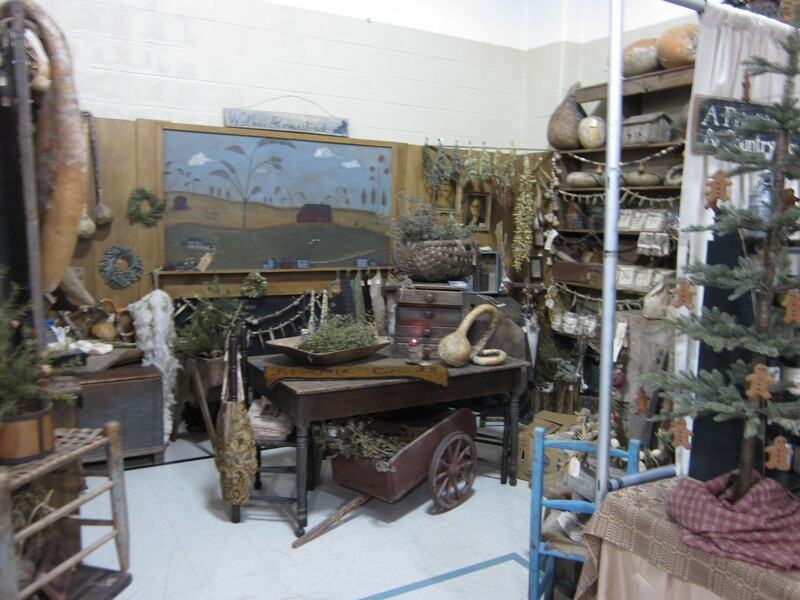 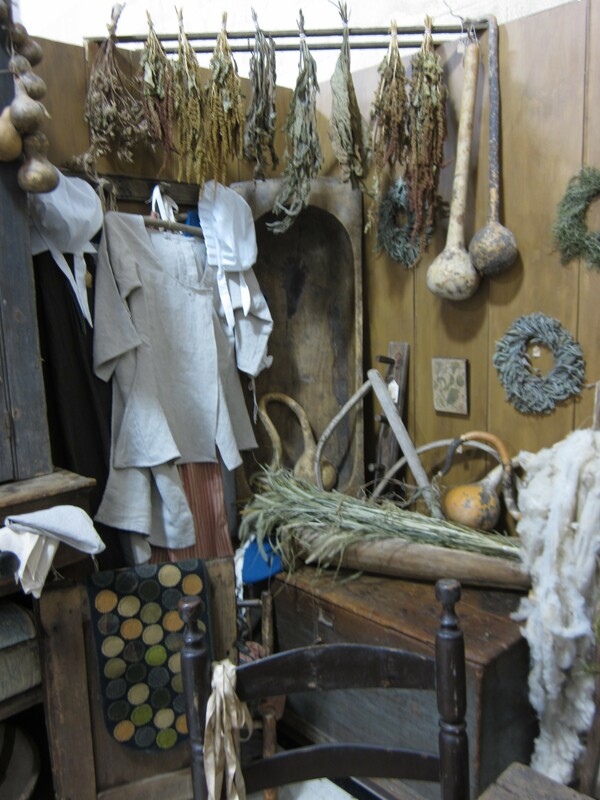 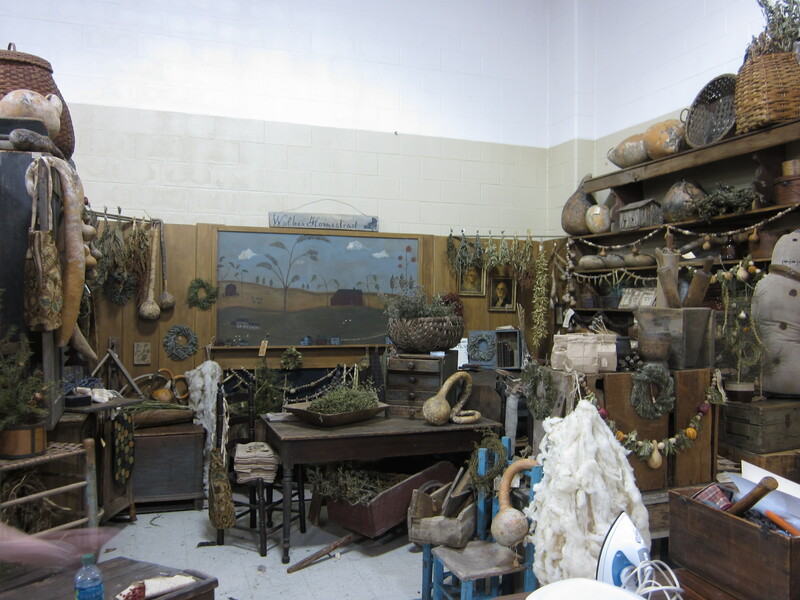 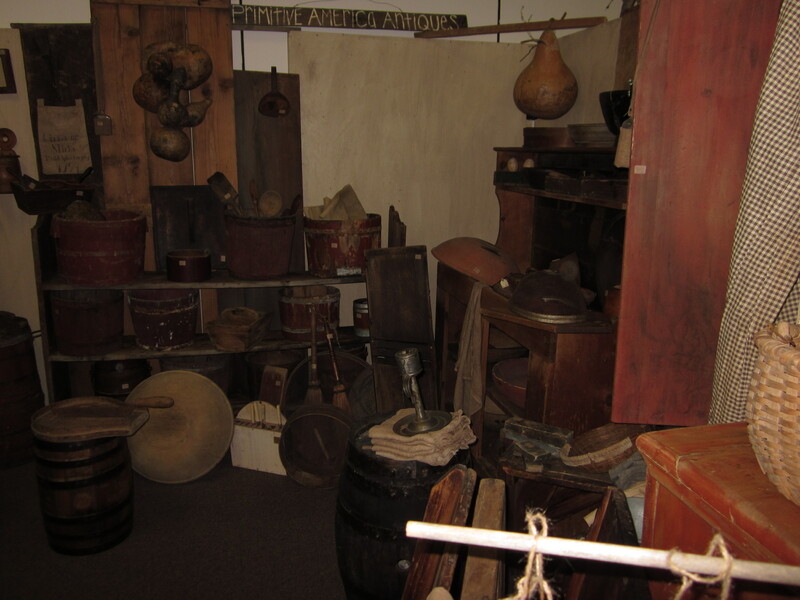 We will continue to host Walker Homestead’s Antique & Primitive Goods Show on the Saturday of Father’s Day weekend in June and the last Saturday in September (SEPTEMBER 29TH… SAVE THE DATE!). 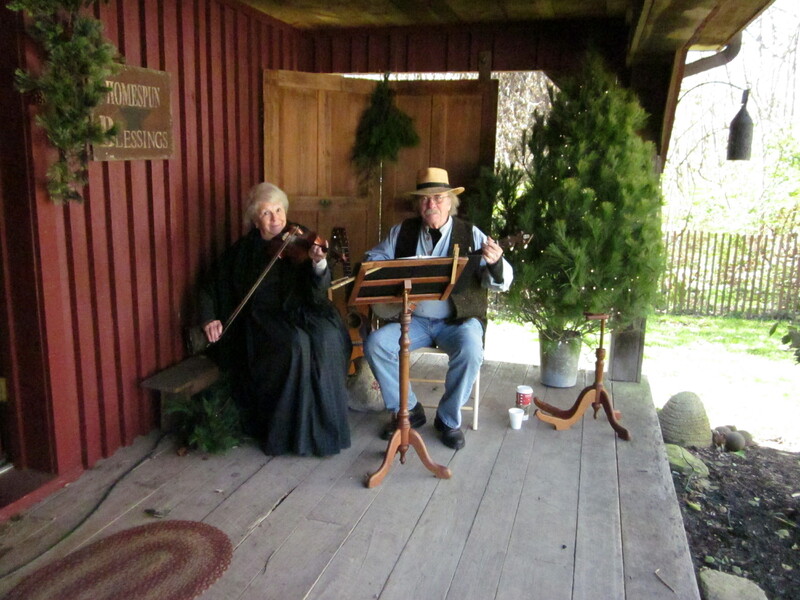 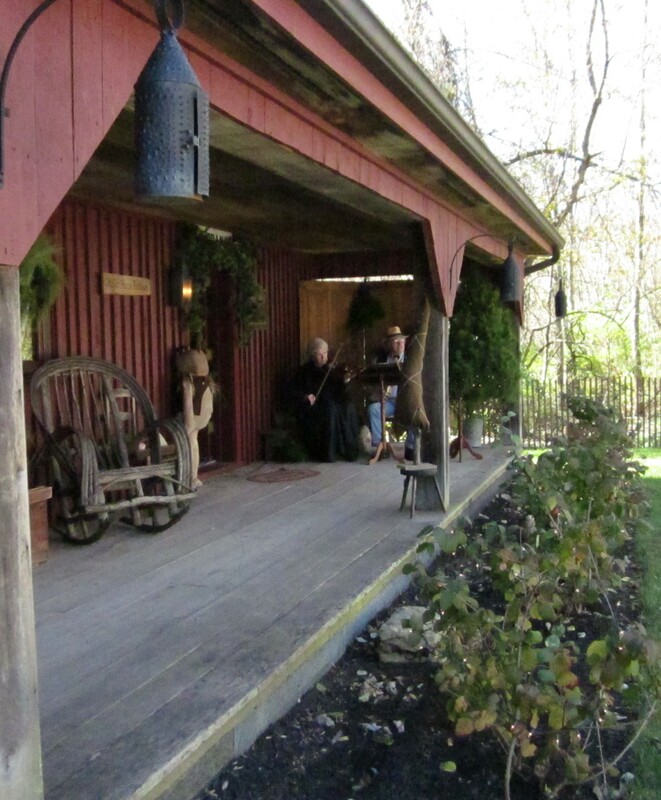 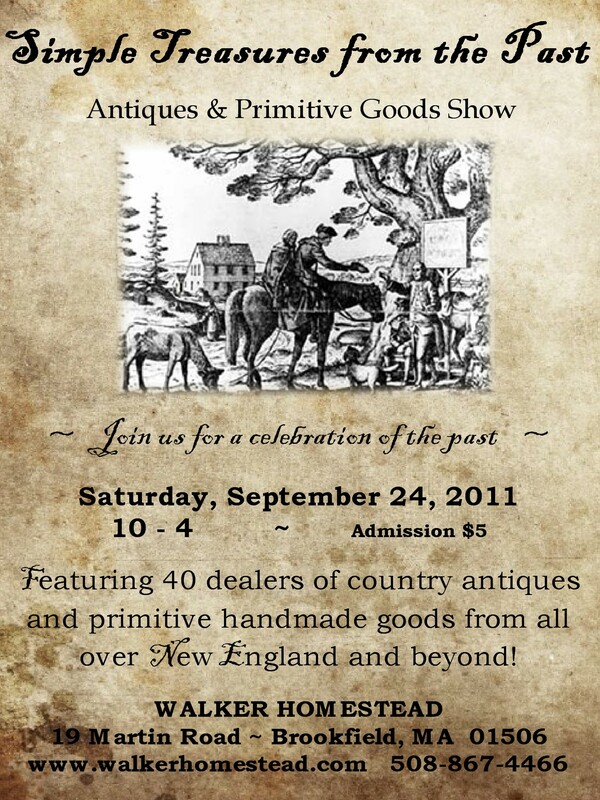 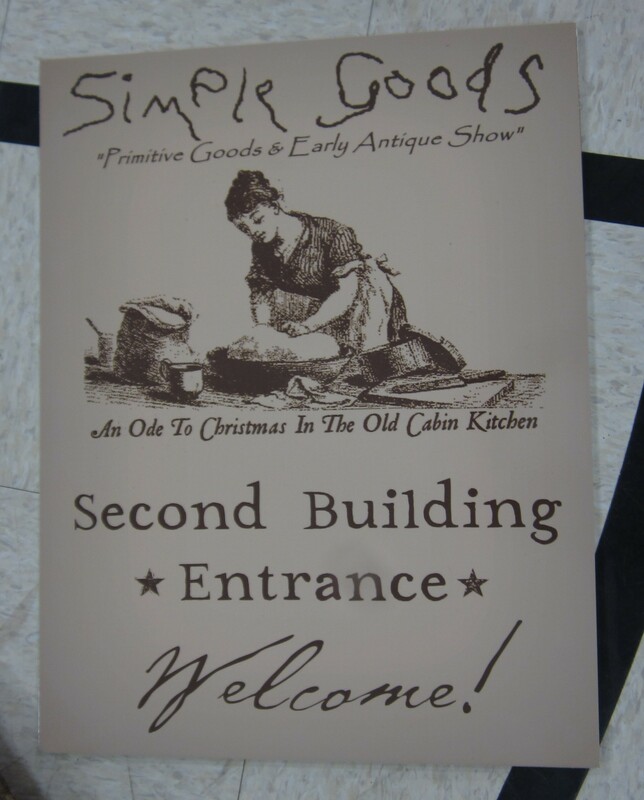 A celebration of the past, with over 40 vendors of country antiques & handmade primitive goods, live bluegrass music, food and lots of fun for all… you are encouraged to come in colonial garb, we’ll be dressed for the occasion! 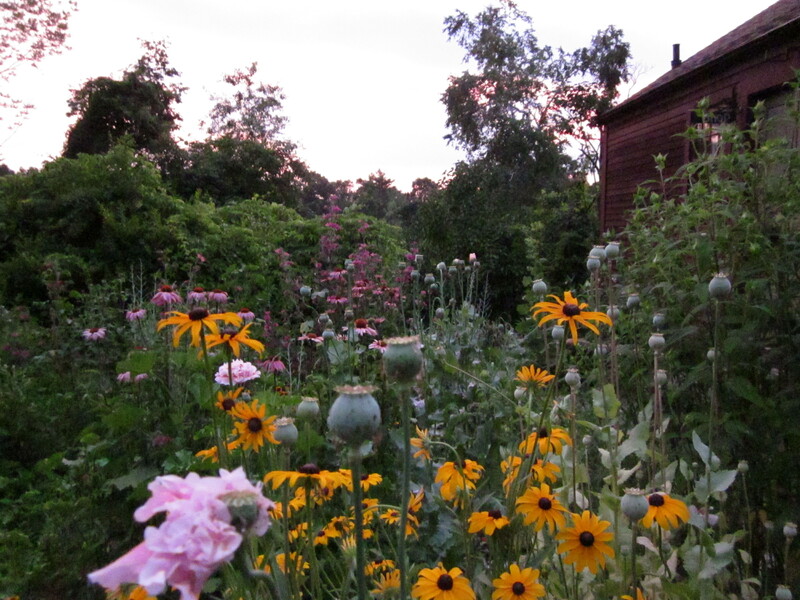 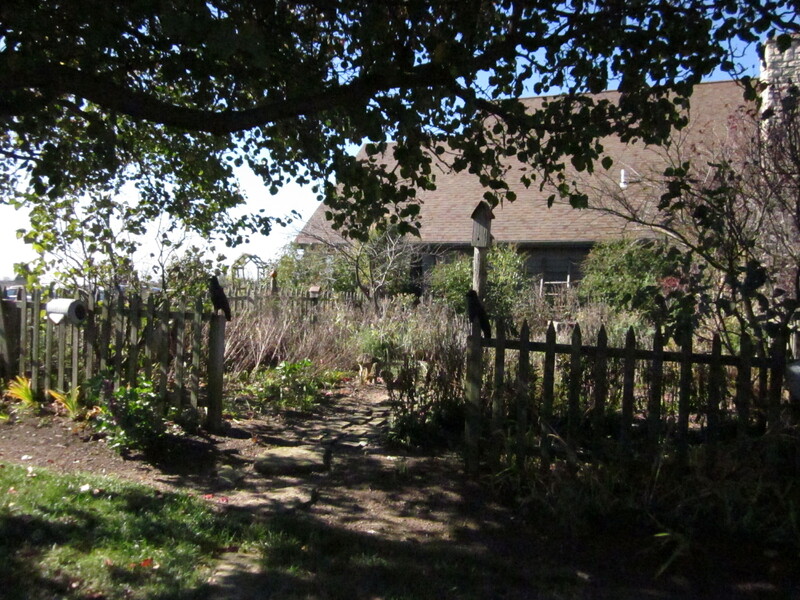 We are in the process of putting many of our potted plants to bed, but our heirloom gardens are open and you are welcome to come take a stroll, enjoy the peace & quiet of rural New England. 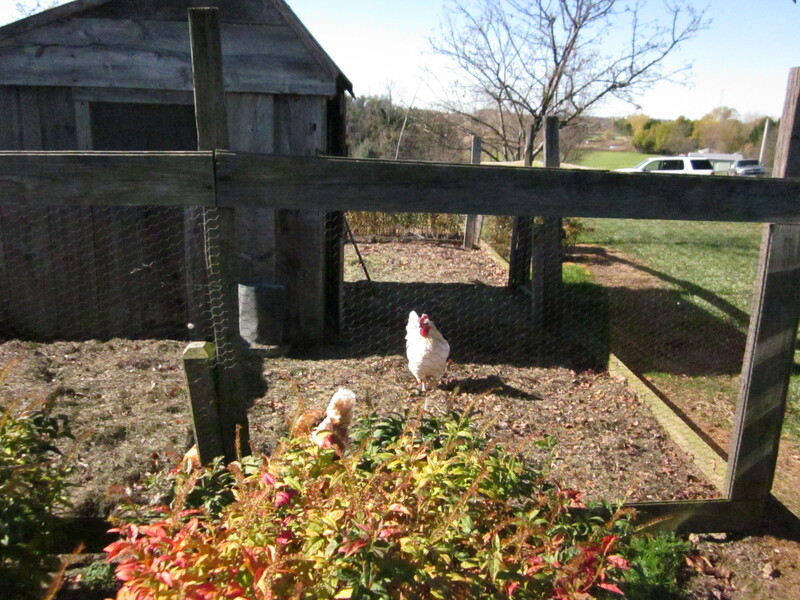 A visit with the chickens, peacocks, sheep and goats is always fun… our spring lambs are growing up and will soon be going off to new homes, but there are lots of new chicks around to entice you! 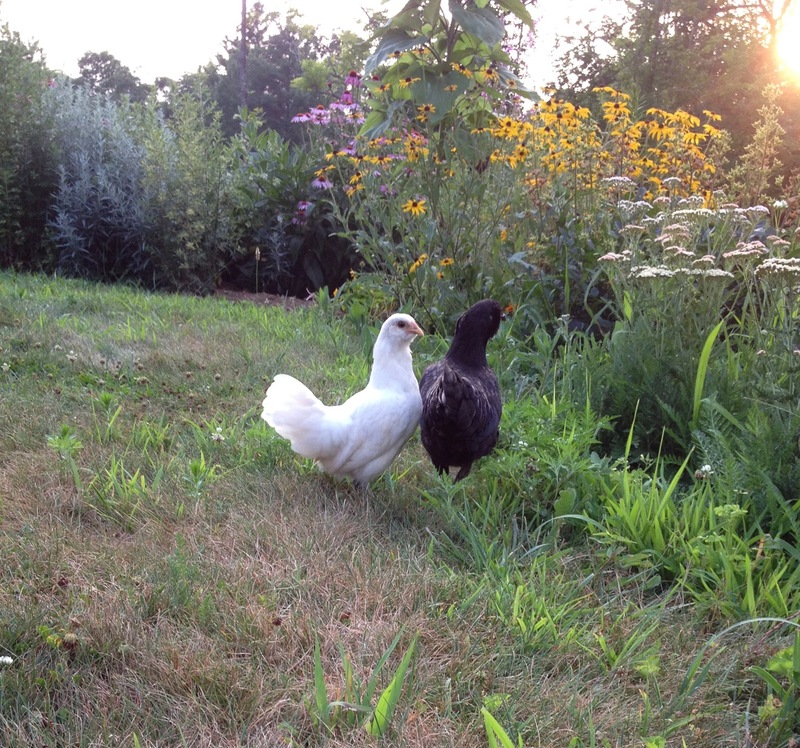 Miss Chickie became a mom this spring and you will find her wandering around the gardens with her little Pearl right at her side. 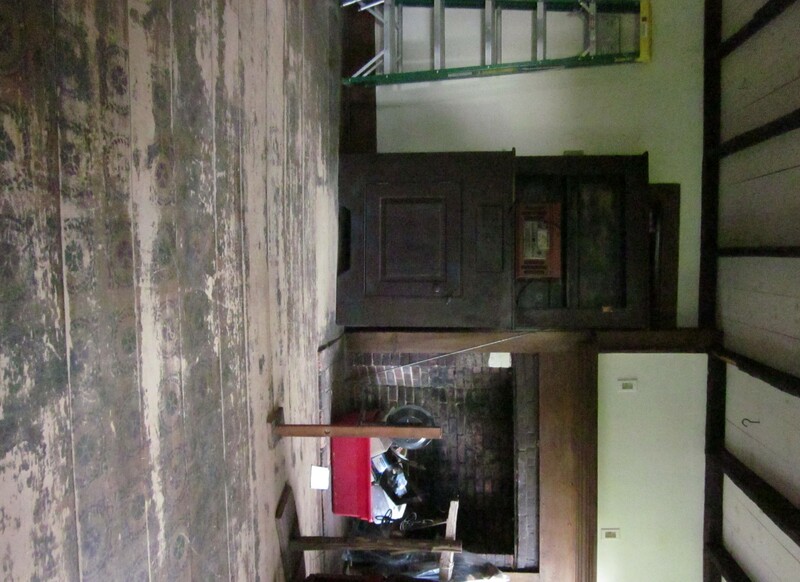 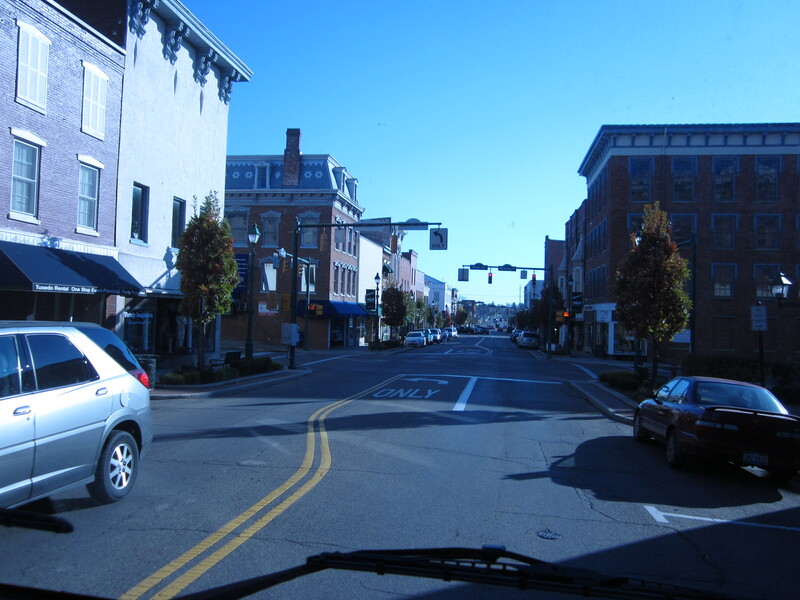 I will continue to update you on our progress and Paul & I look forward to your visits with great anticipation. 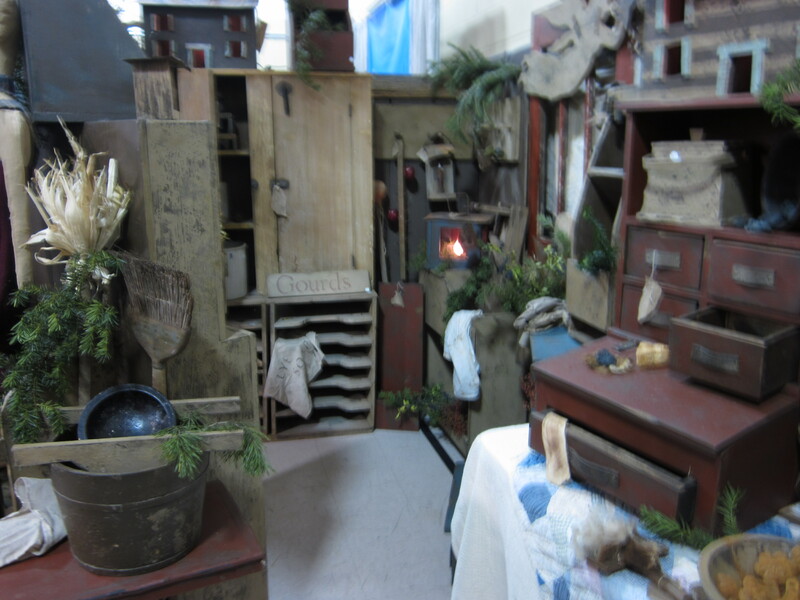 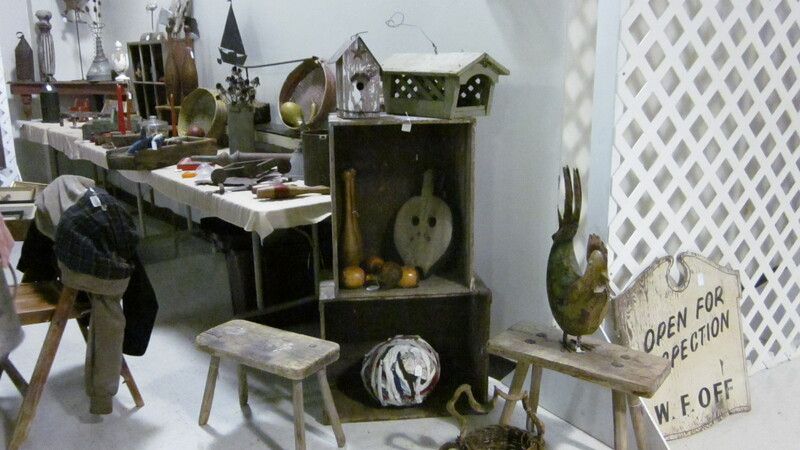 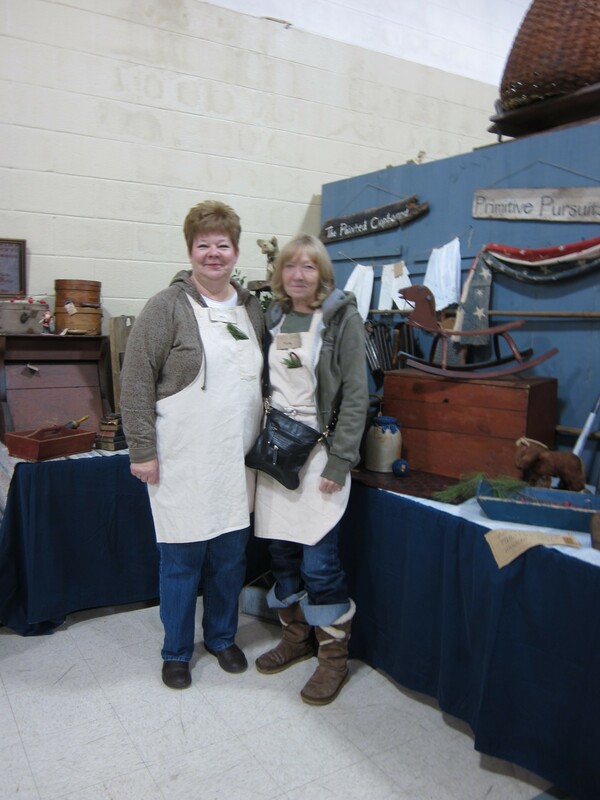 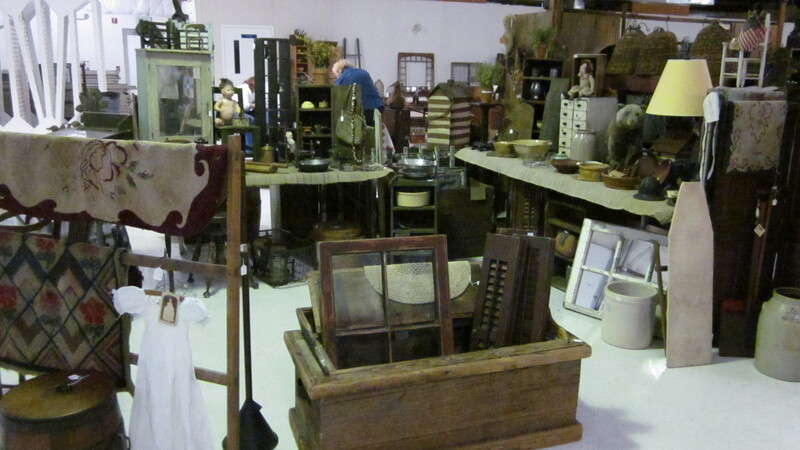 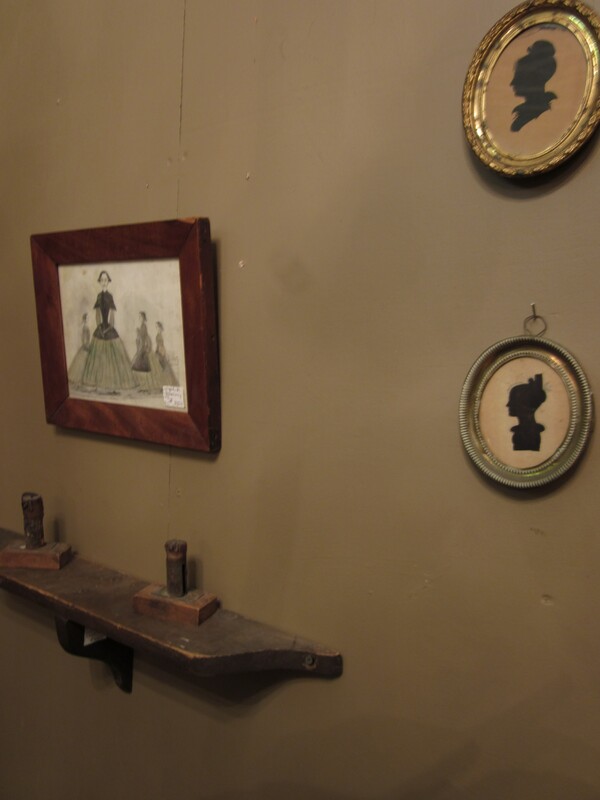 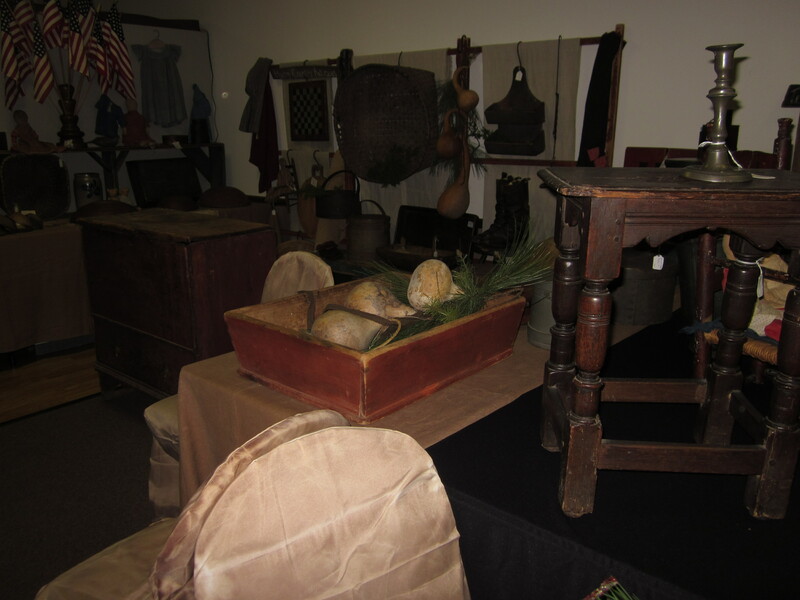 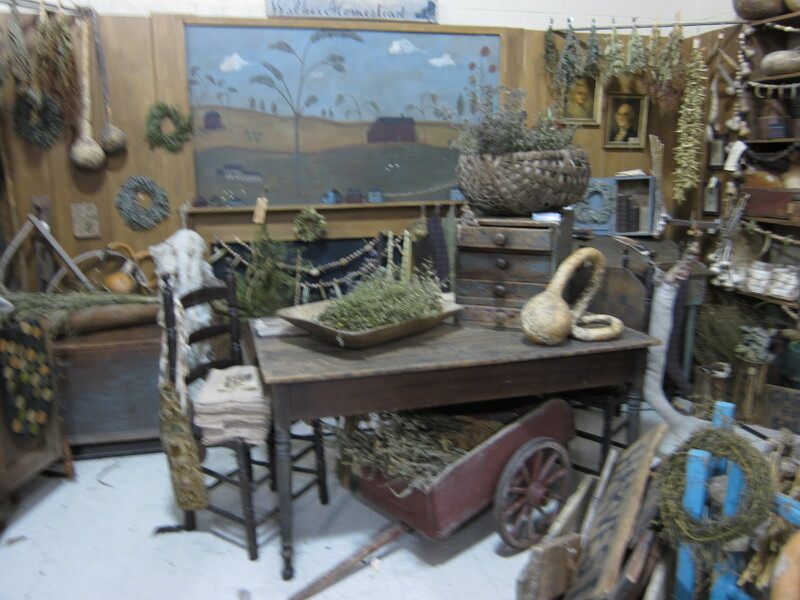 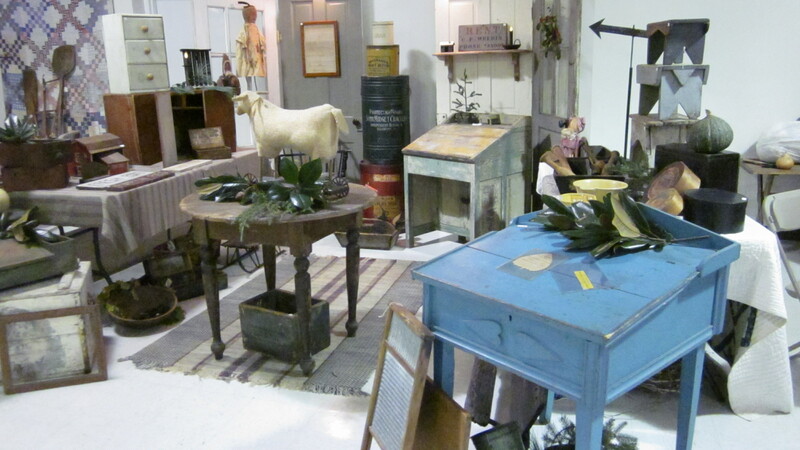 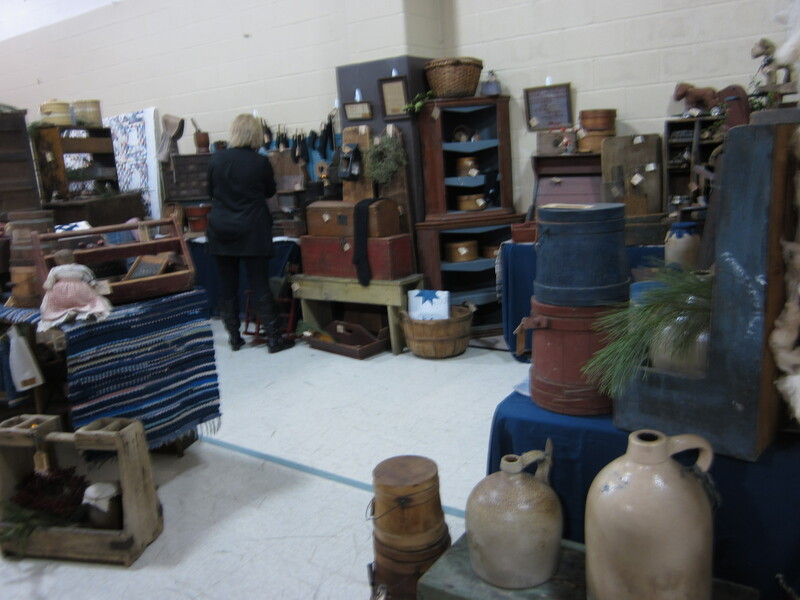 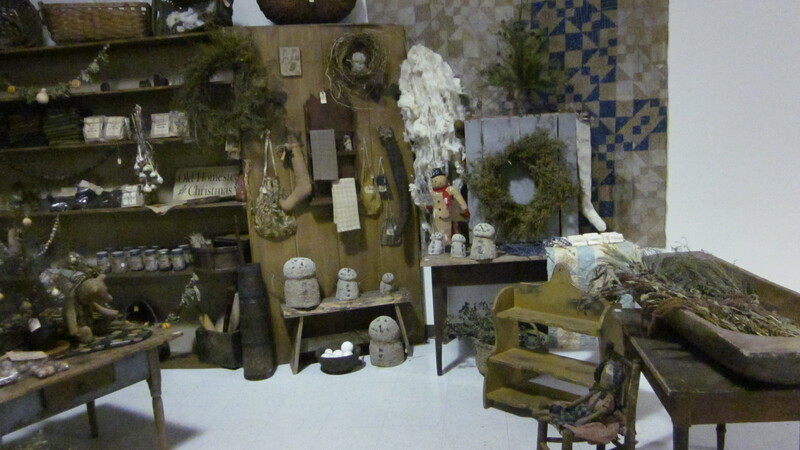 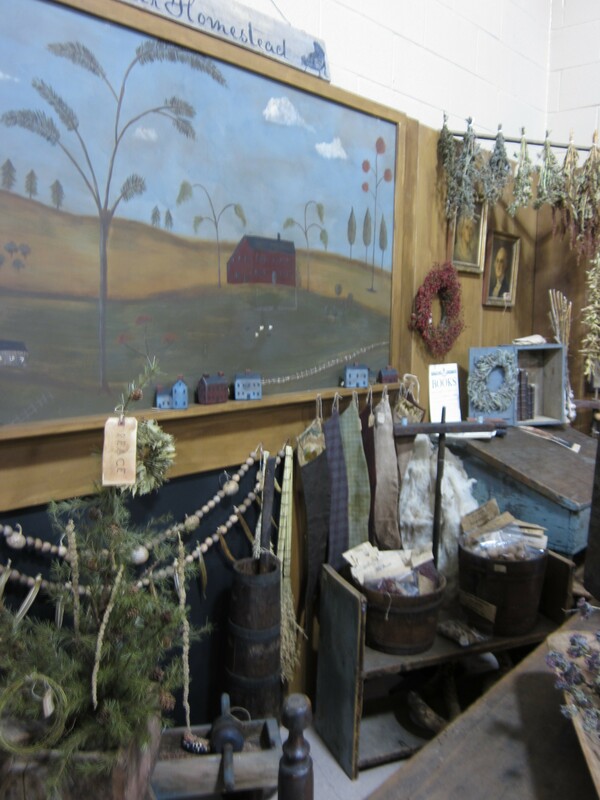 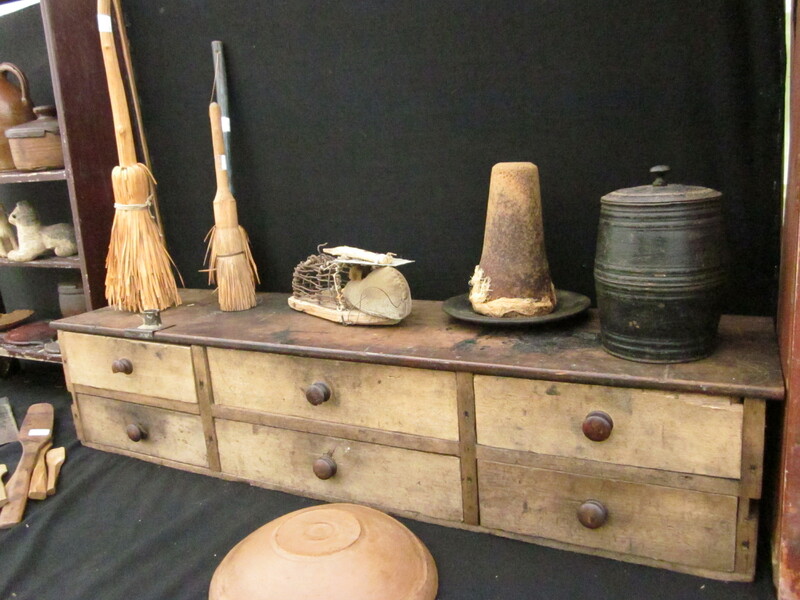 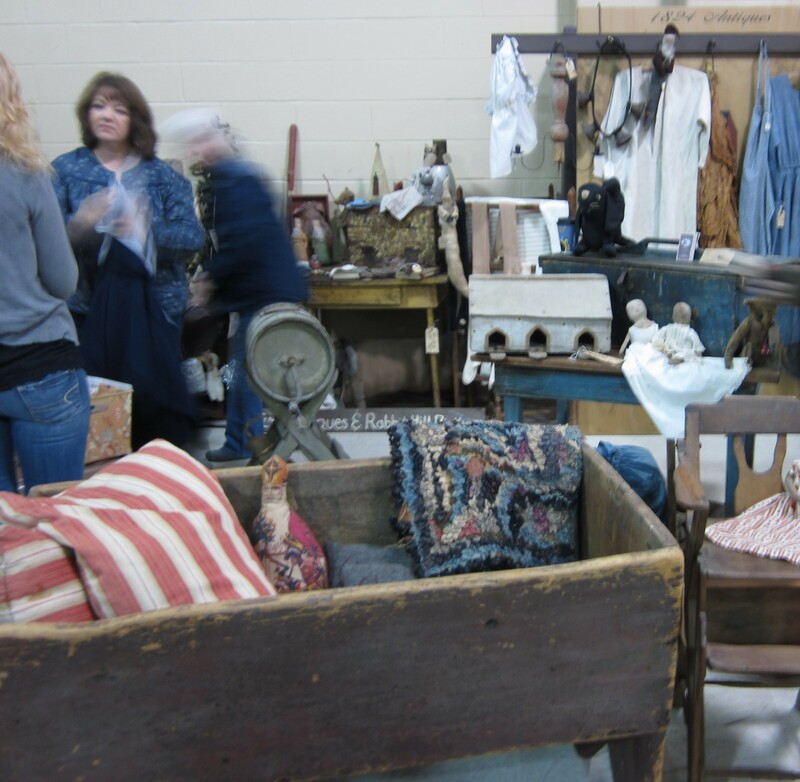 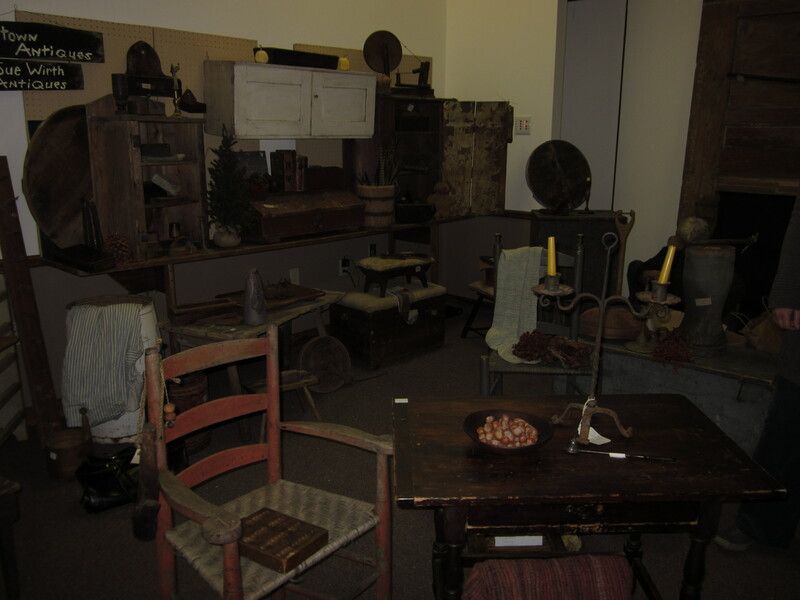 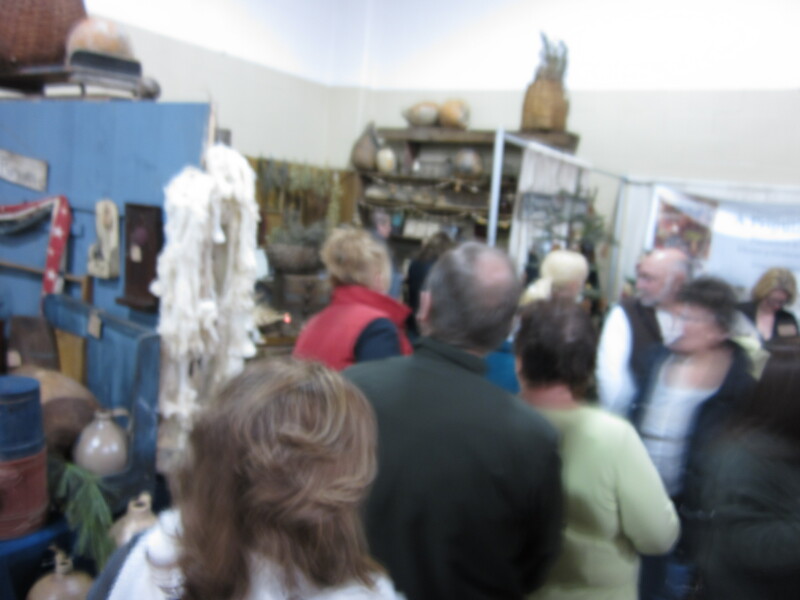 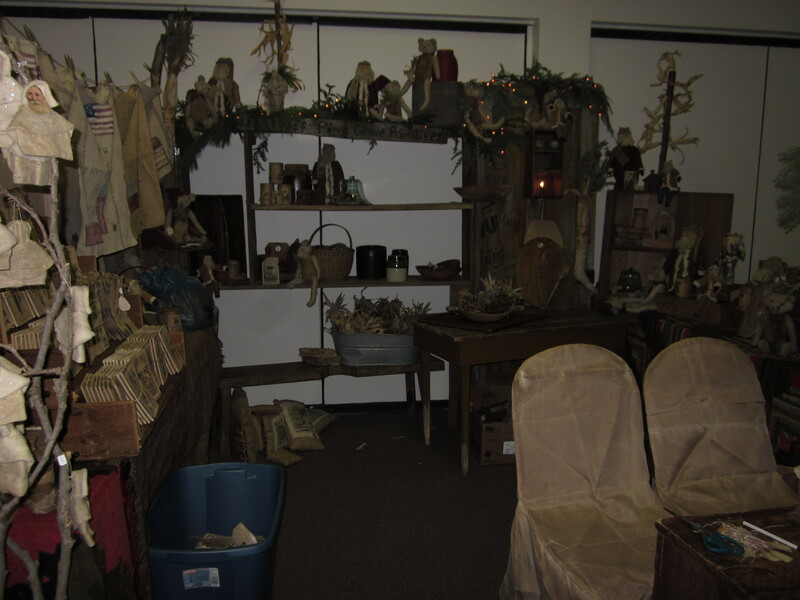 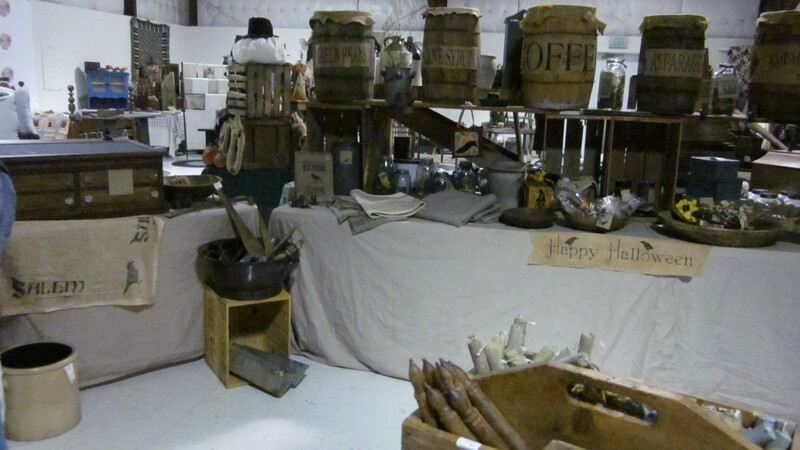 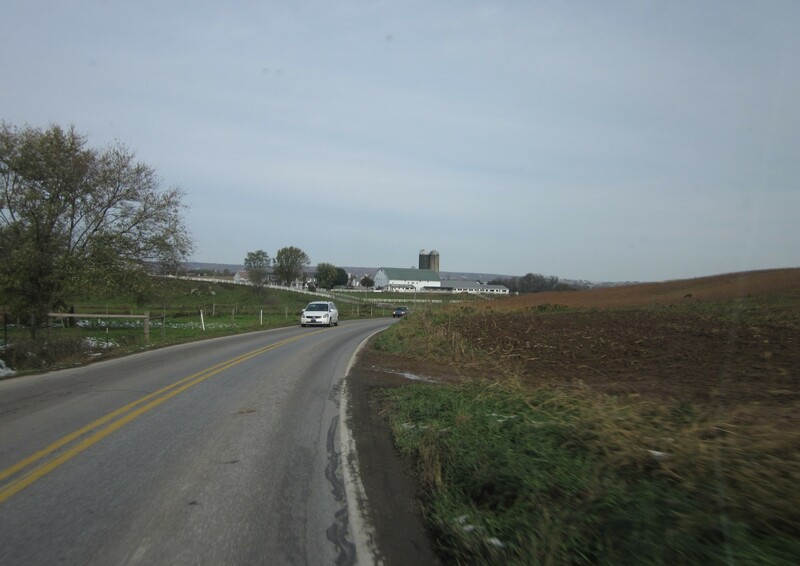 The next step in our journey began at Cecilia Taylor’s home and shop, Henhouse Primitives in Lewisville, Pennsylvania which led up to a fabulous show of primitives and antiques at Cecilia’s show, From the Farmhouse in Elkton, Maryland (just down the road)! 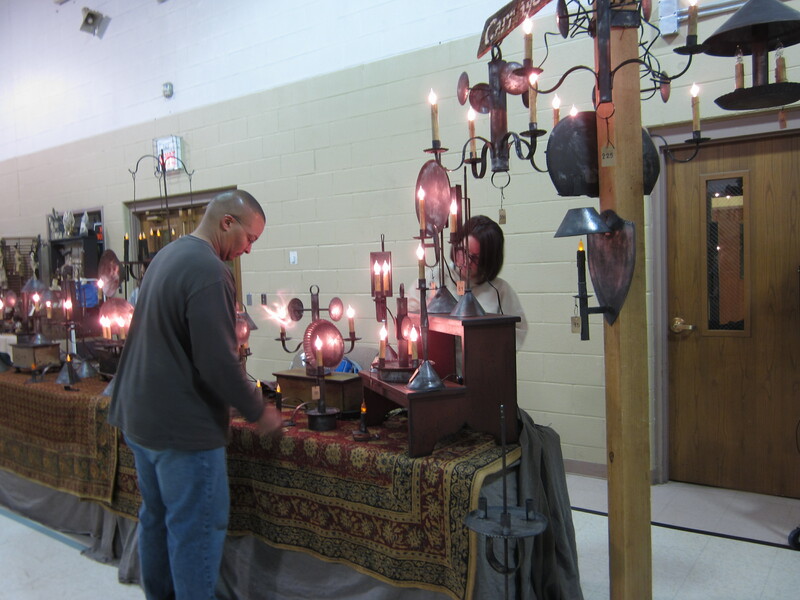 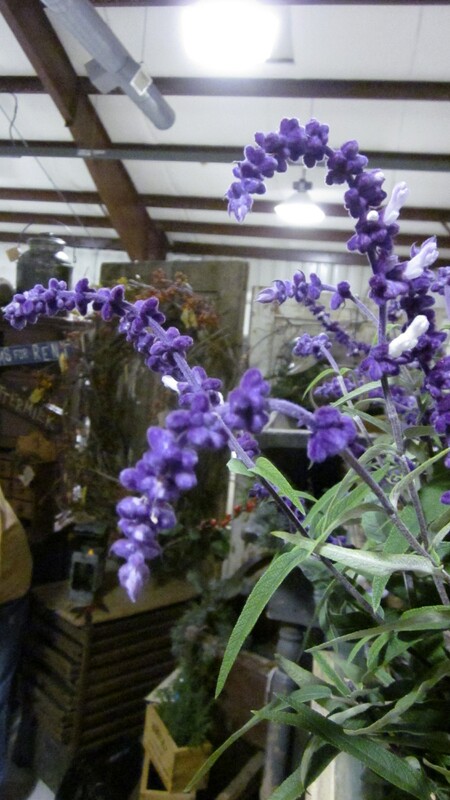 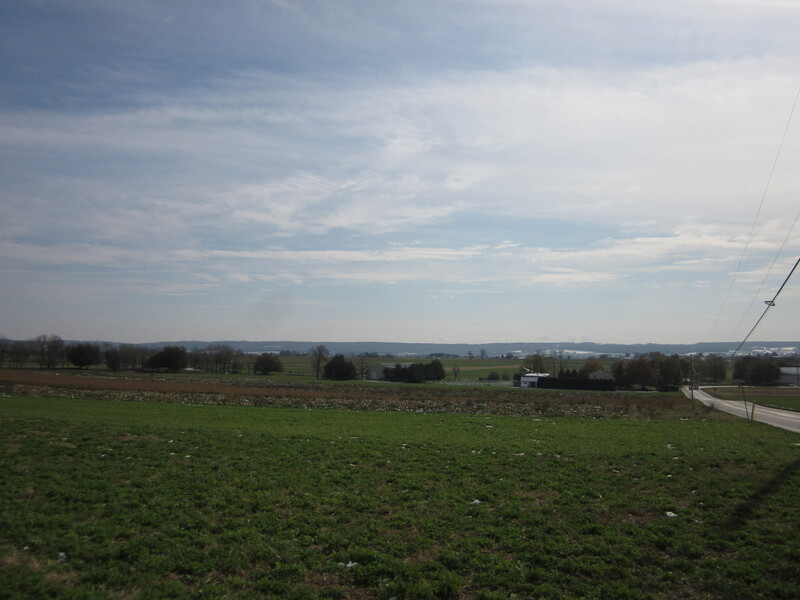 The Cecil County Fairgrounds is an awesome place for a show… the grounds are amazing! 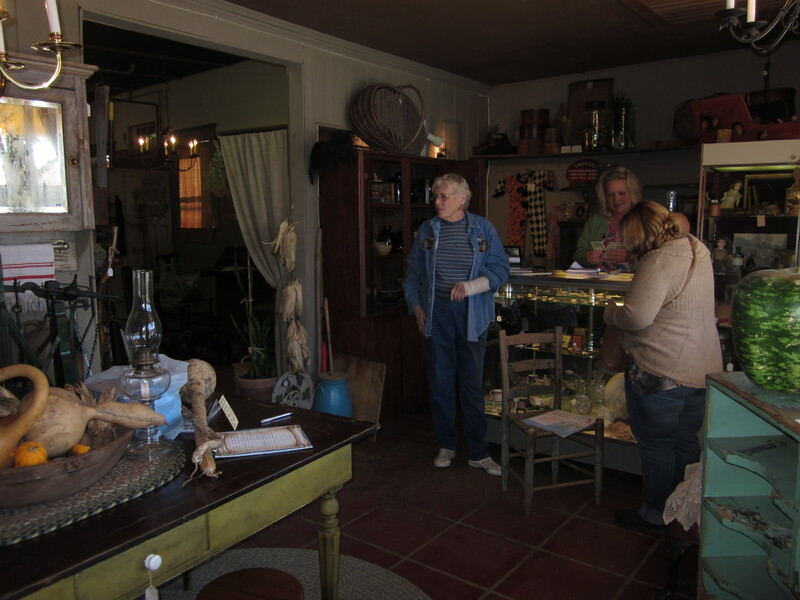 I don’t know how Cecilia does it, but she managed to have a half-dozen houseguests, run a show AND have an open house back at her shop… AND she fed ALL of us! 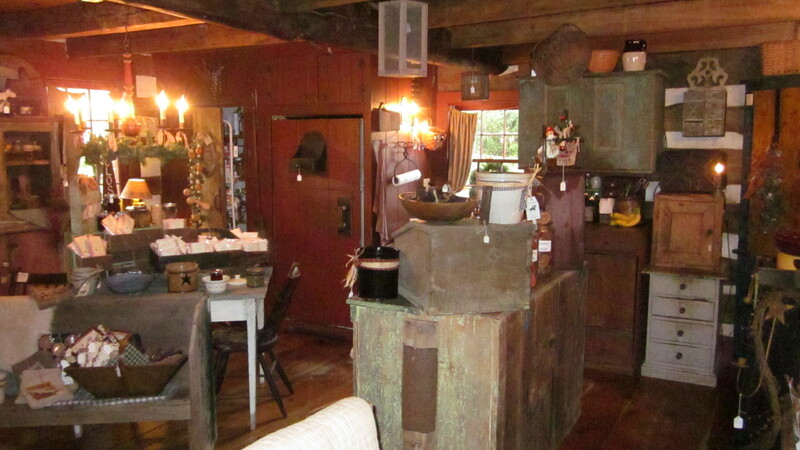 A wonderful hostess, her attention to detail and caring nature shines in everything she does. 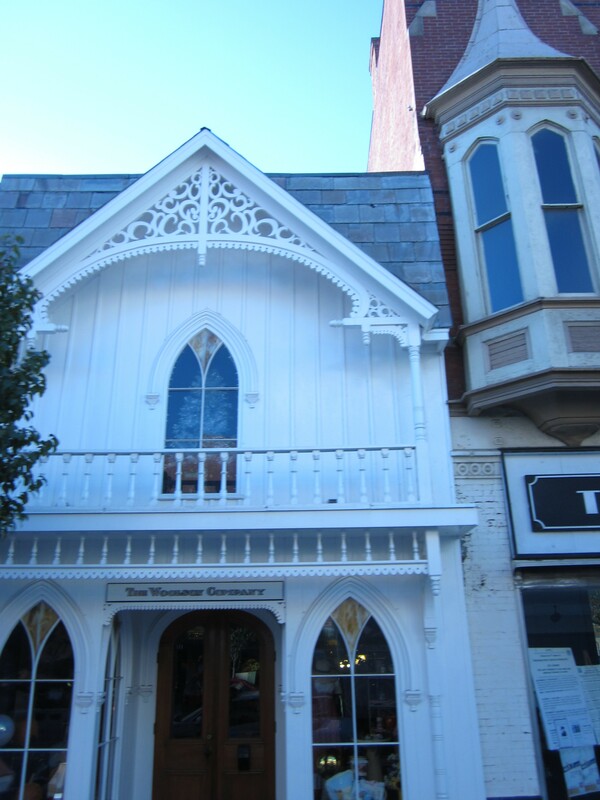 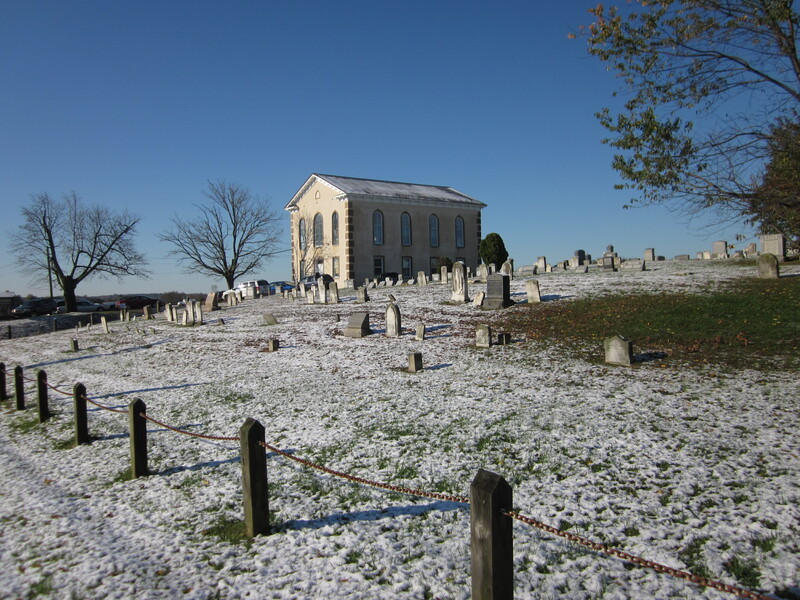 Absolutely LOVE this church… on the road from Cecilia’s to the fairgrounds… so sweet! 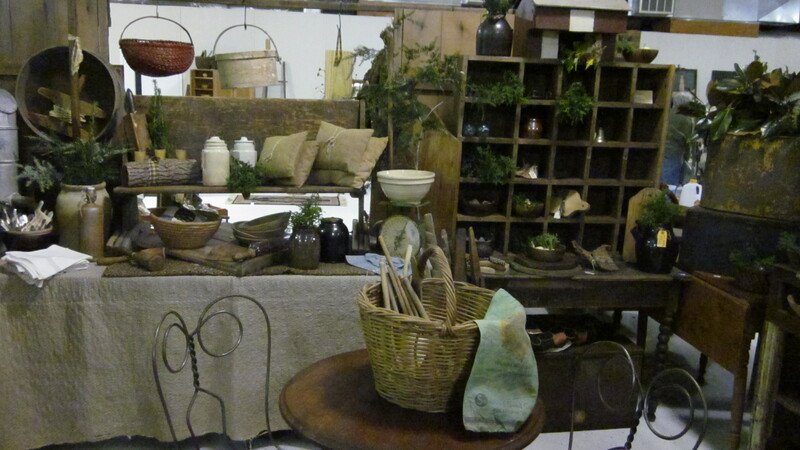 Friday dawned clear and cool, an easy day for set-up with no sign of what was to come! 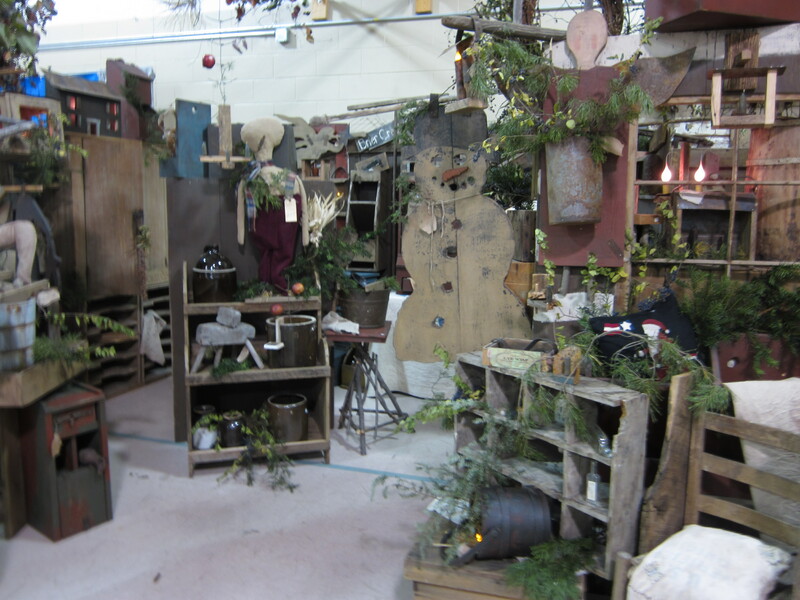 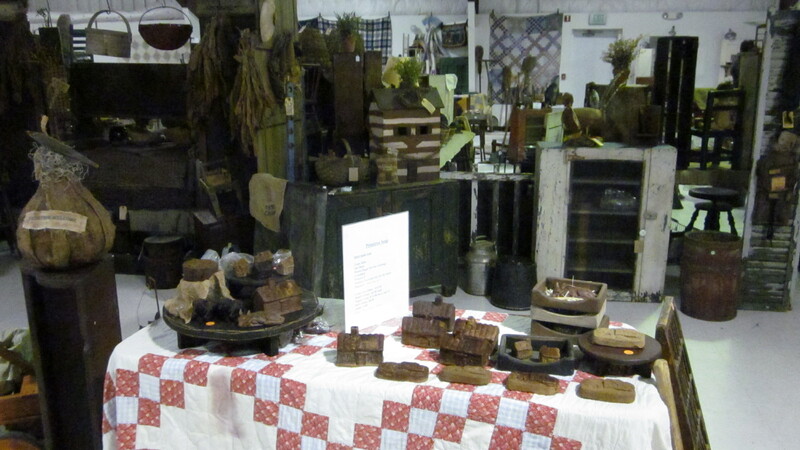 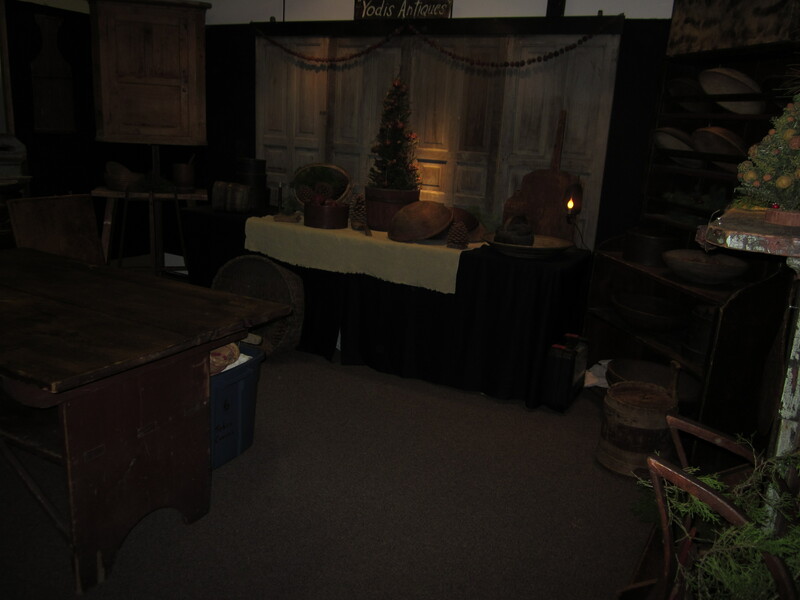 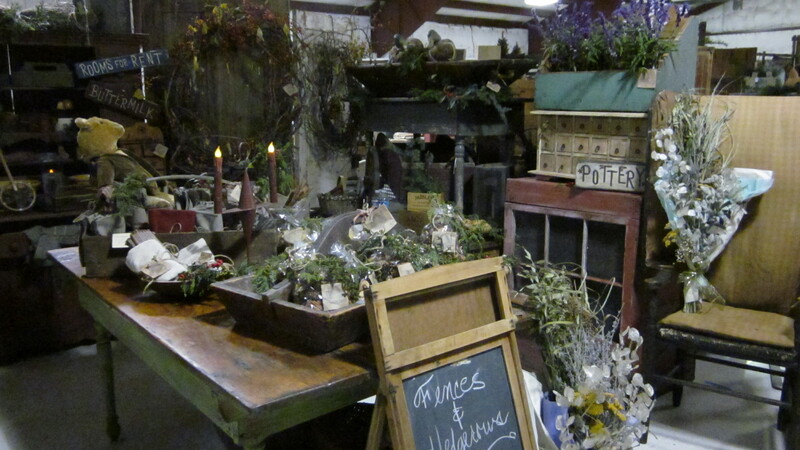 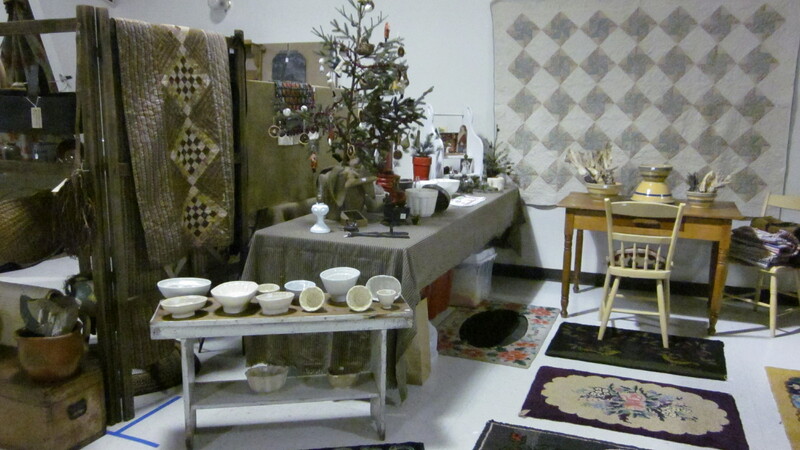 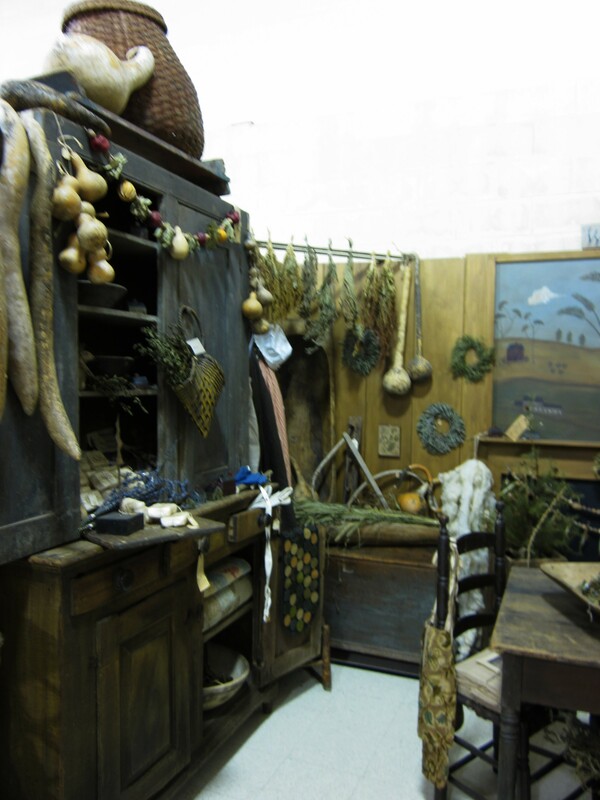 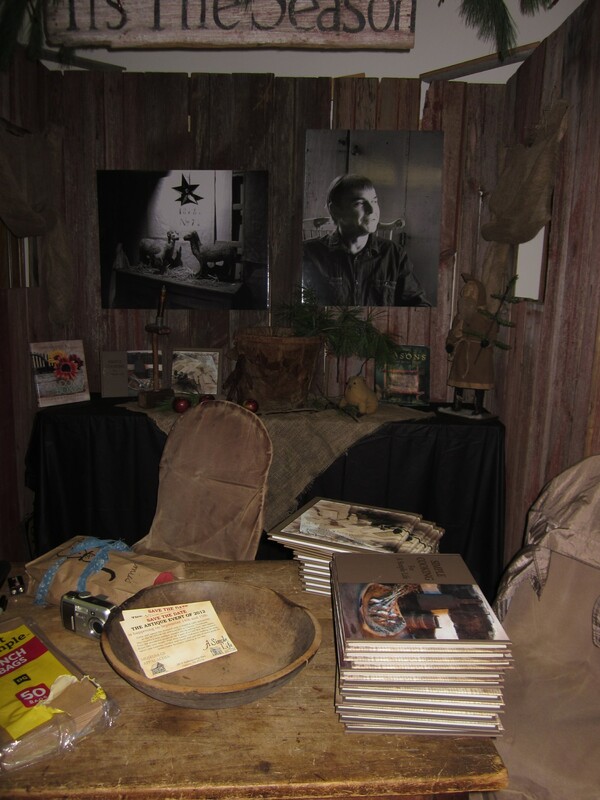 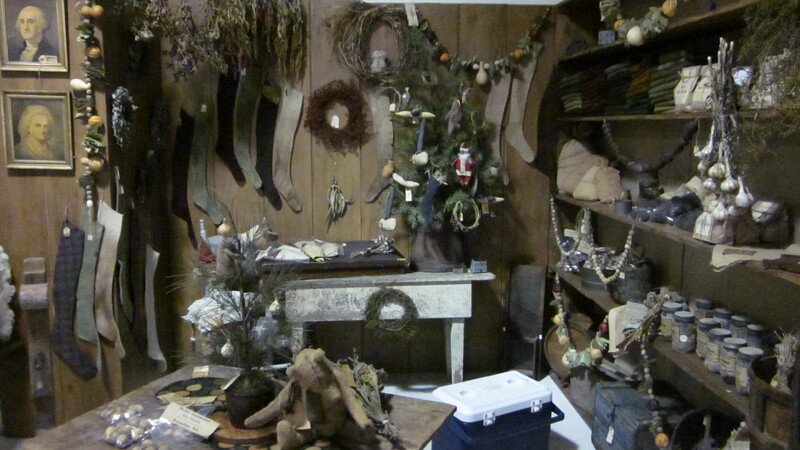 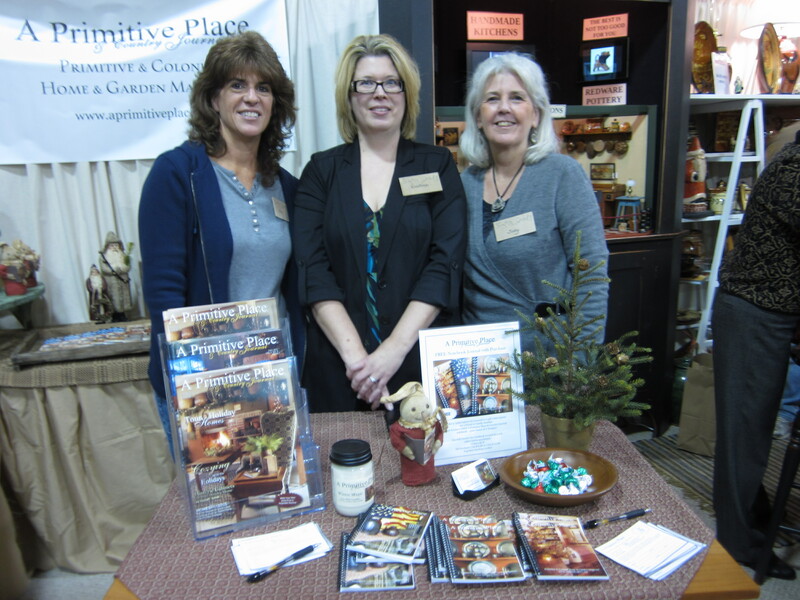 Here is our booth at From the Farmhouse show… we seem to be getting a reputation for first to set up and last to take down! 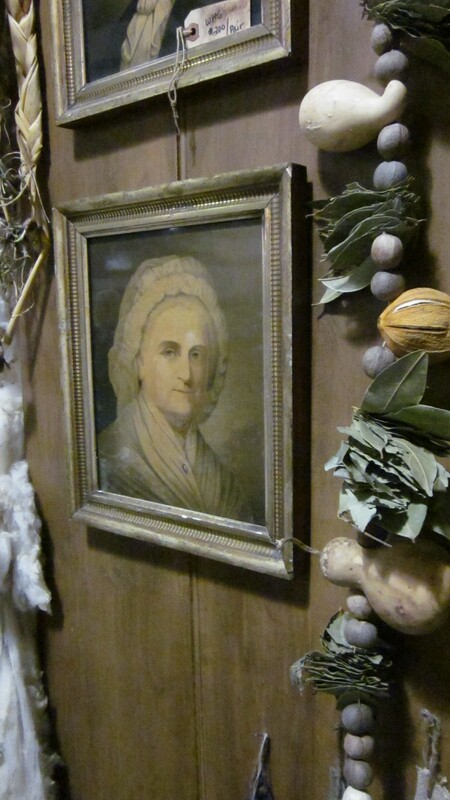 Our Buttery and part of the back wall. 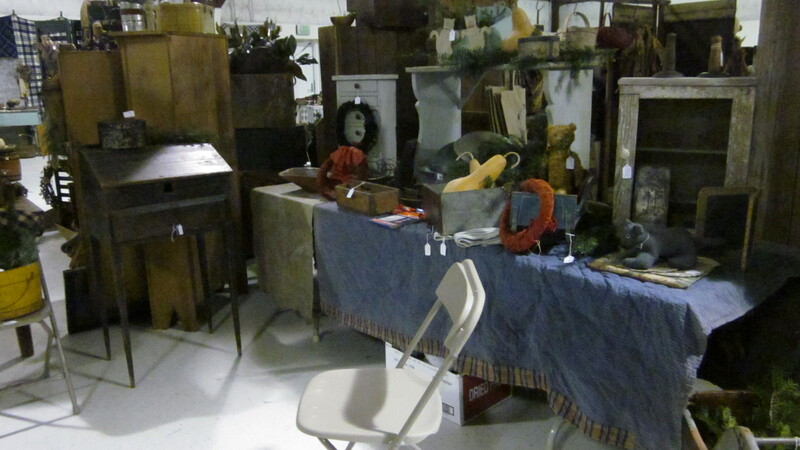 The back wall (ignore the cooler… our stepping stool!). 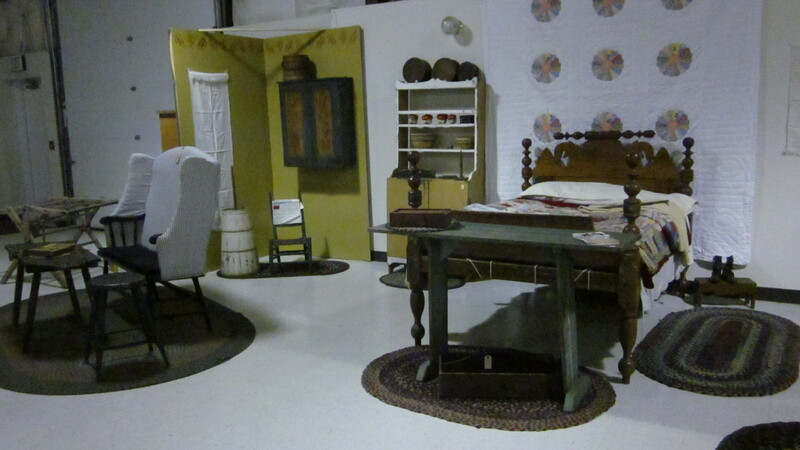 Last but not least, the back corner! 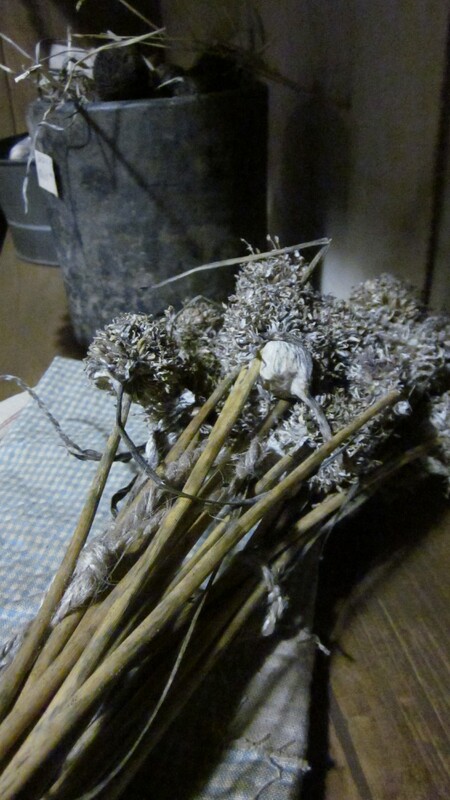 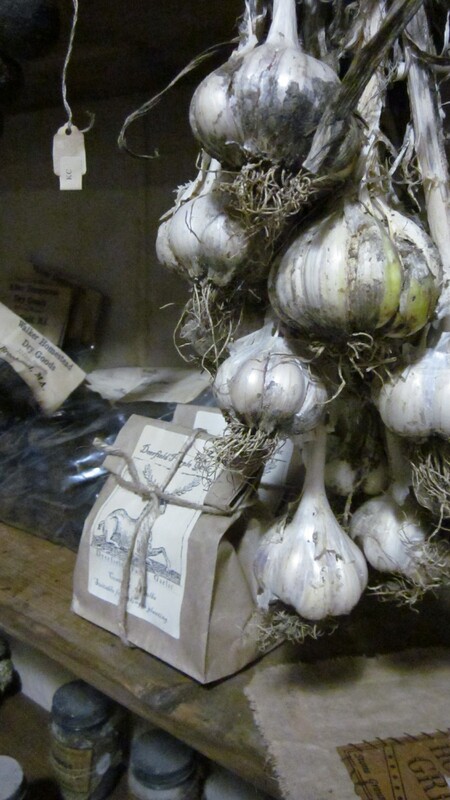 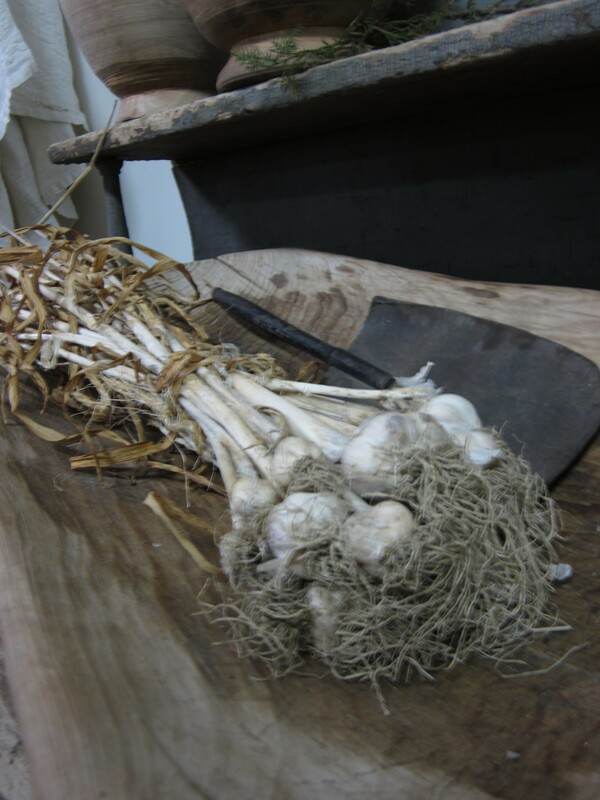 Christine Crocker’s Deerfield Farm “Deerfield Purple” Garlic… for growing or eating… it’s the best! 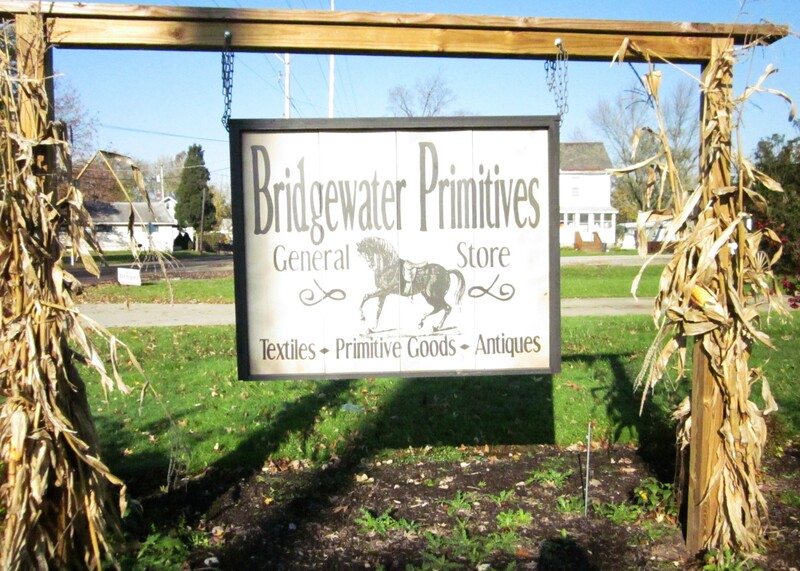 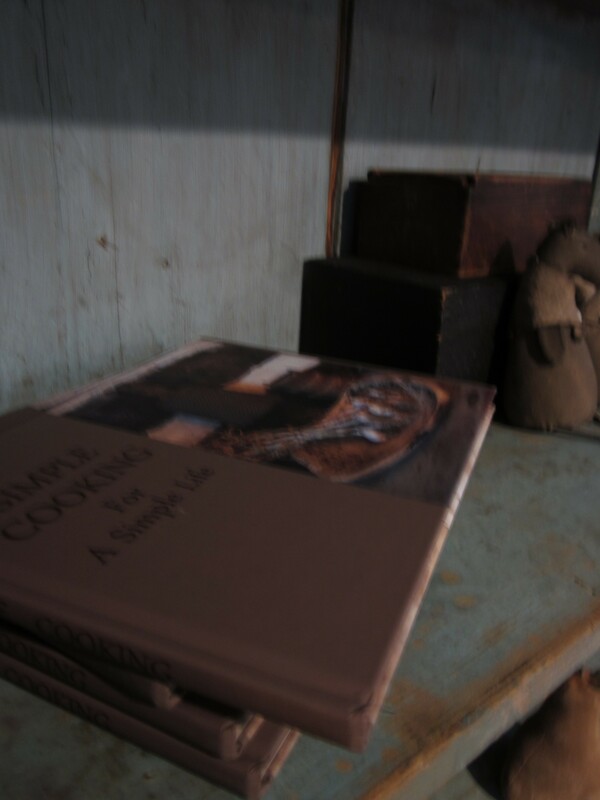 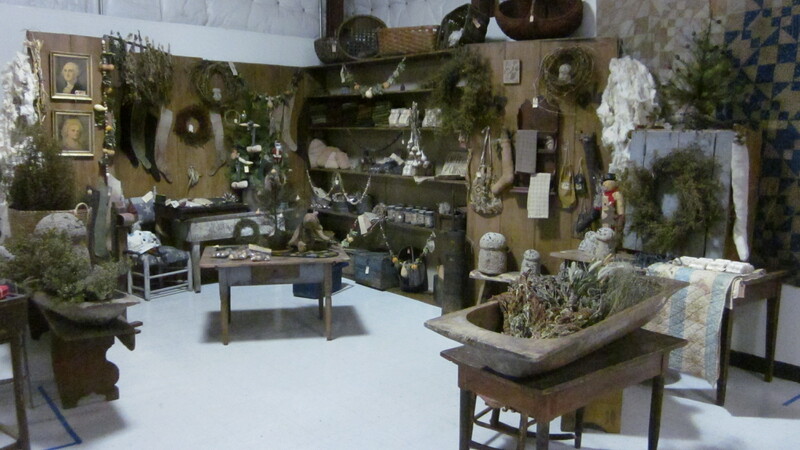 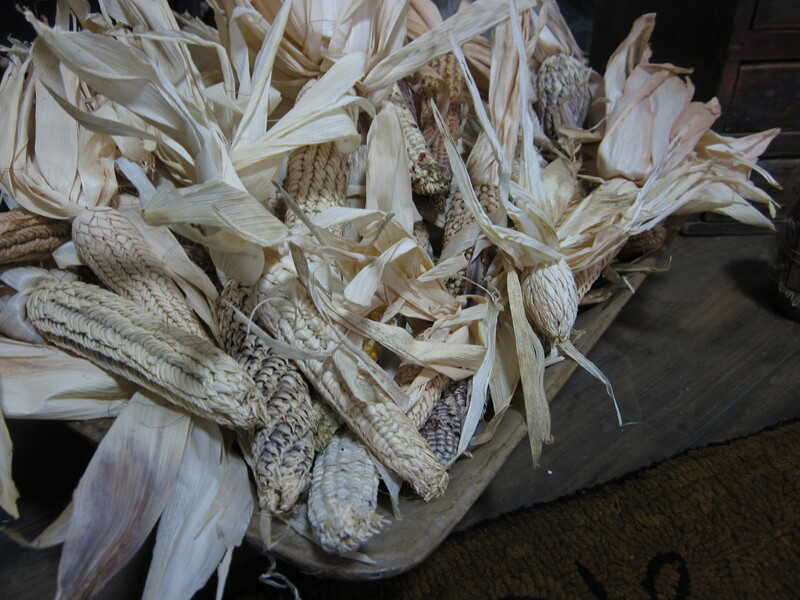 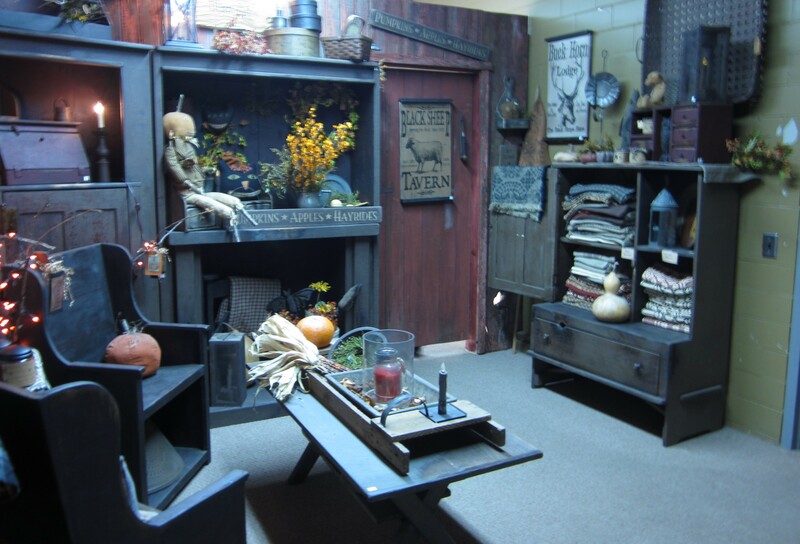 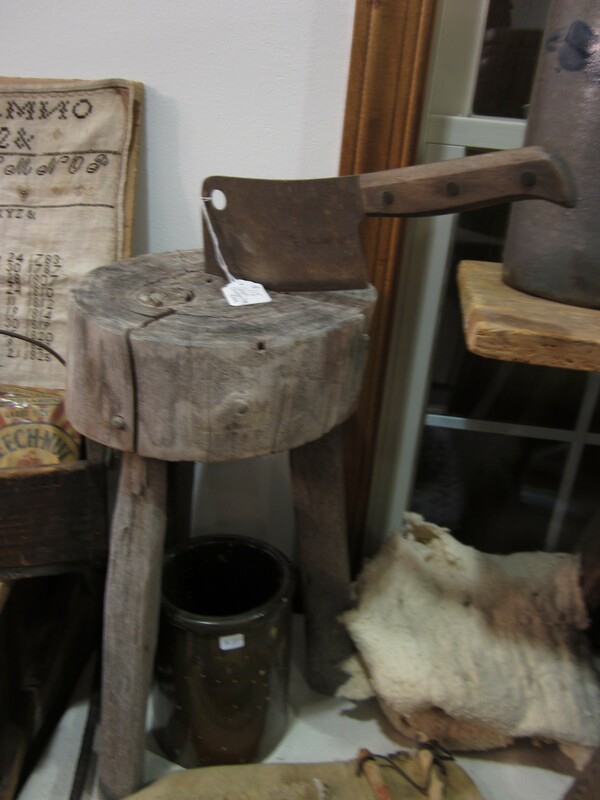 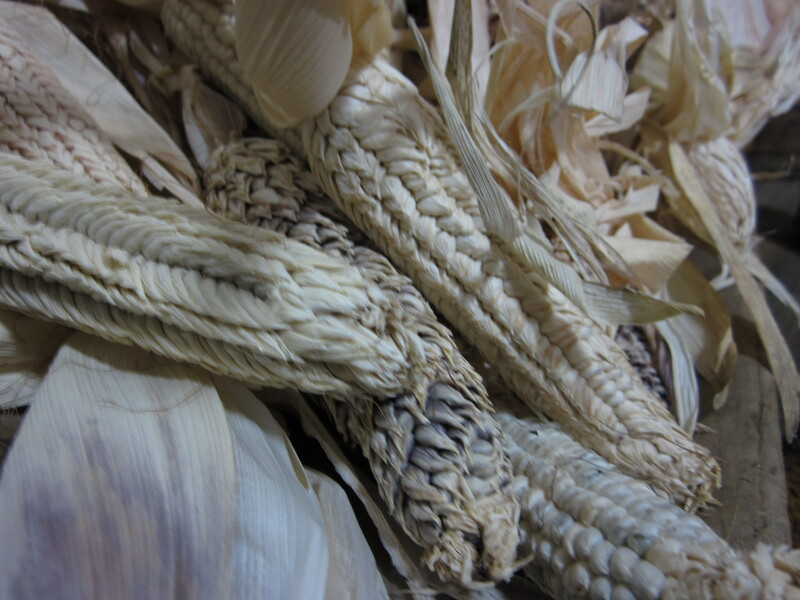 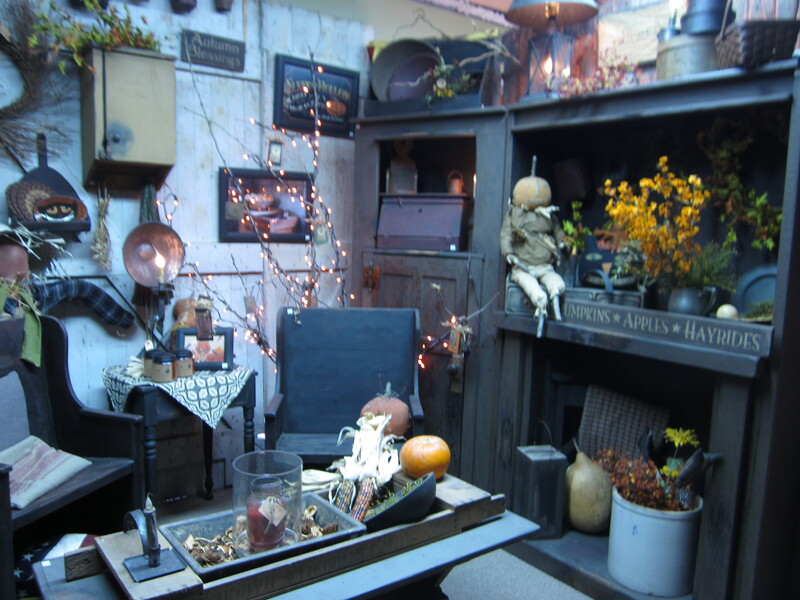 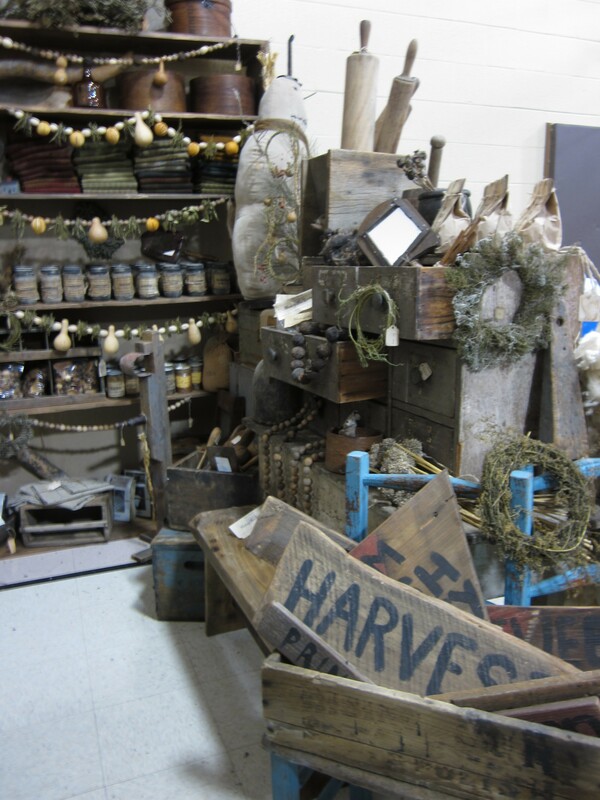 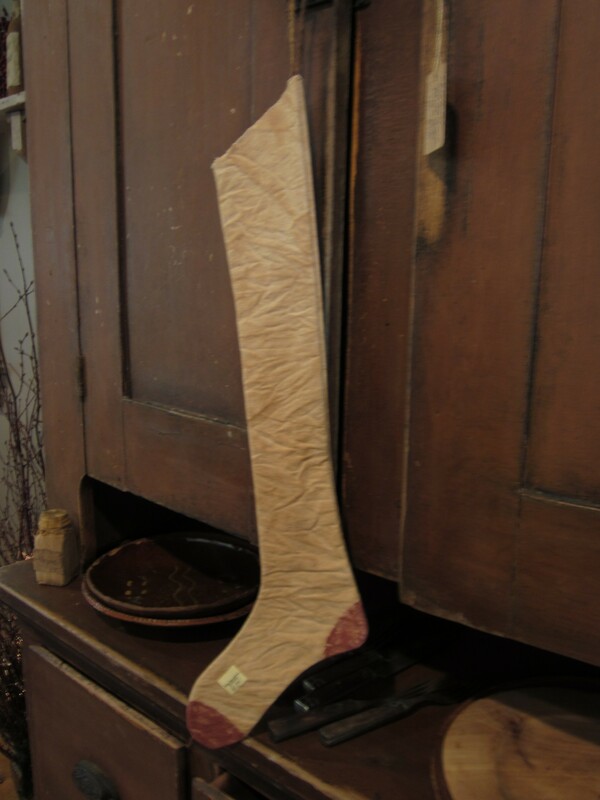 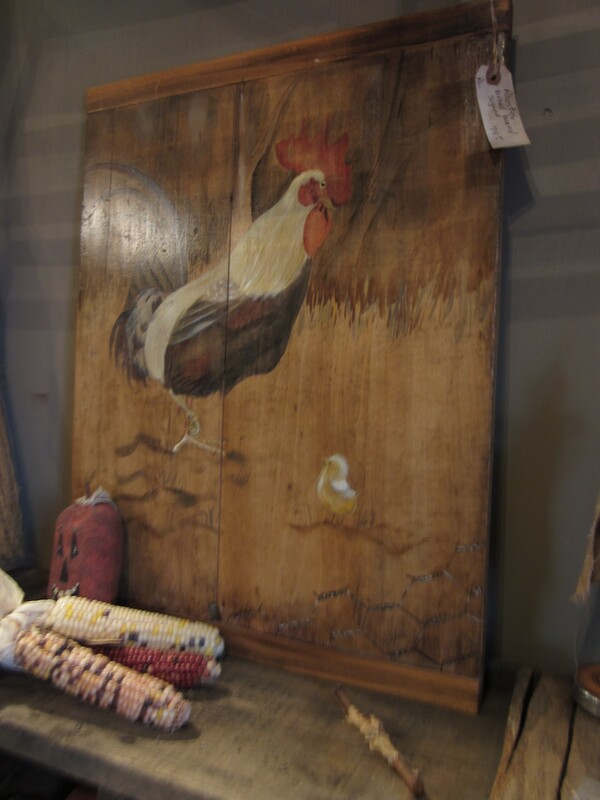 Christina & Scott Hummel’s Primitive America~ Another favorite shop of ours to visit… Christina always has fabulous country antiques and is located in Pennsdale, PA! 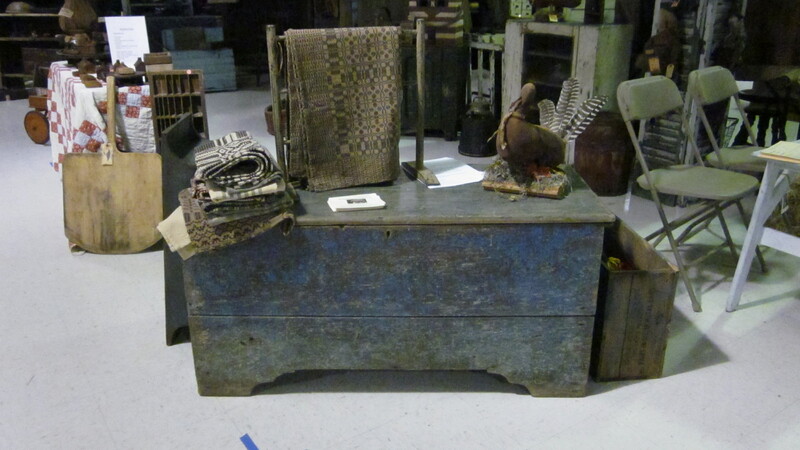 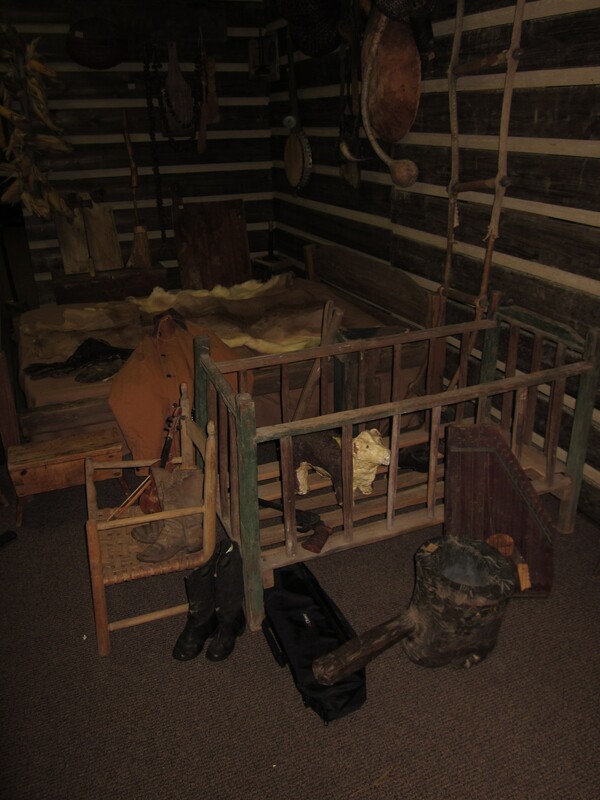 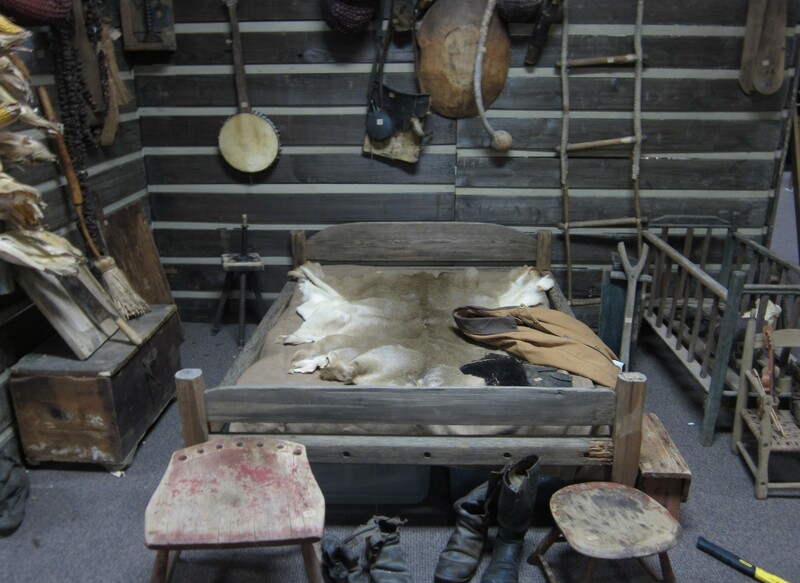 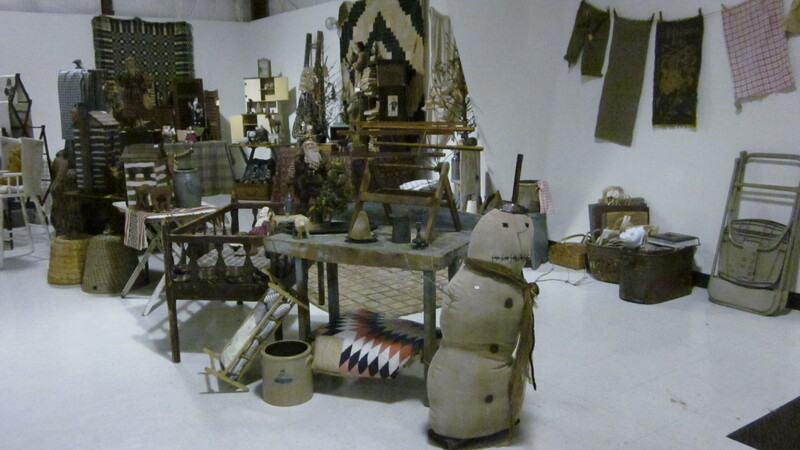 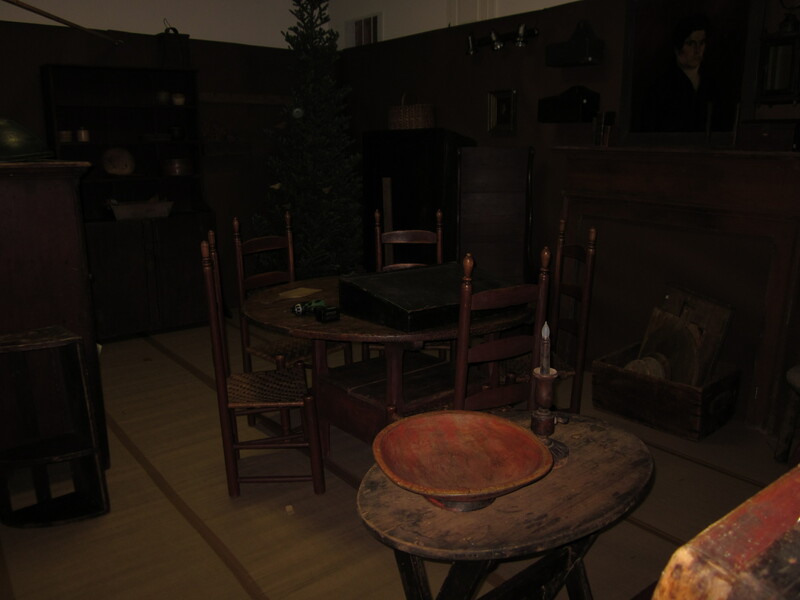 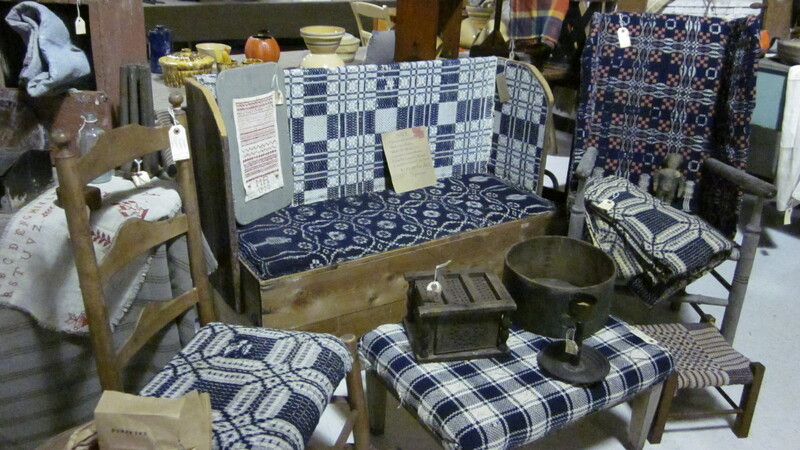 Primitive America~ LOVE this set… seems to me that a certain black cat has claimed the ottoman! 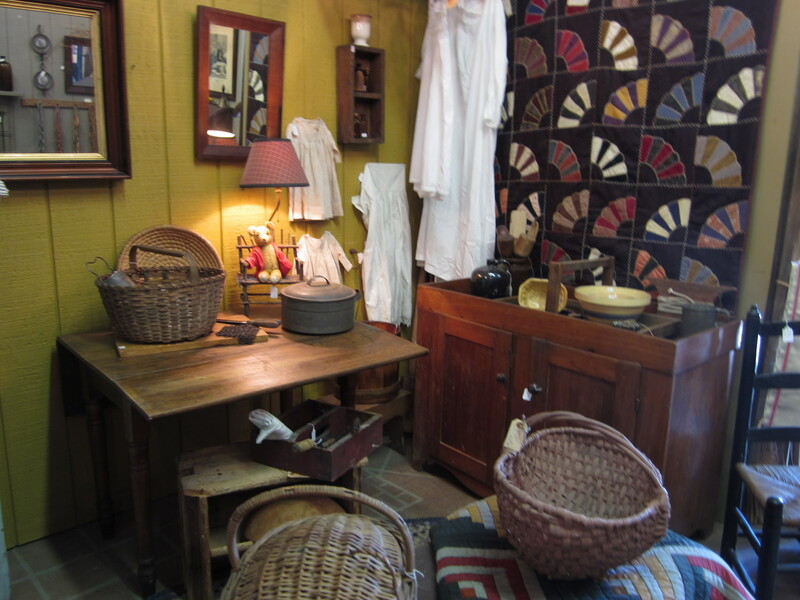 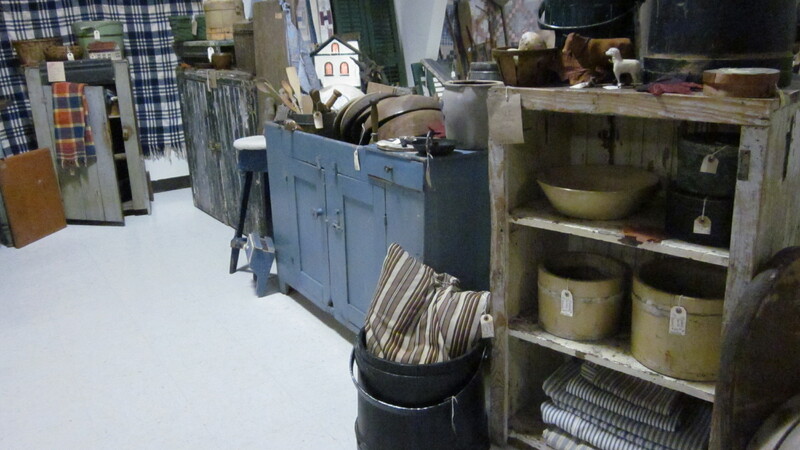 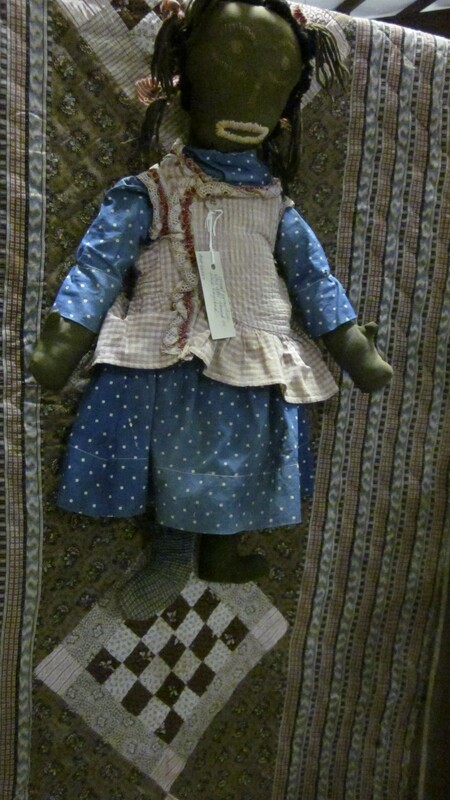 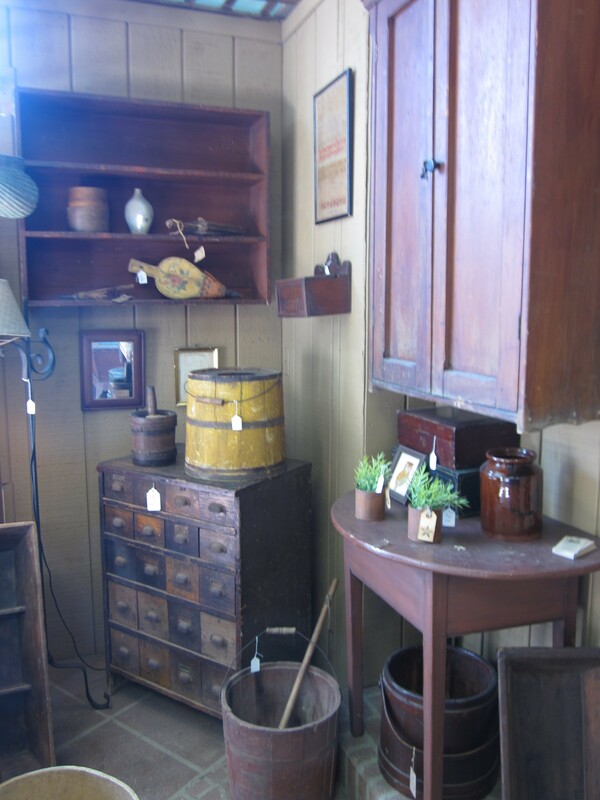 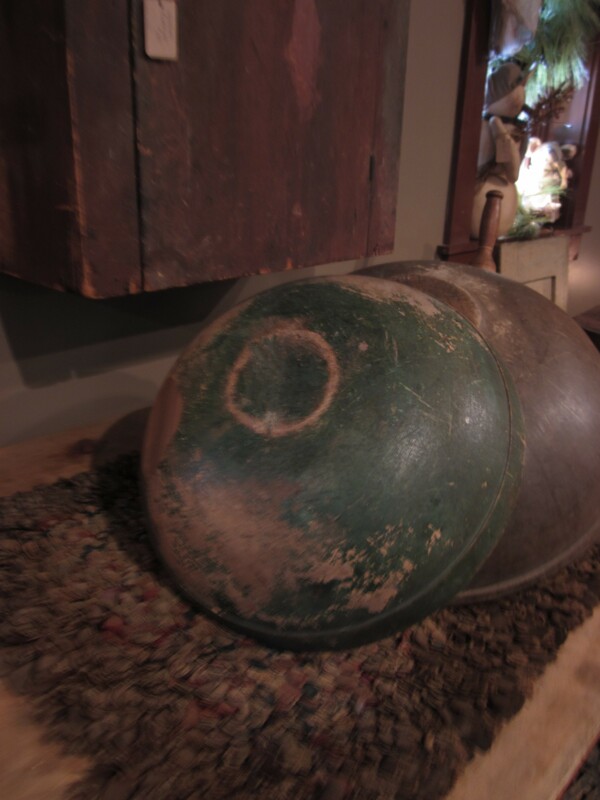 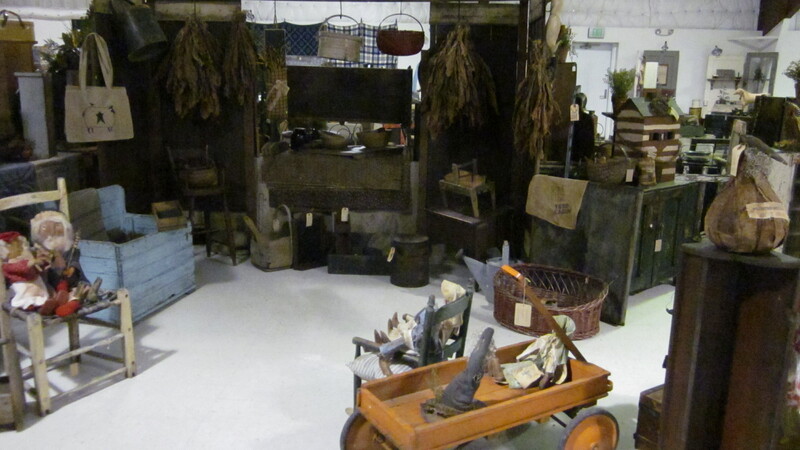 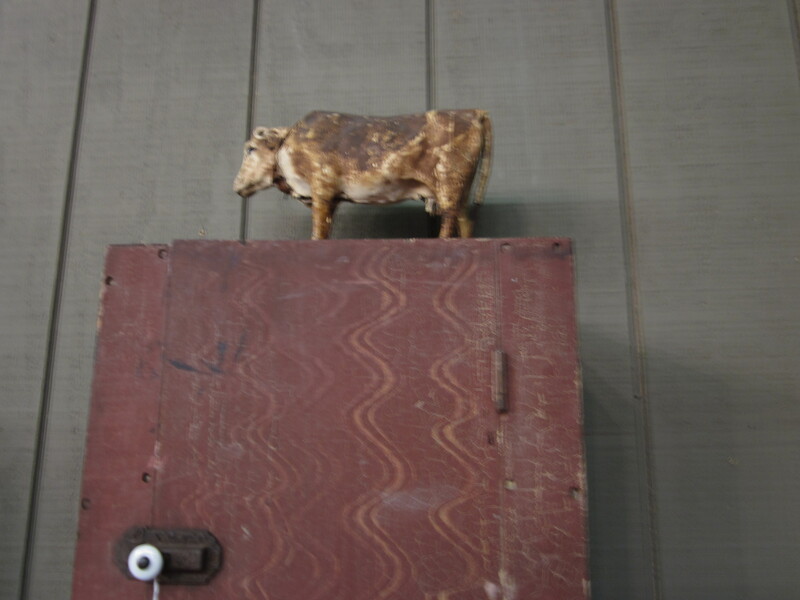 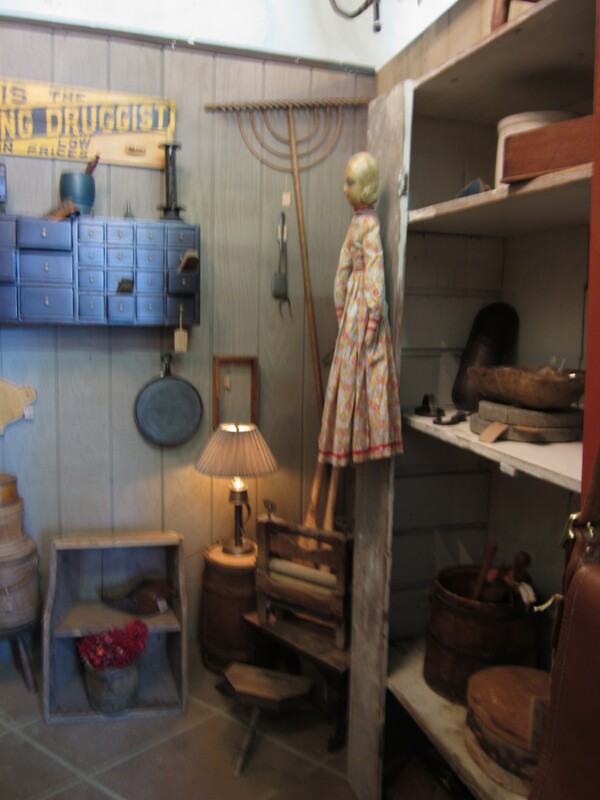 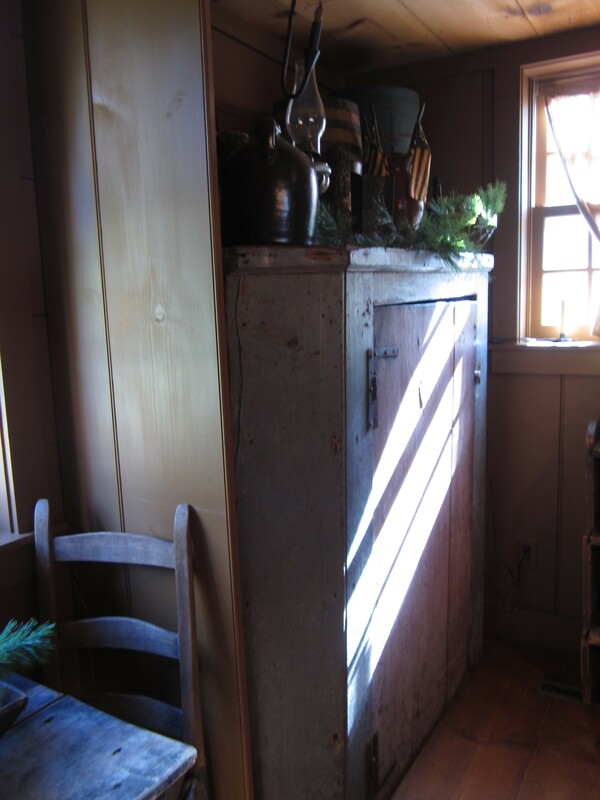 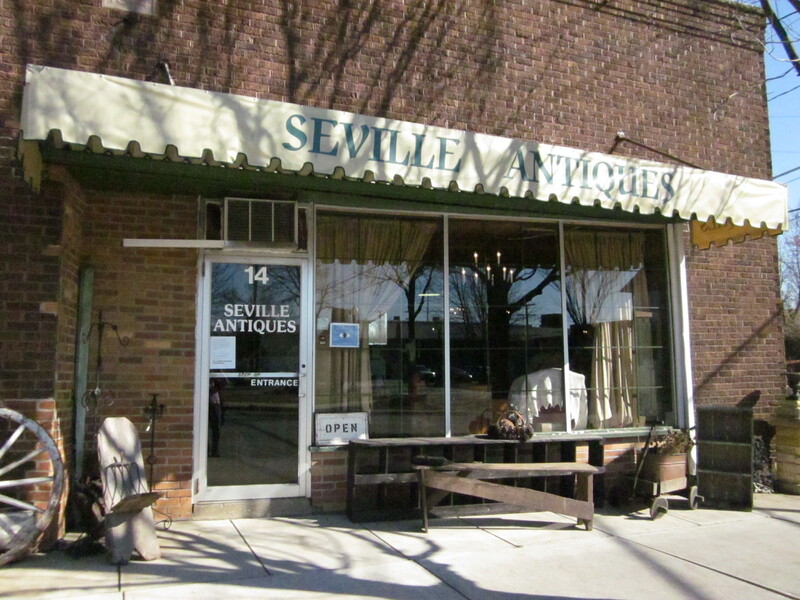 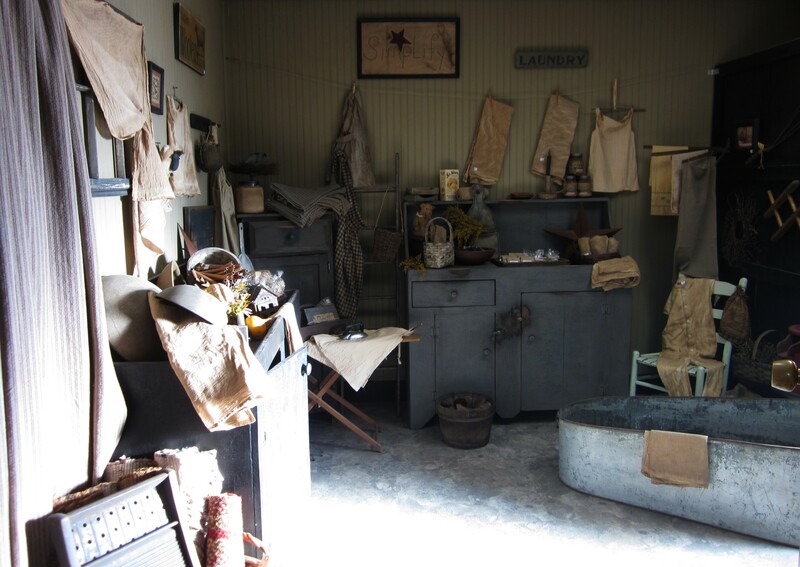 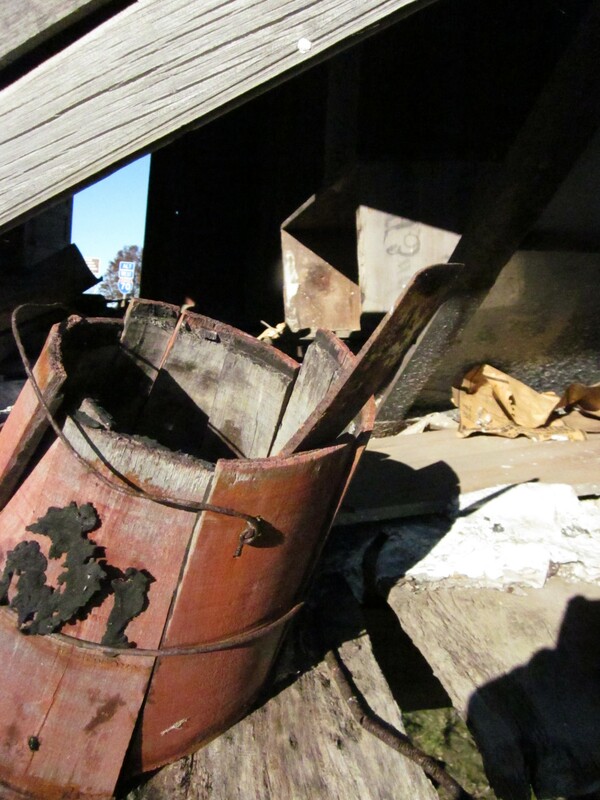 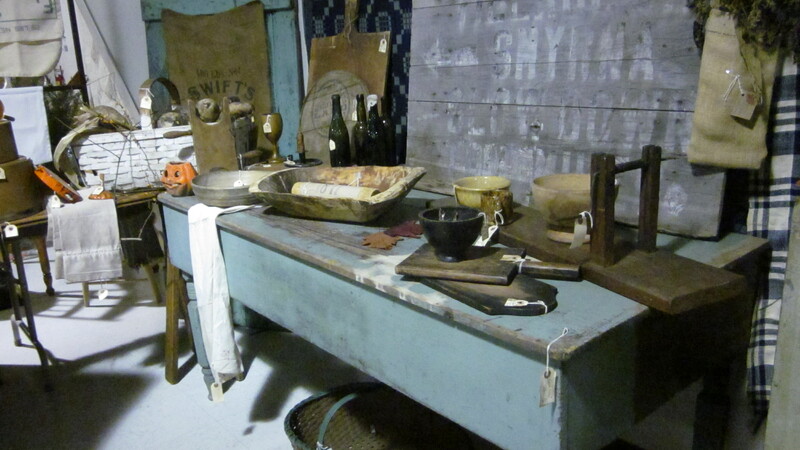 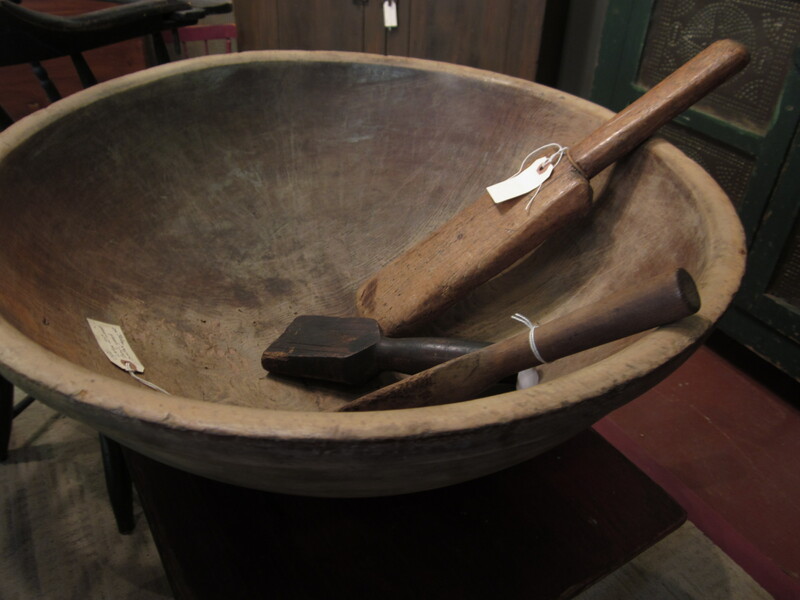 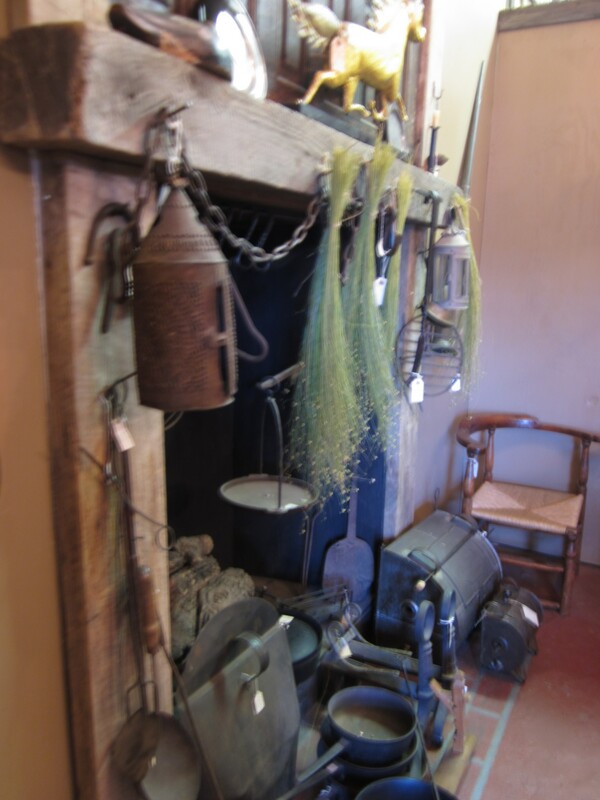 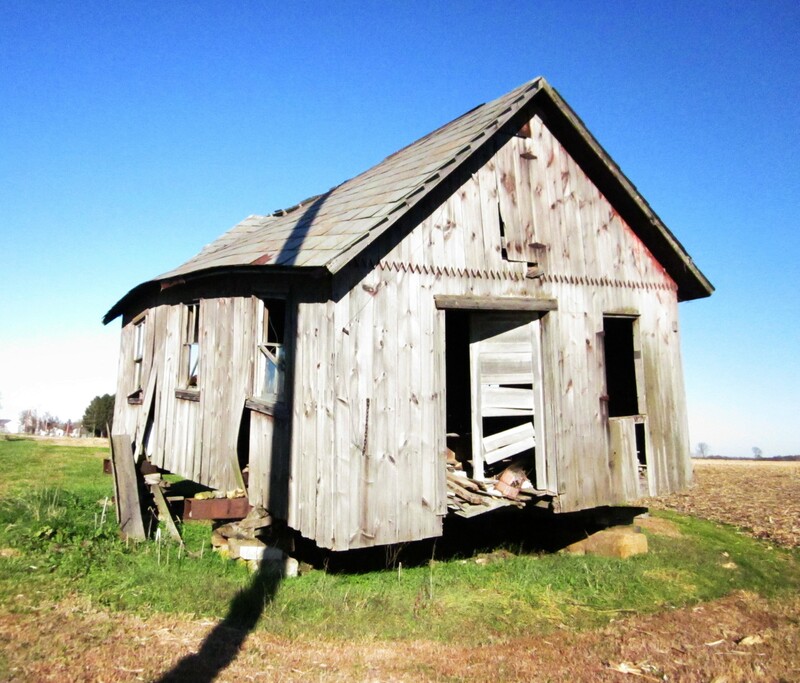 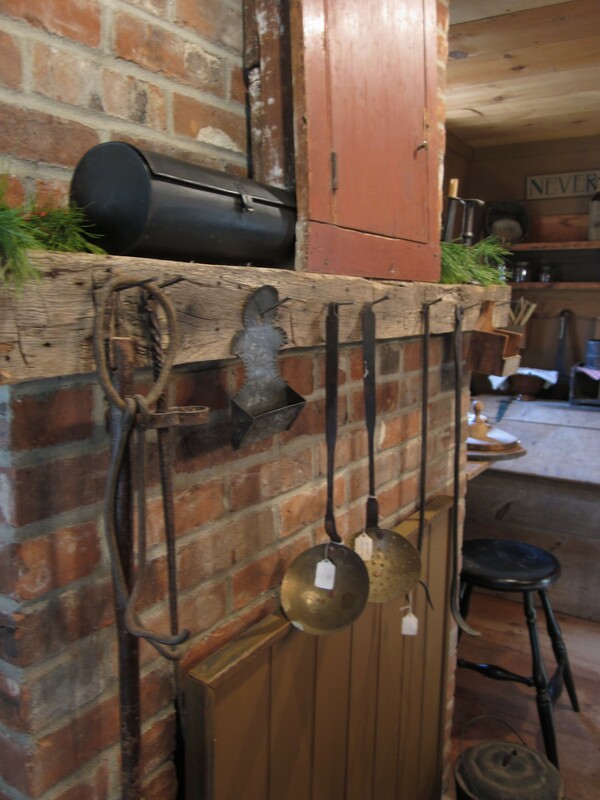 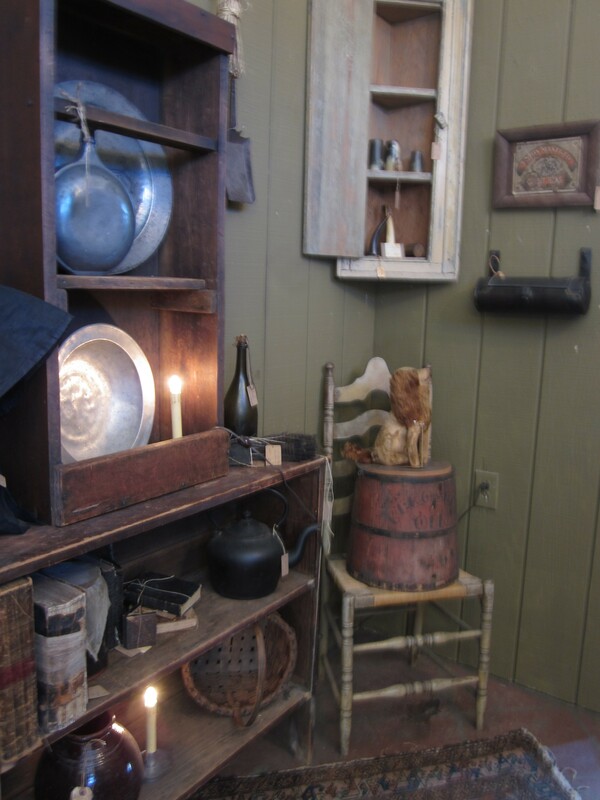 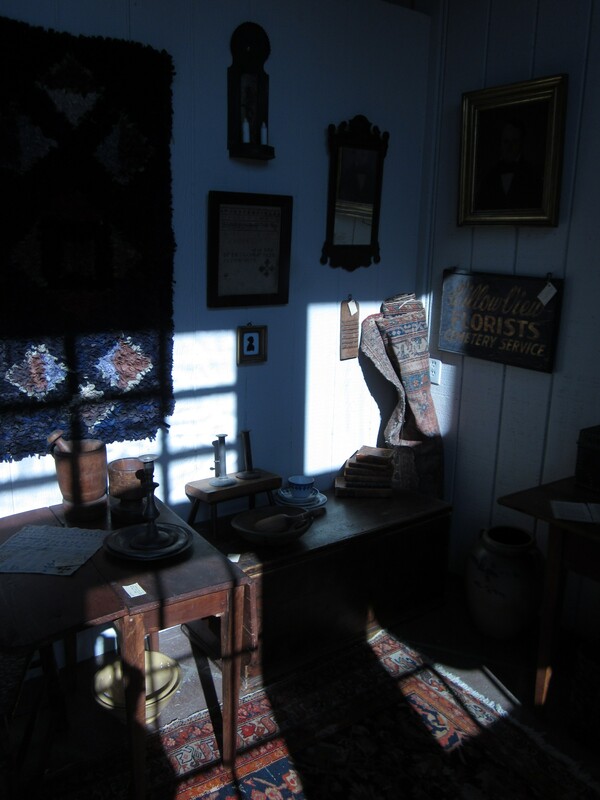 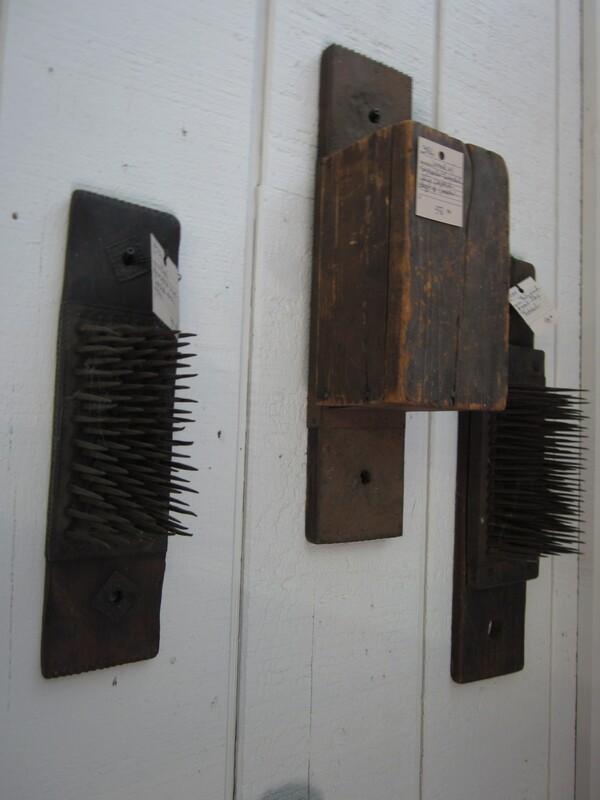 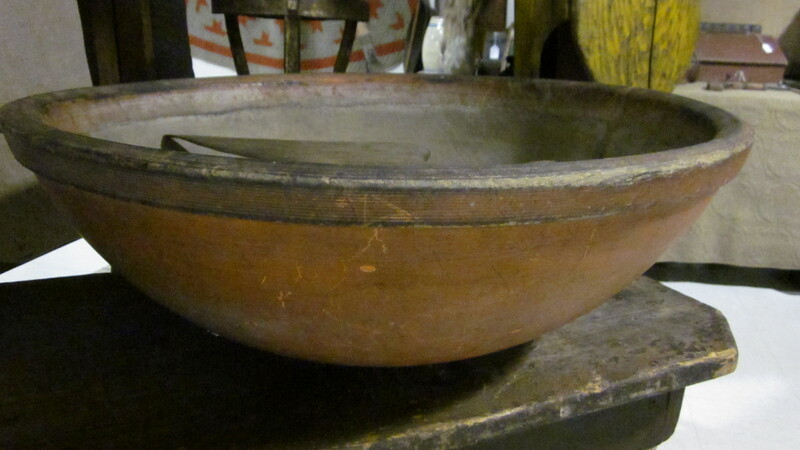 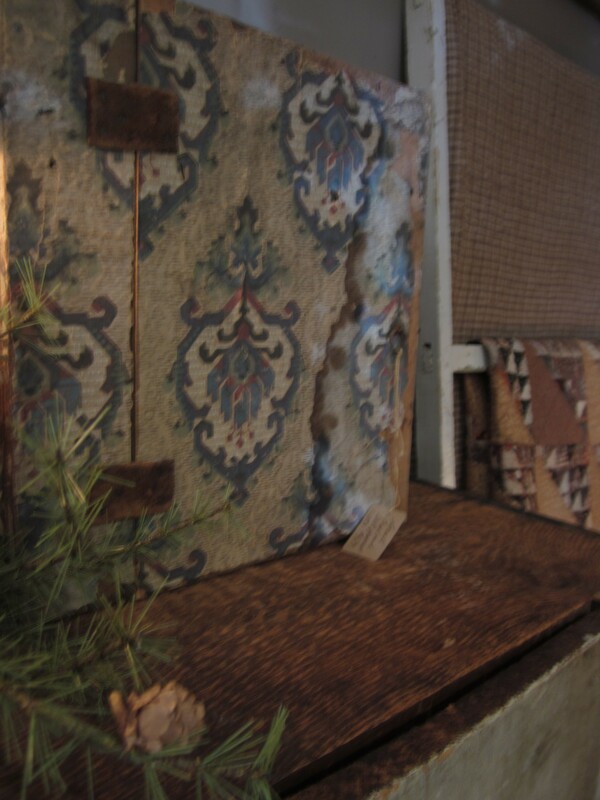 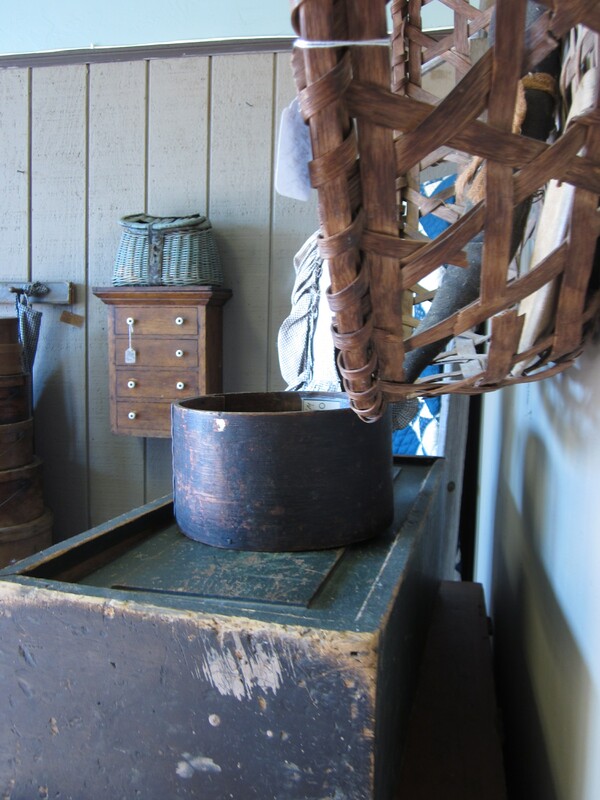 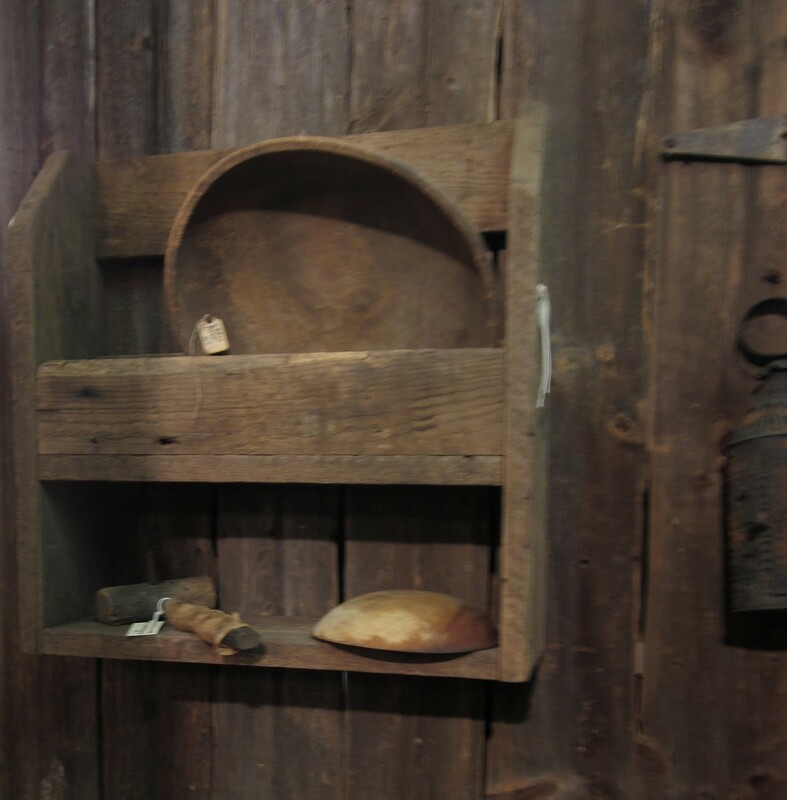 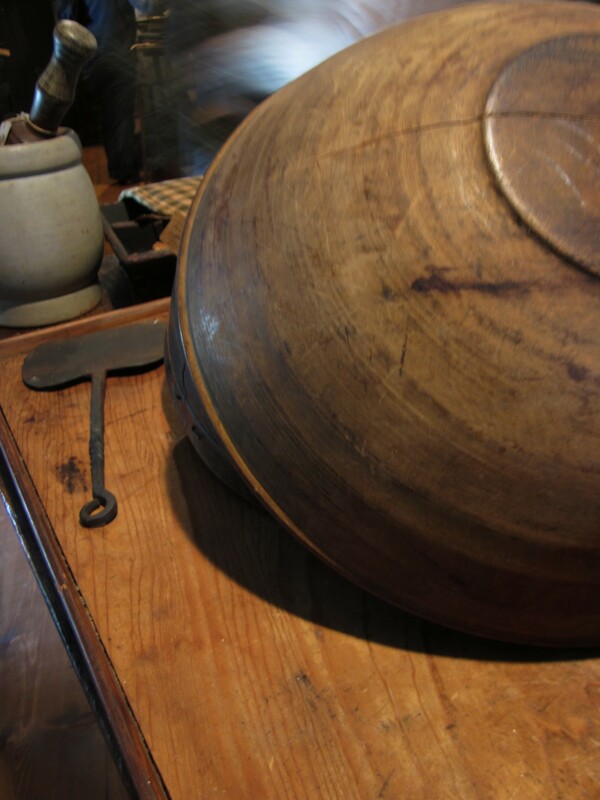 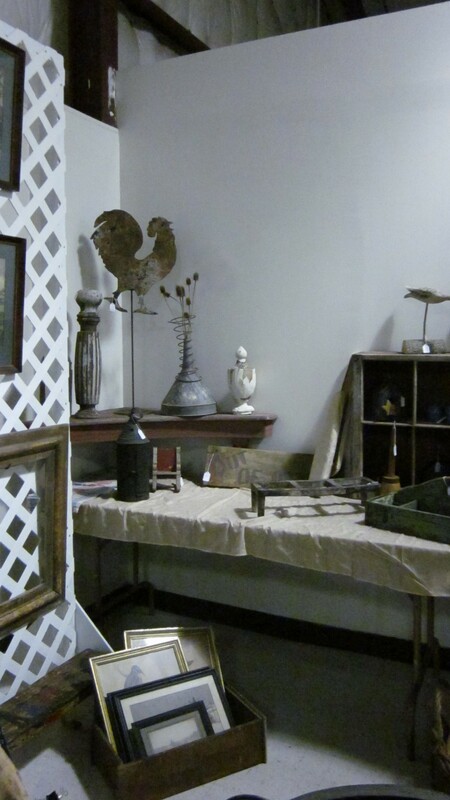 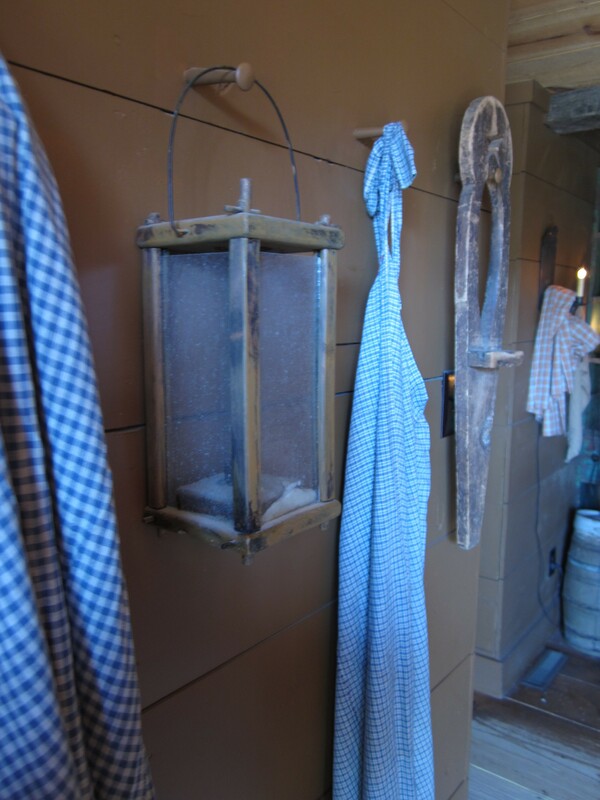 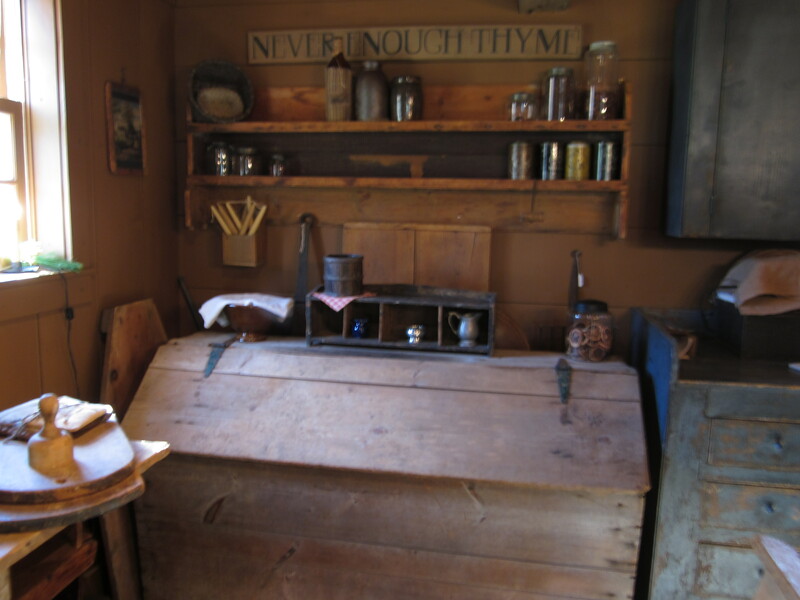 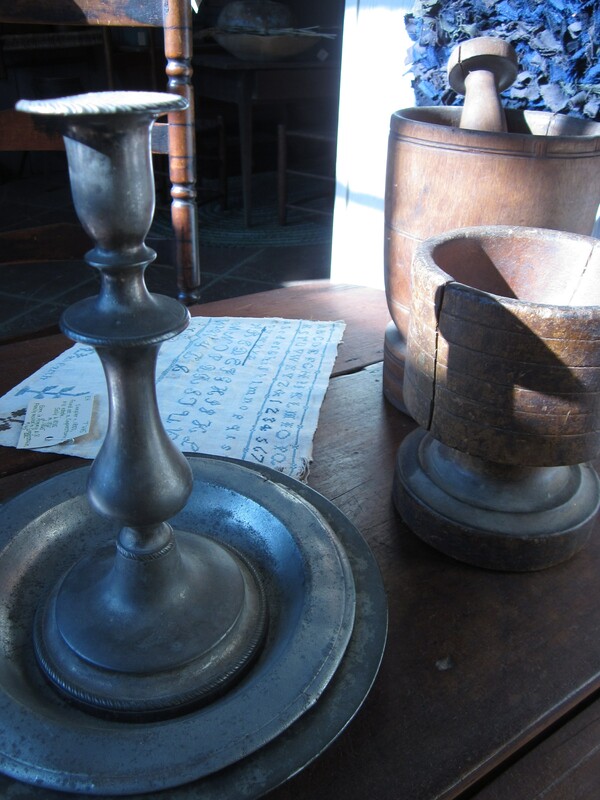 American Vernacular Antiques~ LOVE their stuff… they always have something special and unique! 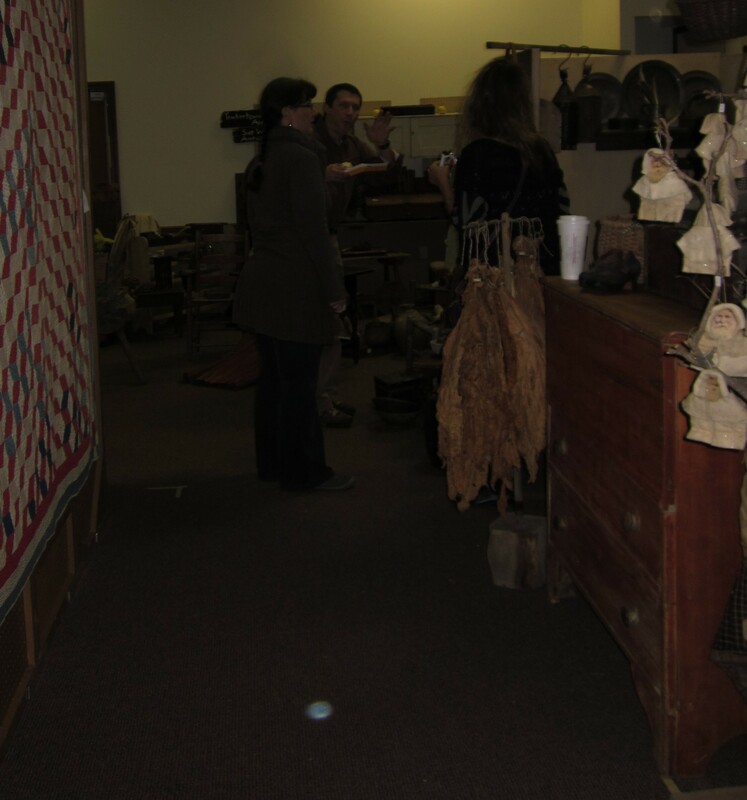 Donna & Don Smith, Southern Star Antiques~ Our housemates… great people, so glad we had the opportunity to meet and visit with them! 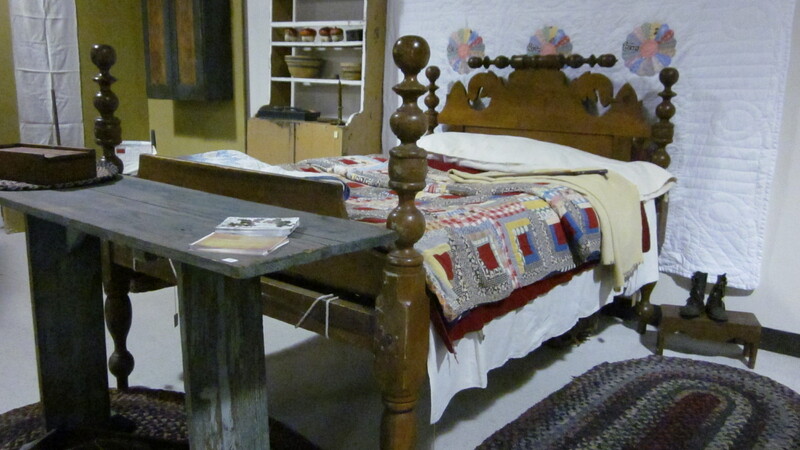 Southern Star Antiques~ LOVE this bed! 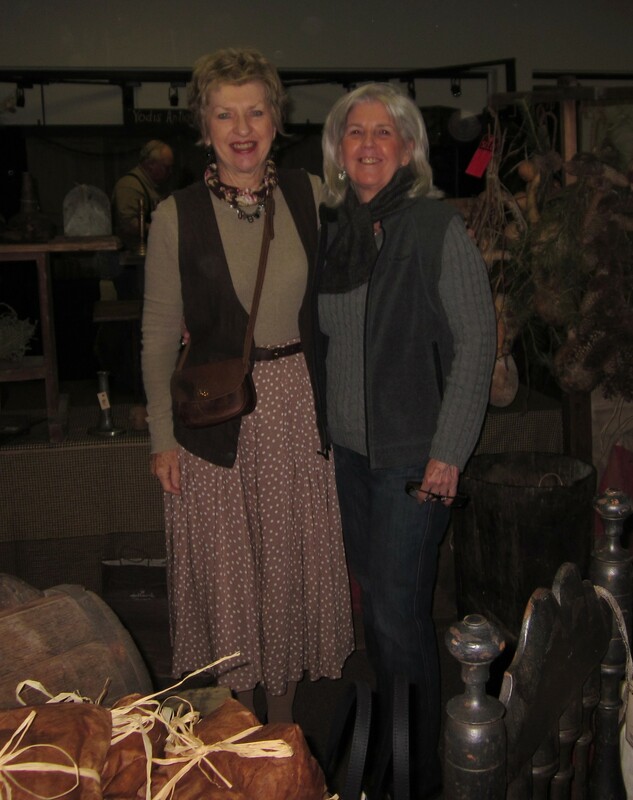 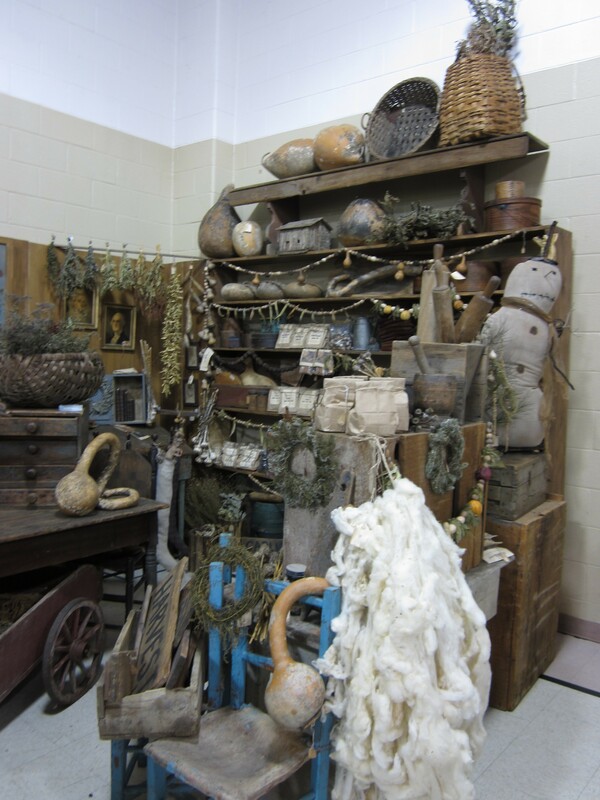 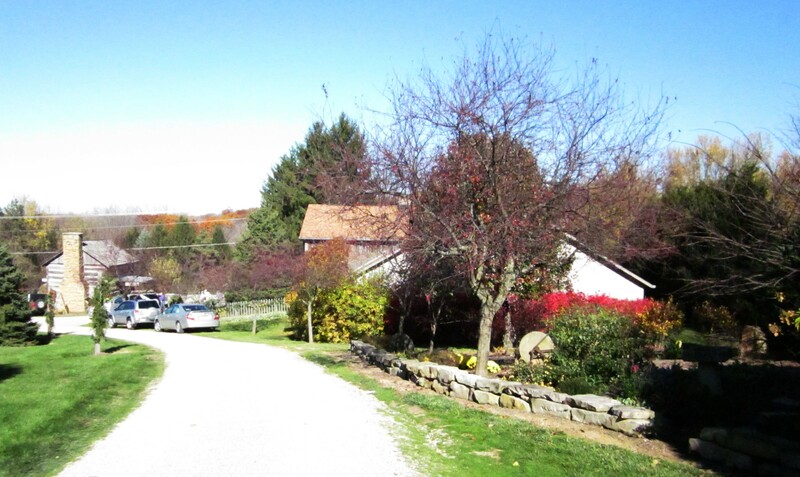 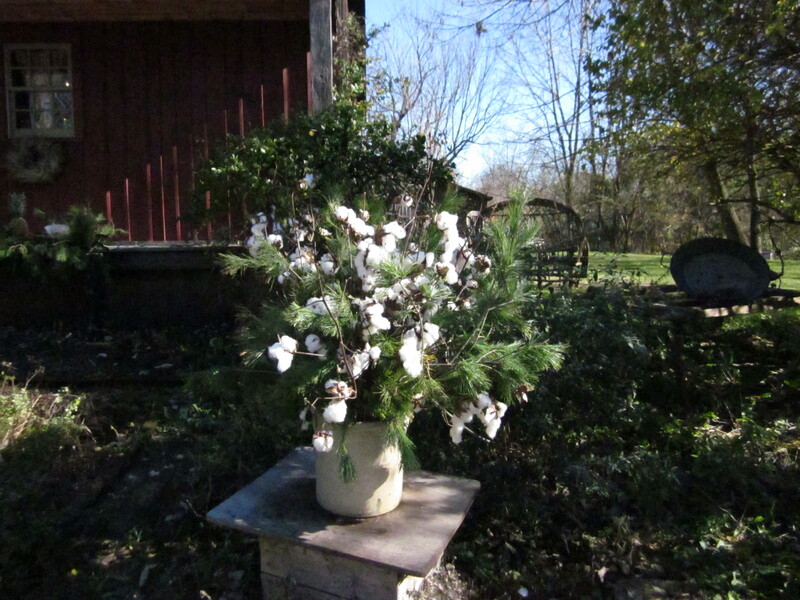 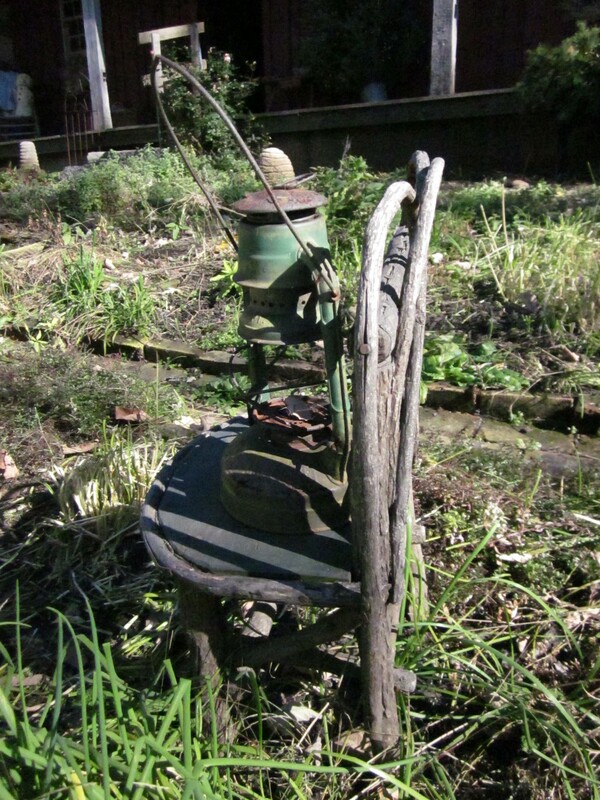 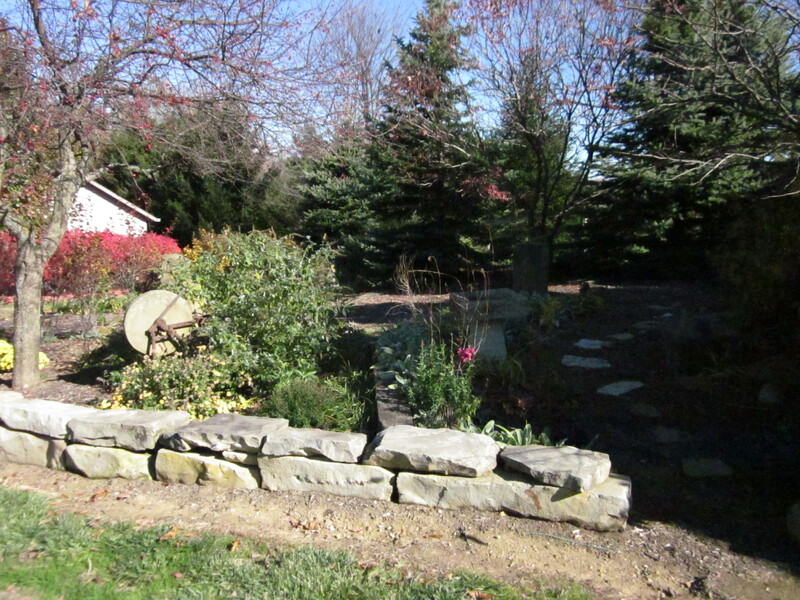 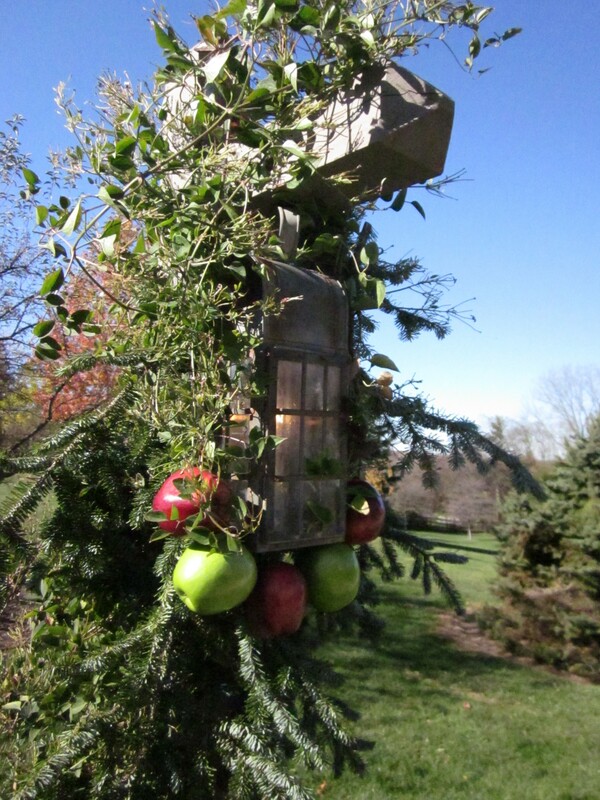 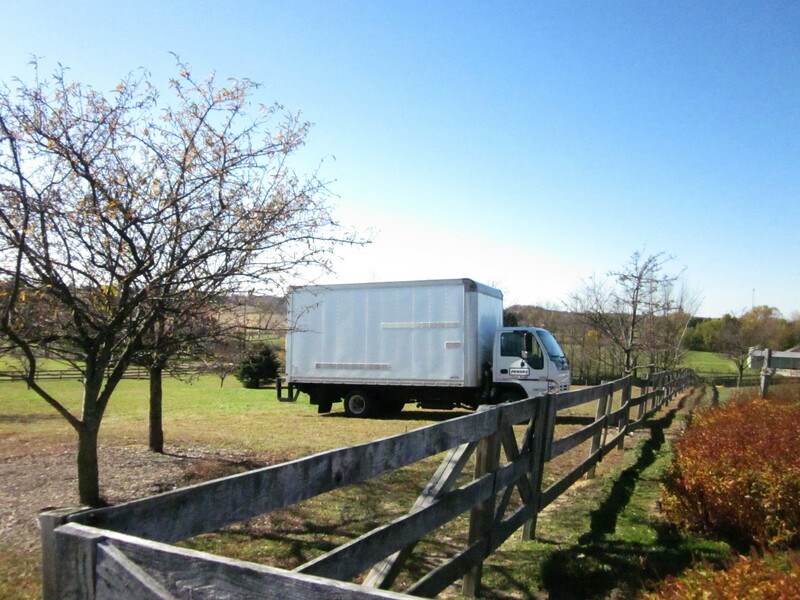 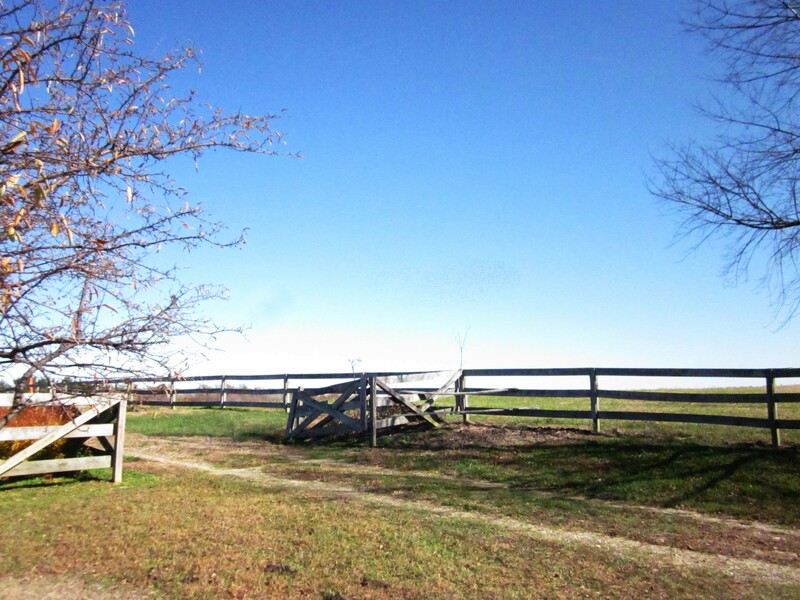 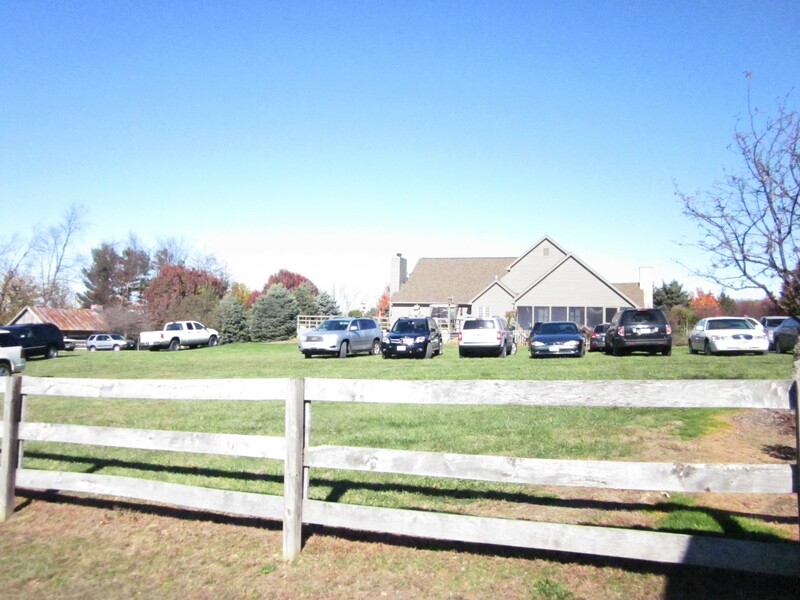 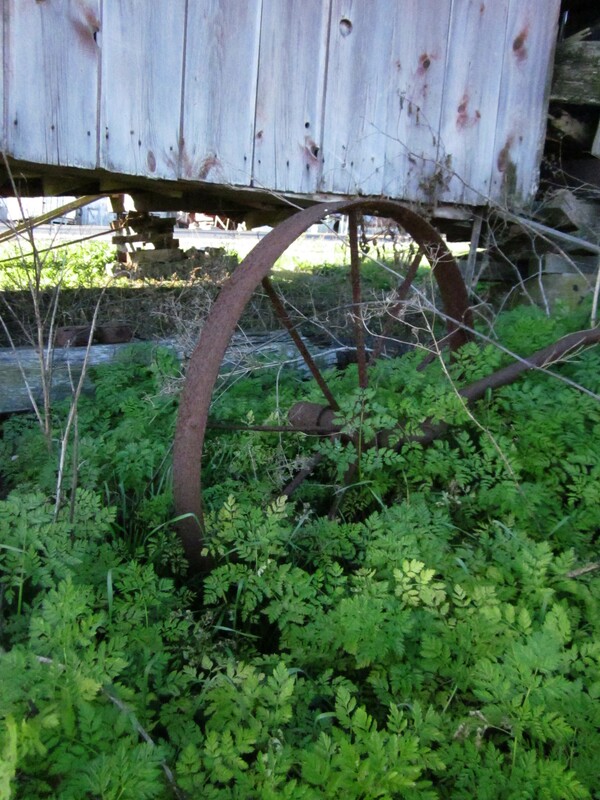 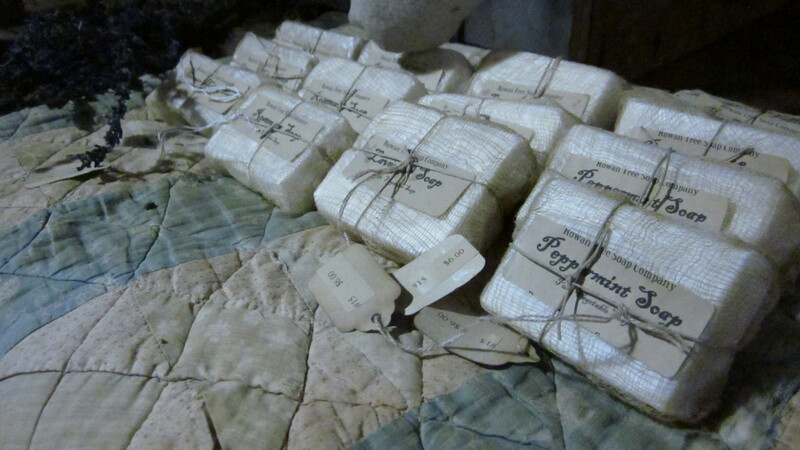 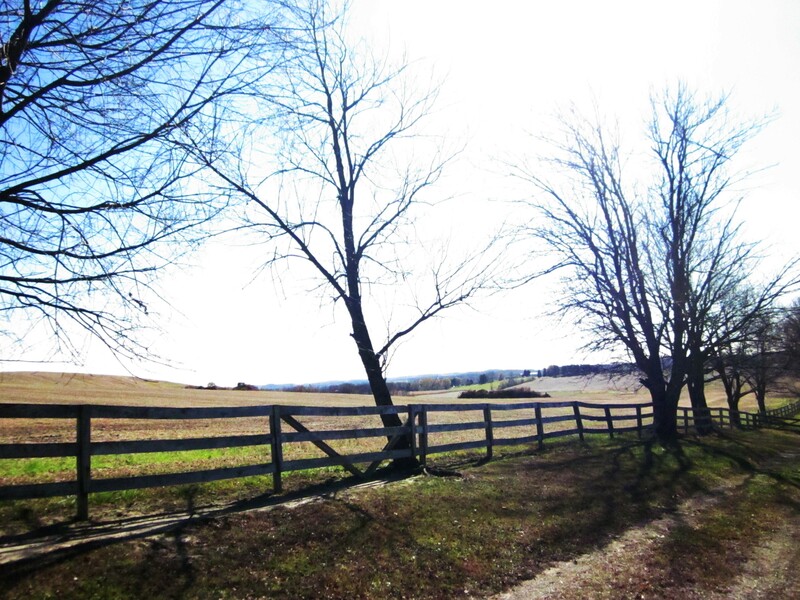 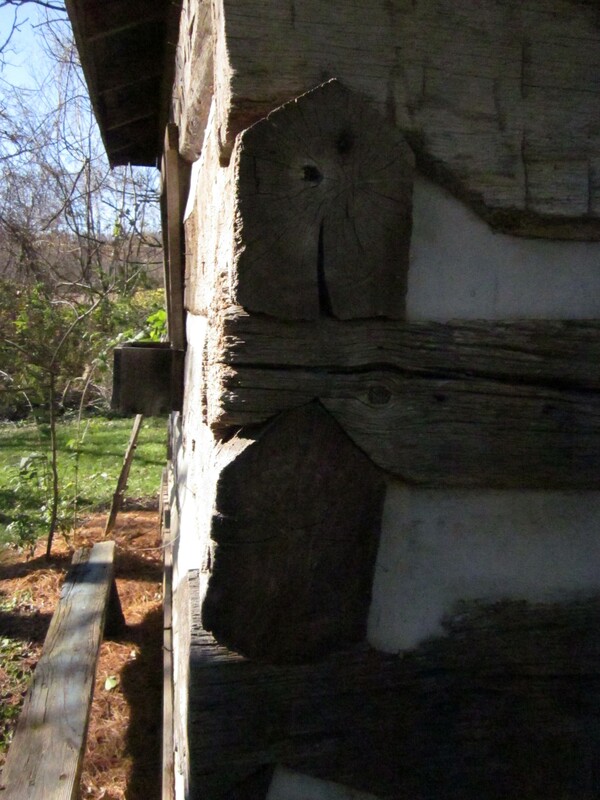 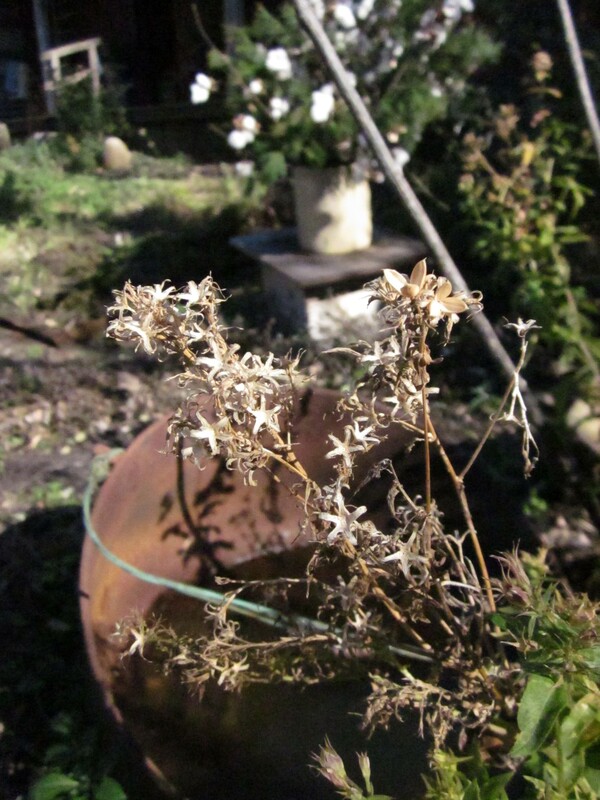 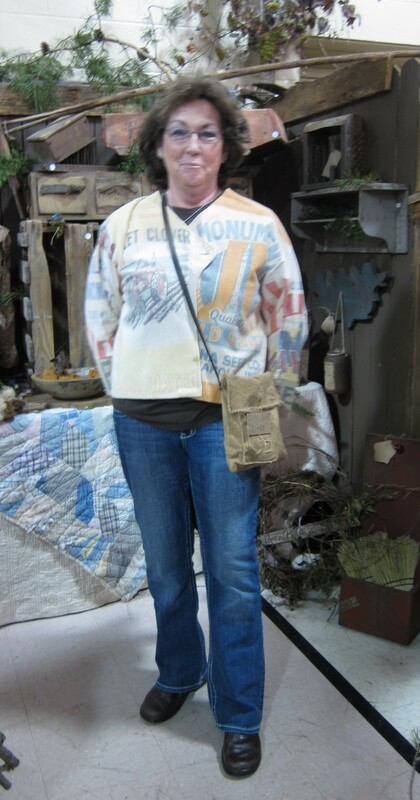 Tina Iosca’s Fences and Hedgerows – another delightful dealer we met this trip and one of Cecilia’s neighbors! 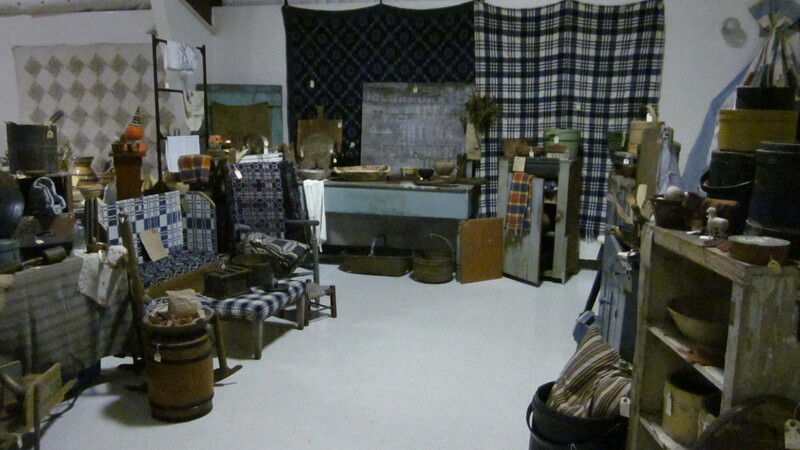 From the Farmhouse is always a great show and we weren’t disappointed! 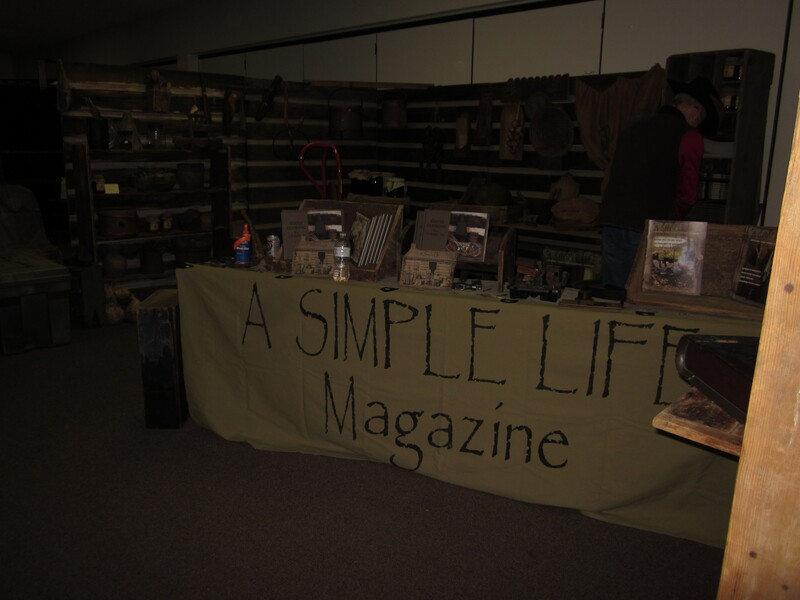 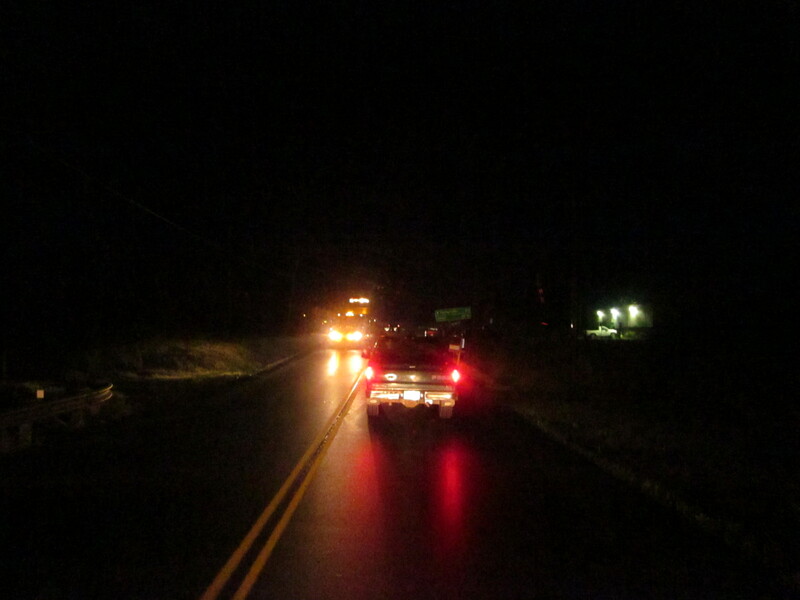 Great merchandise, wonderful customers who were brave enough to go out in miserable weather… rain, which turned to snow… we only ended up with an inch in this section of Pennsylvania and Maryland, BUT the folks back home weren’t so lucky! 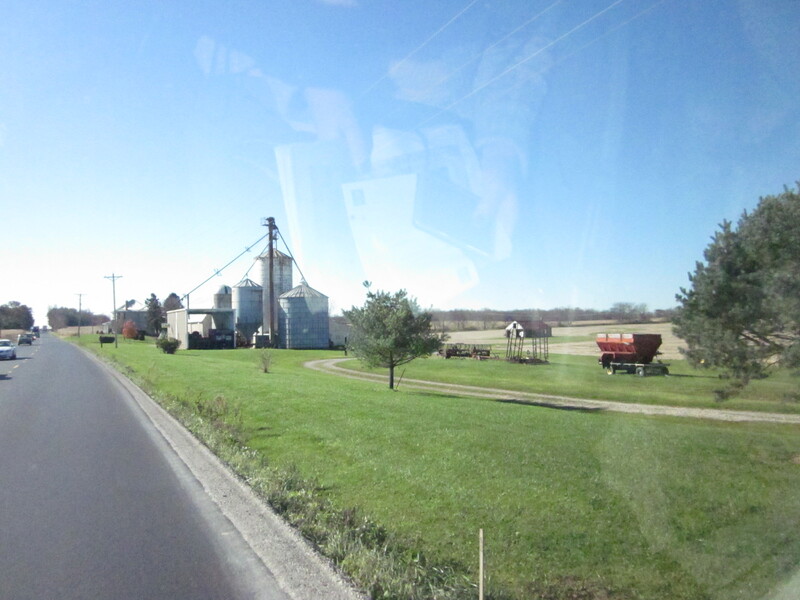 Our husbands were faced with power outages, heavy snow and broken trees… guess we chose the right time to go on a road trip! 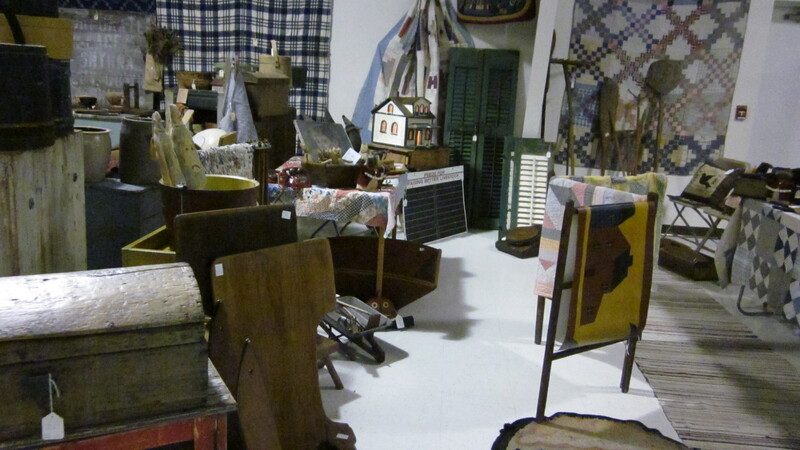 AND, there’s more to come! 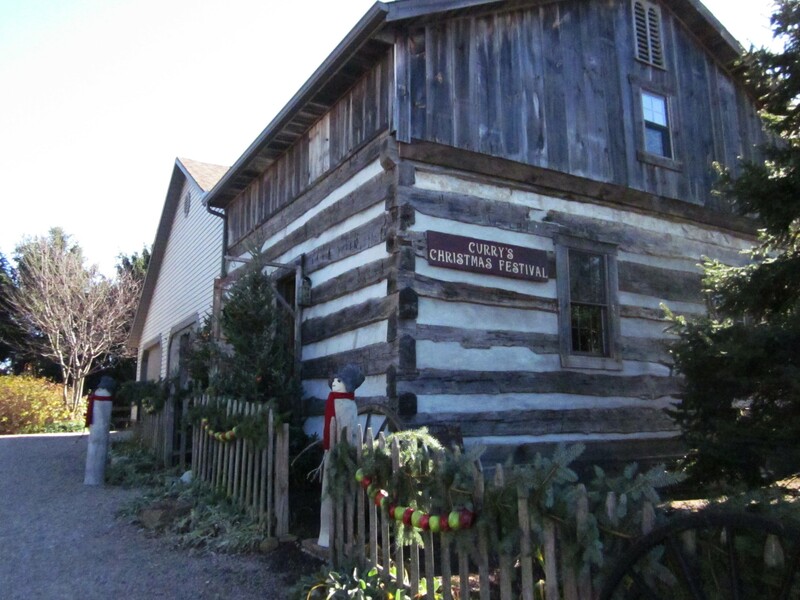 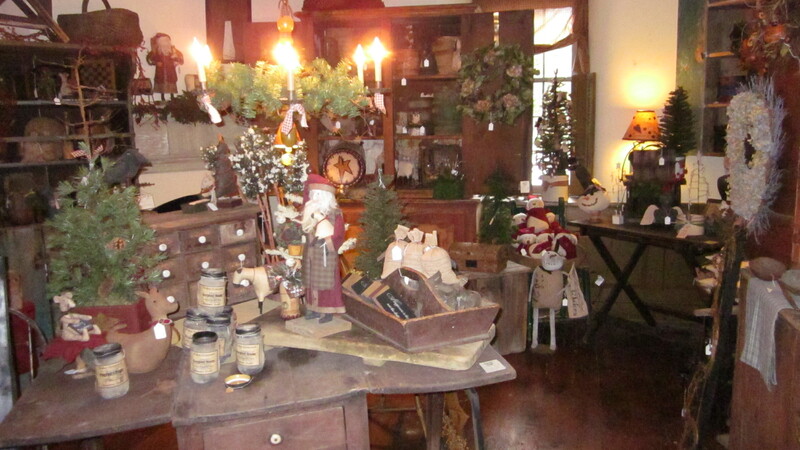 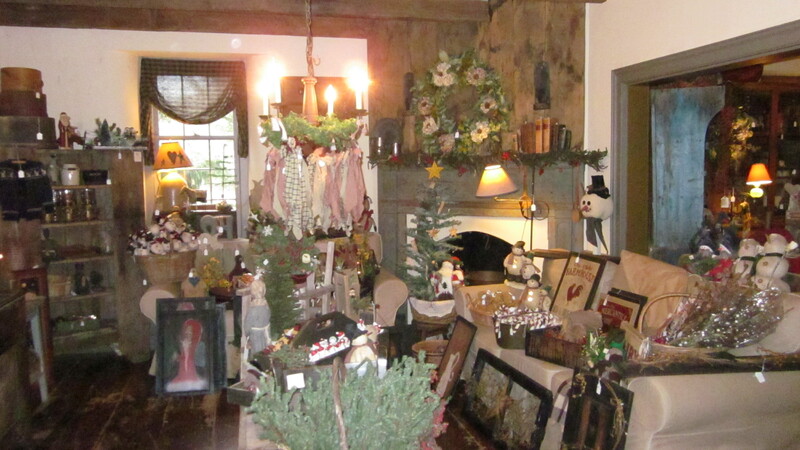 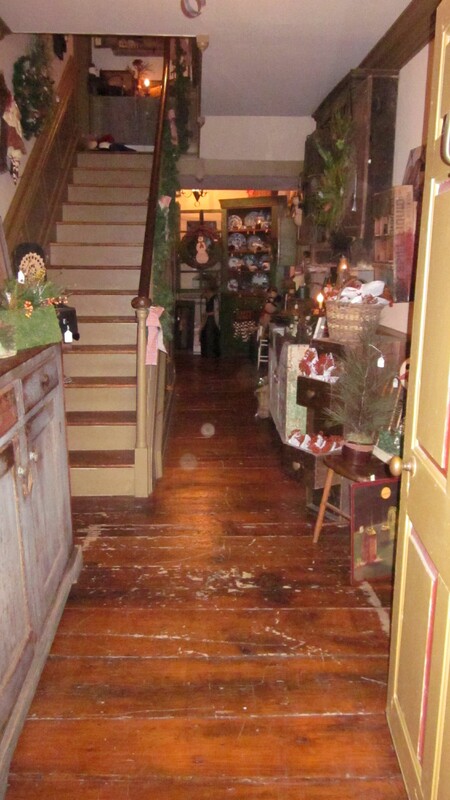 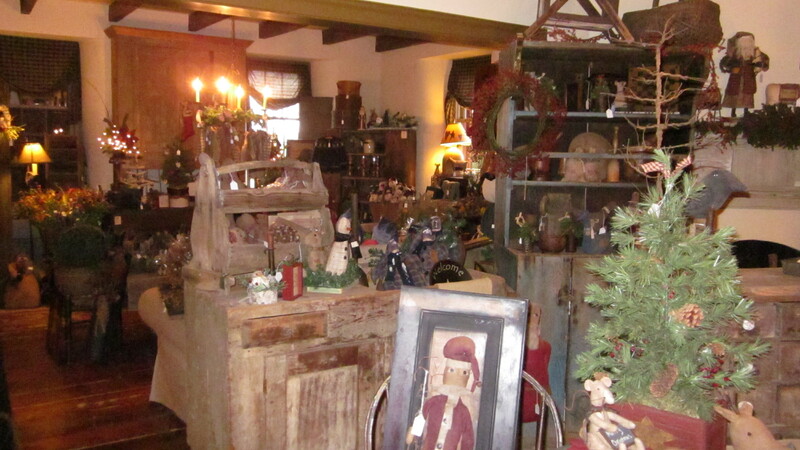 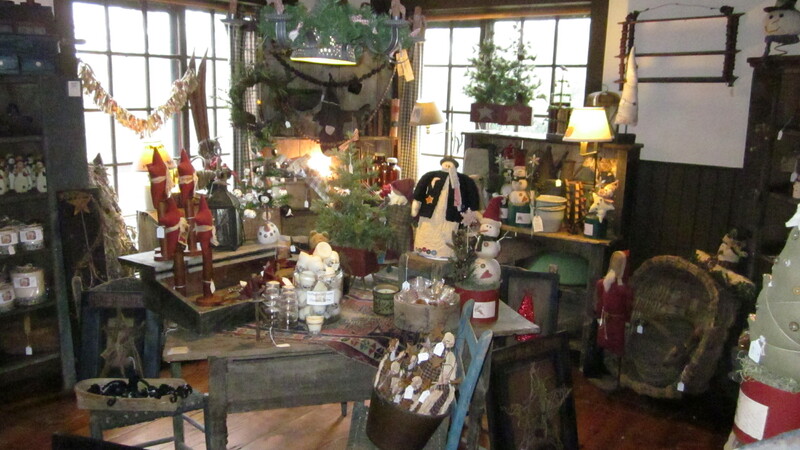 Diane Windle’s gorgeous home (Windle’s Log Cabin Antiques) of log and stone in Coatesville, PA was our first stop as we set up for her 4 day Christmas Open House event. 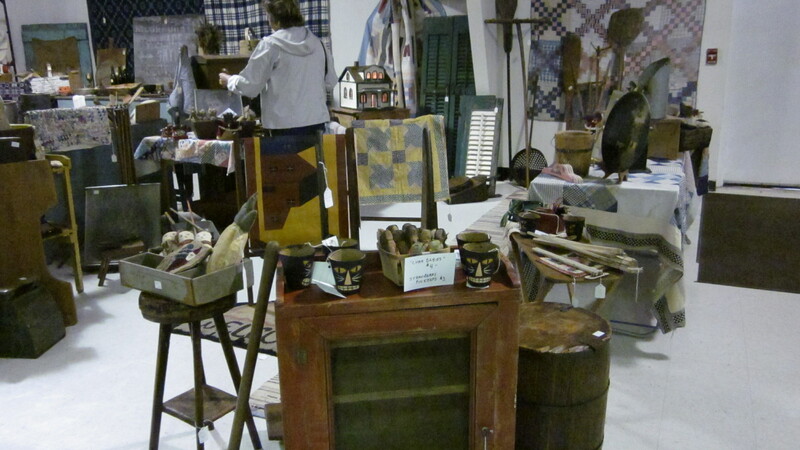 Crafters set up their wares throughout Diane’s home amongst beautiful antiques, most of which are for sale. 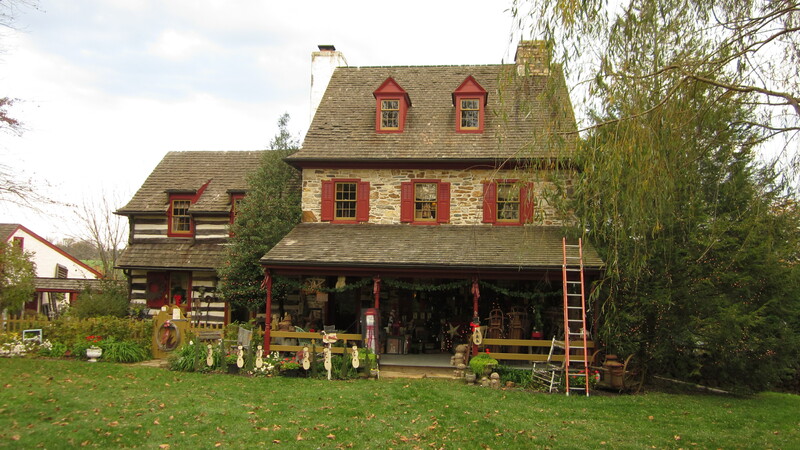 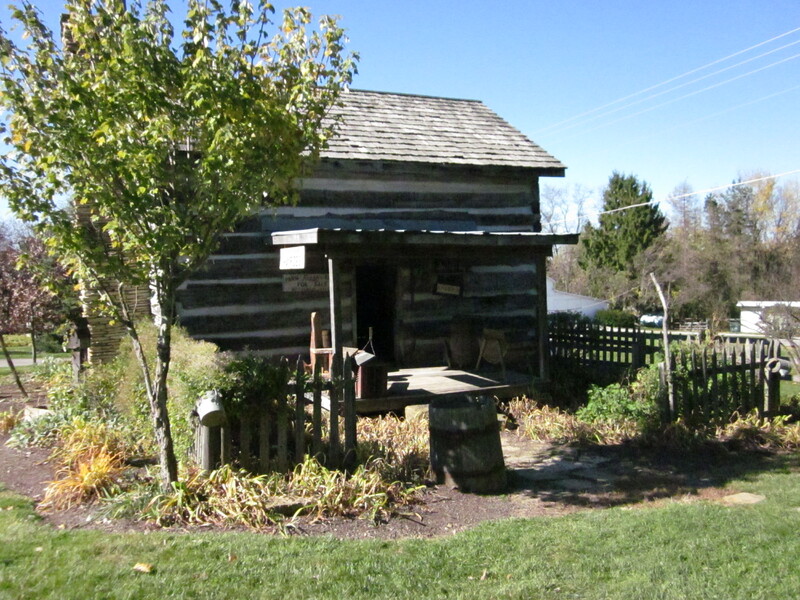 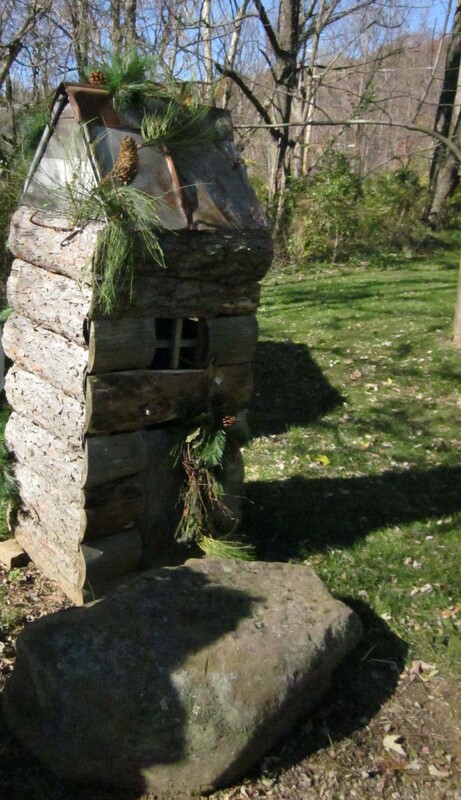 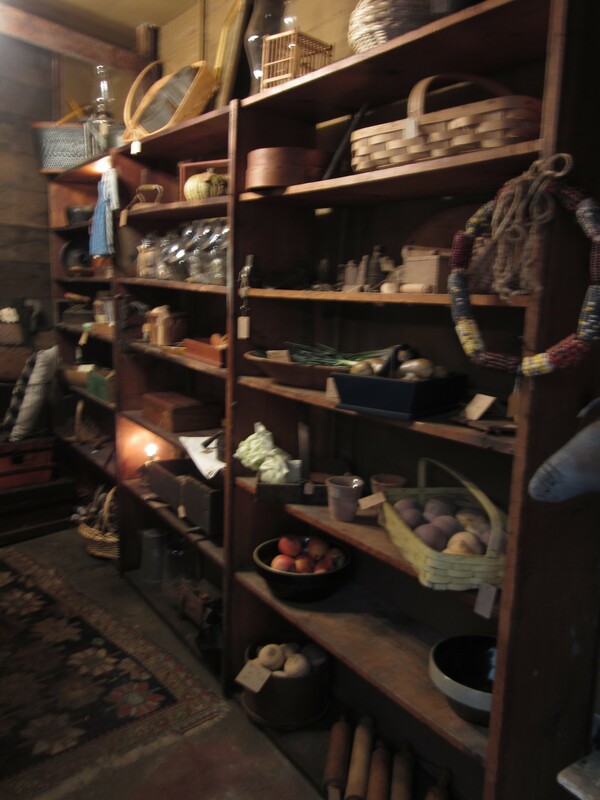 Windle’s Log Cabin Antiques is one of our favorite shops in Pennsylvania and we make the effort to stop there each visit. 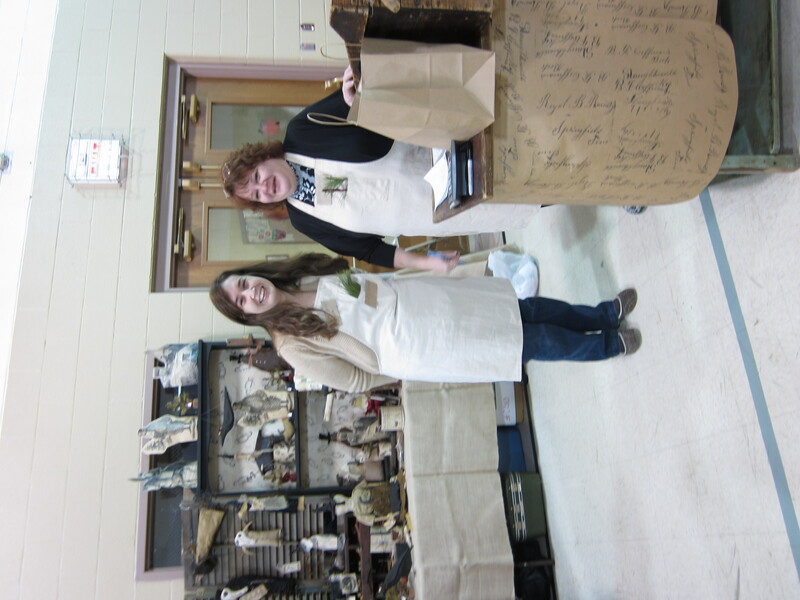 For this event, we set up crafts throughout Diane’s house on Wednesday and worked the open house Thursday and Sunday. 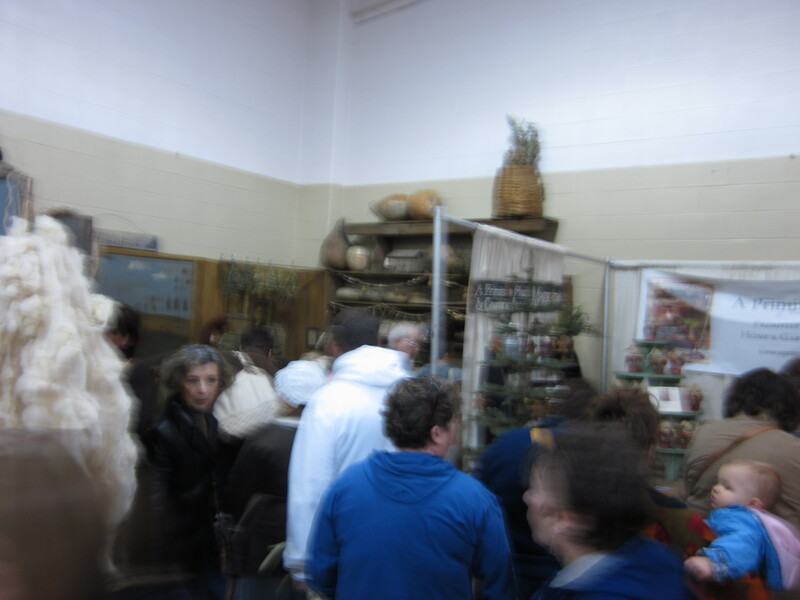 Thousands of people pass through for this annual event and this year was no exception… even with a bit of a weather event! 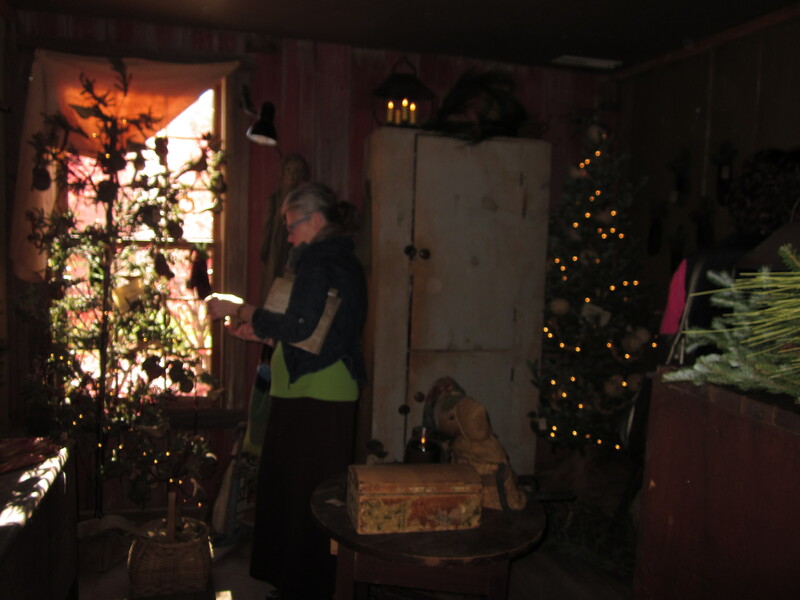 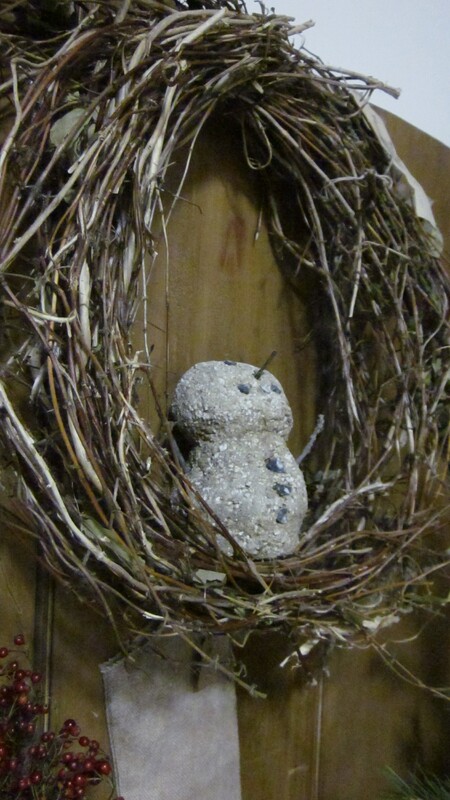 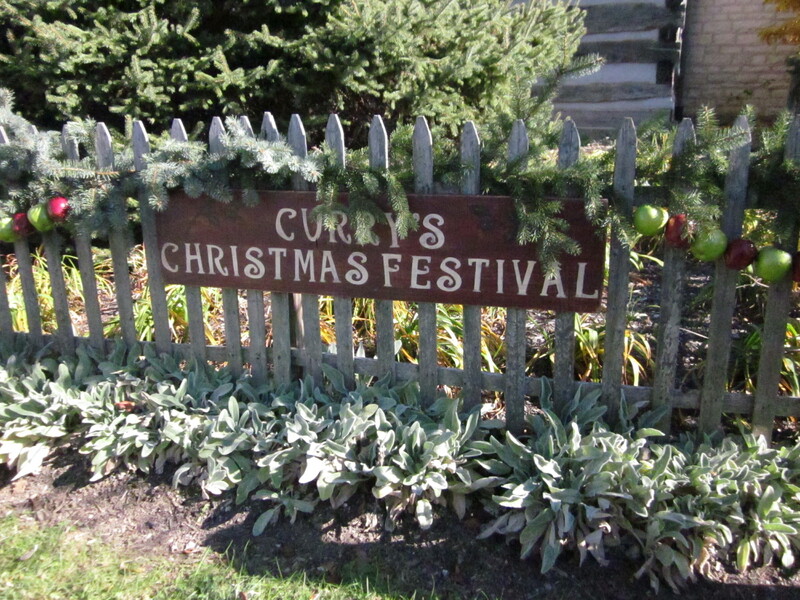 Diane’s porch was fully decorated with Christmas crafts, greeting each and every visitor. 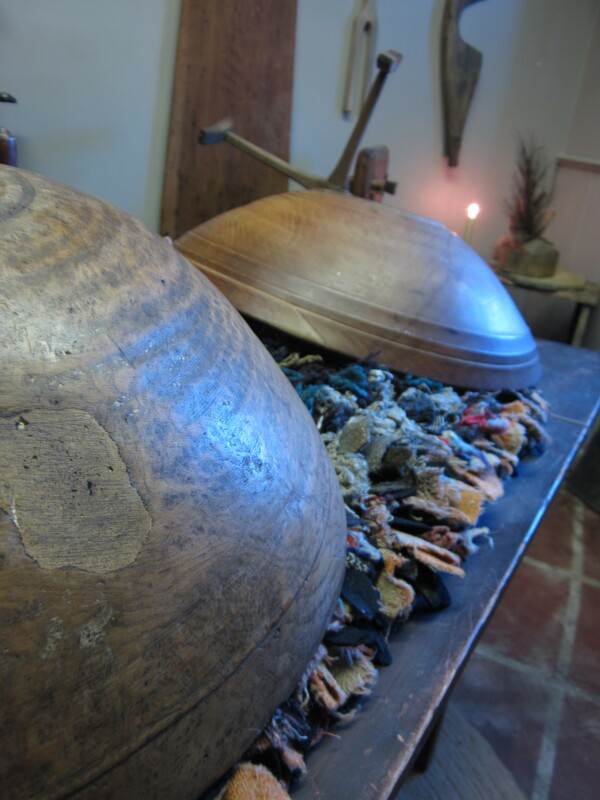 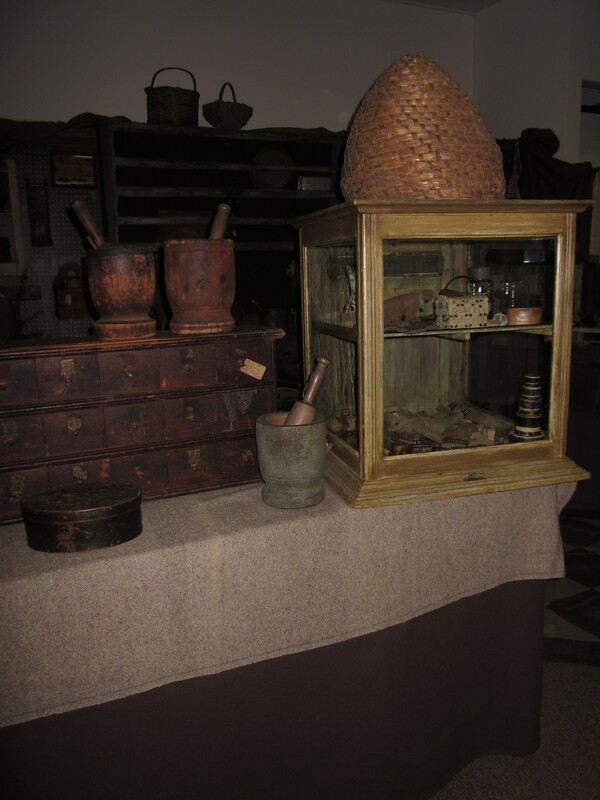 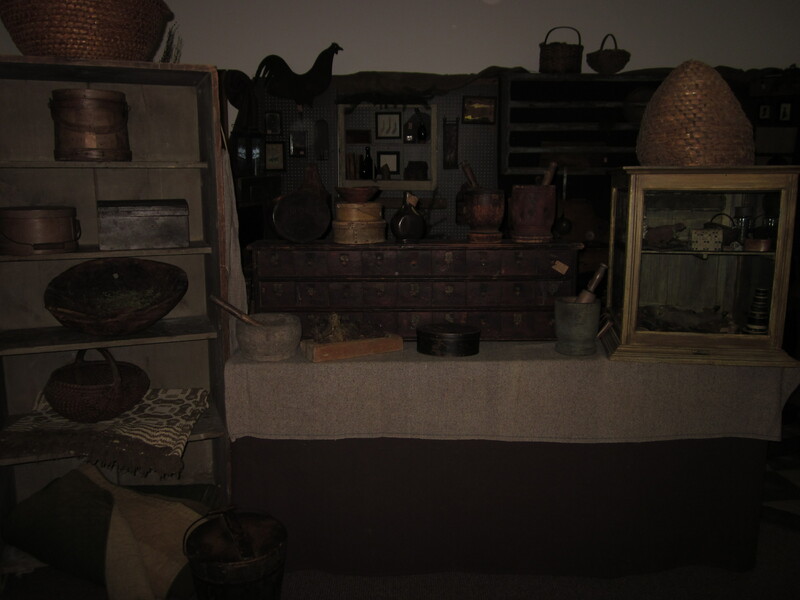 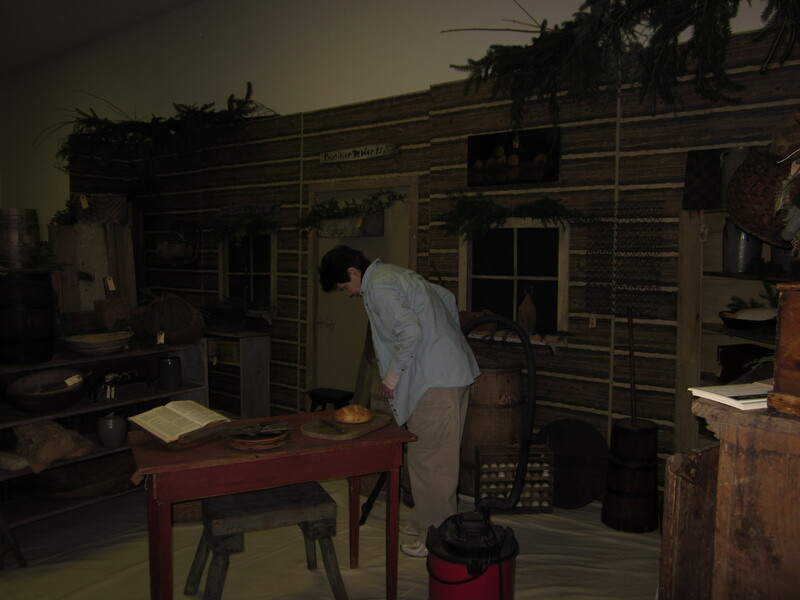 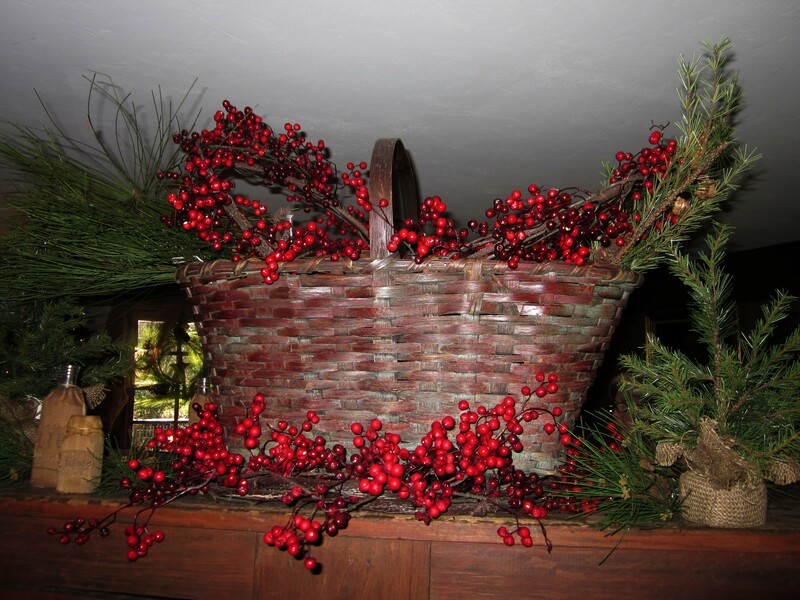 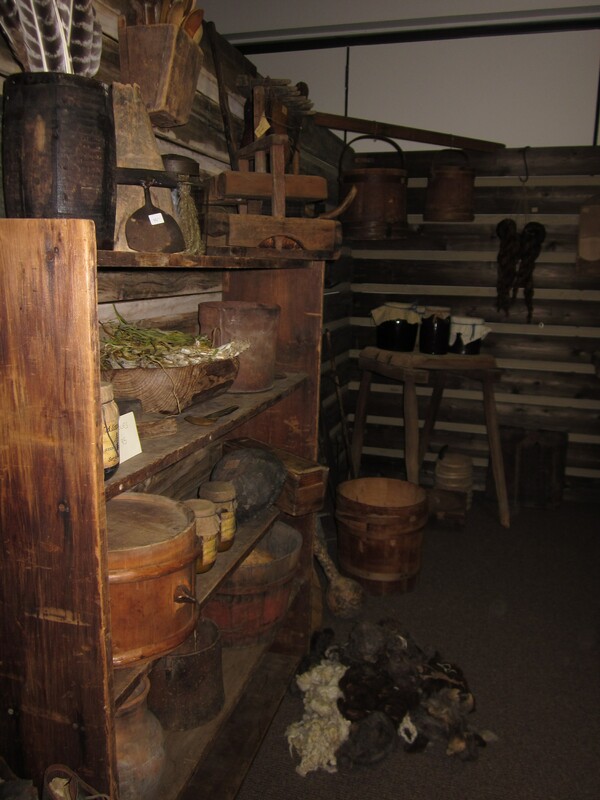 There were baskets for shoppers to gather their choices available and workers would carry them to check-out. 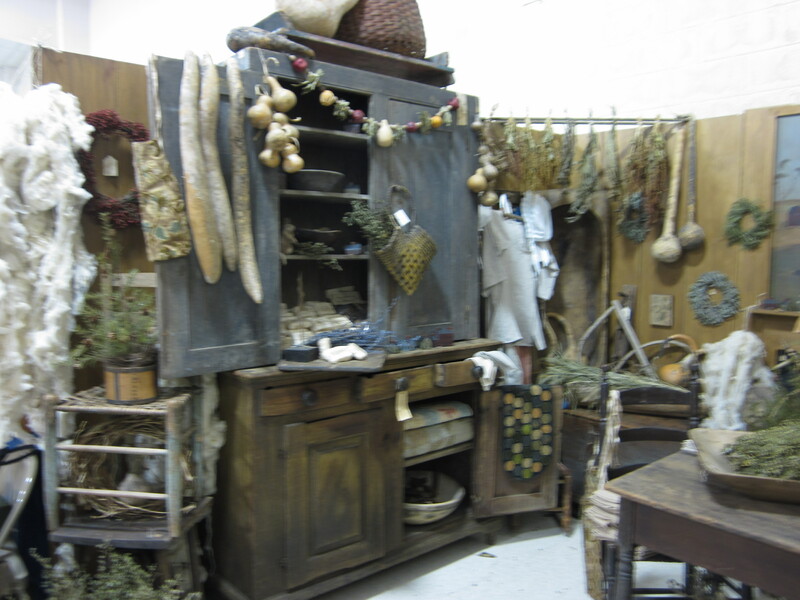 look at this fabulous dry sink filled to the brim with merchandise! 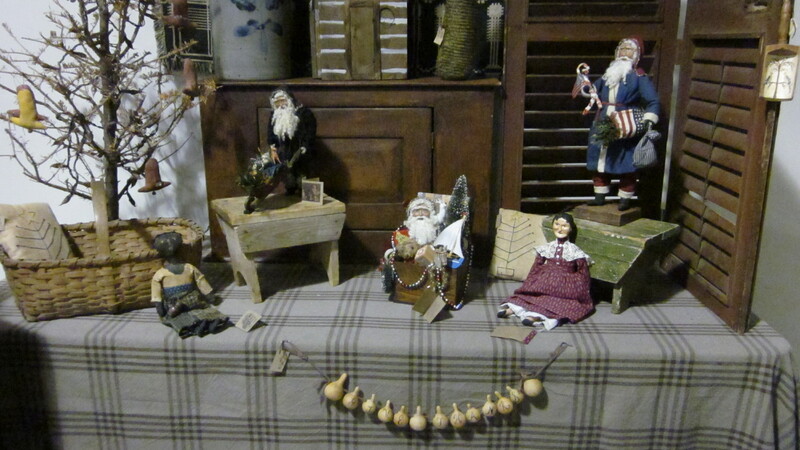 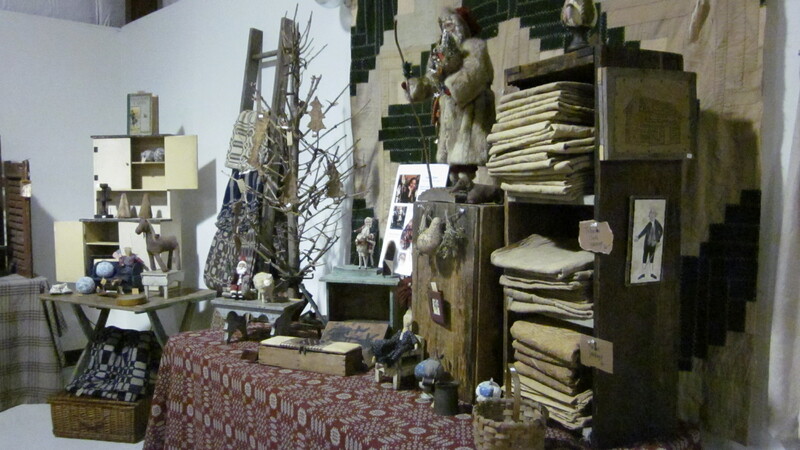 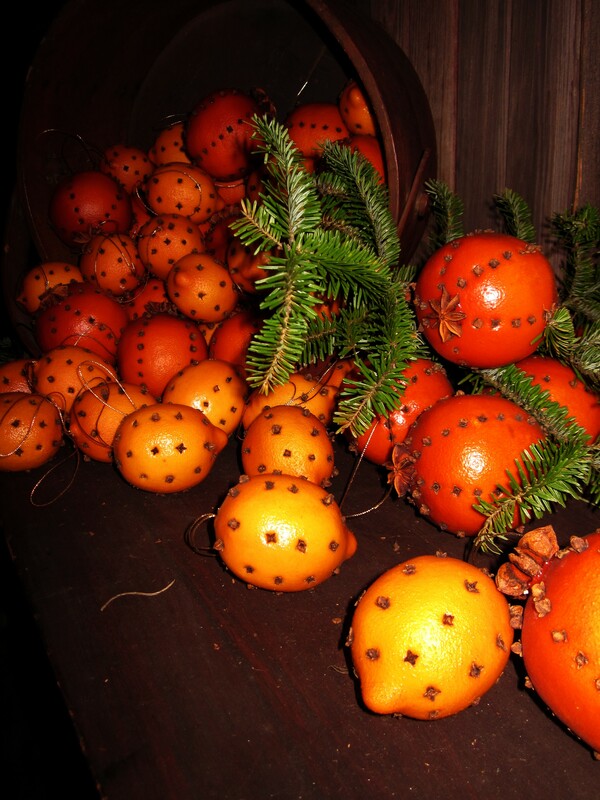 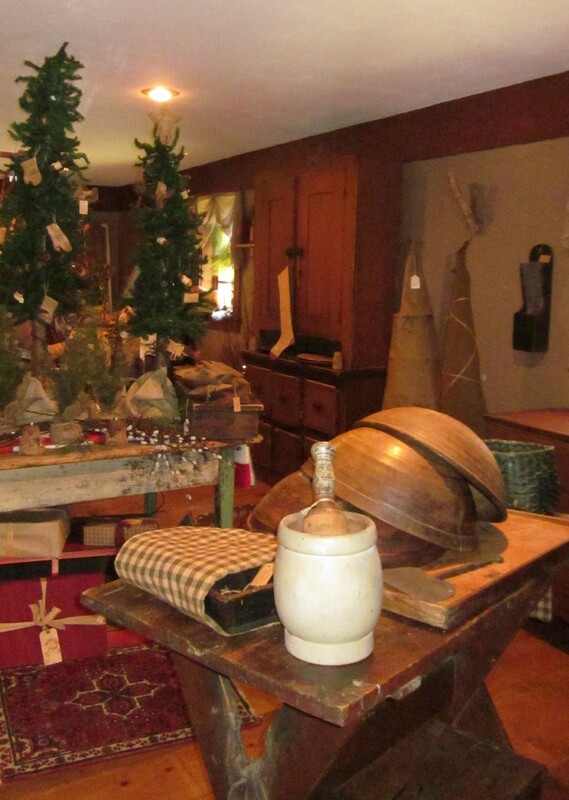 All sorts of Christmas treats spilling out of the antiques! 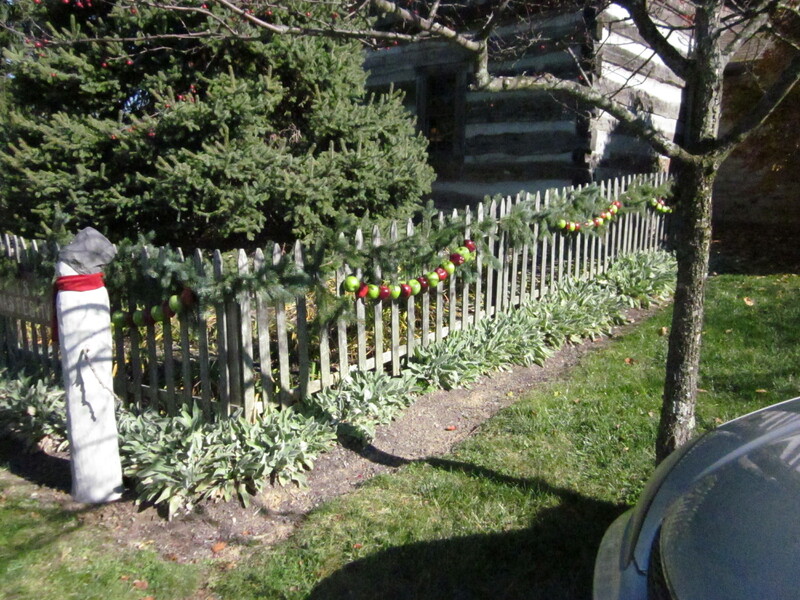 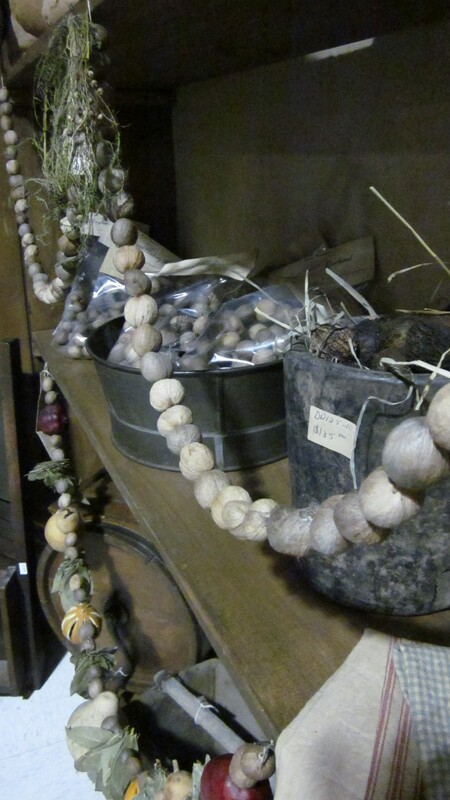 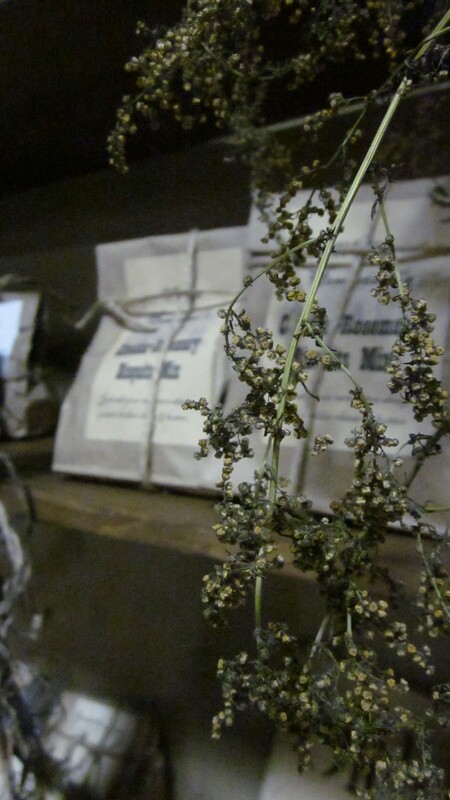 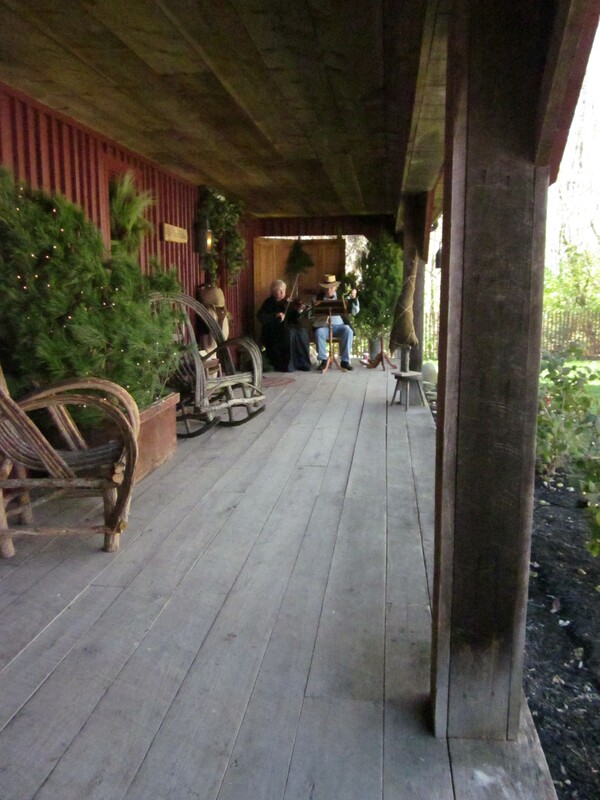 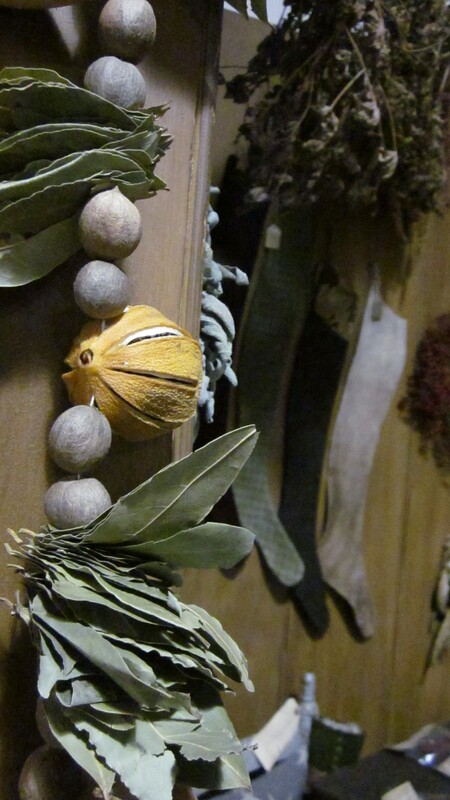 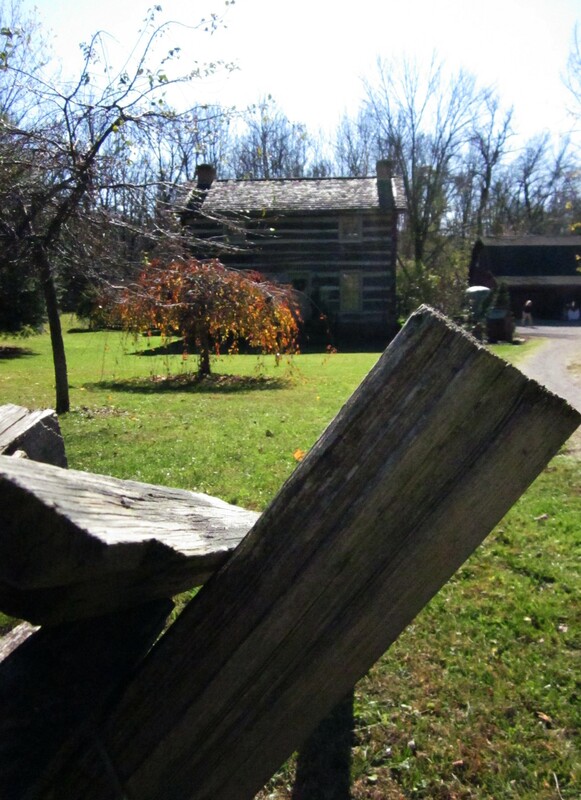 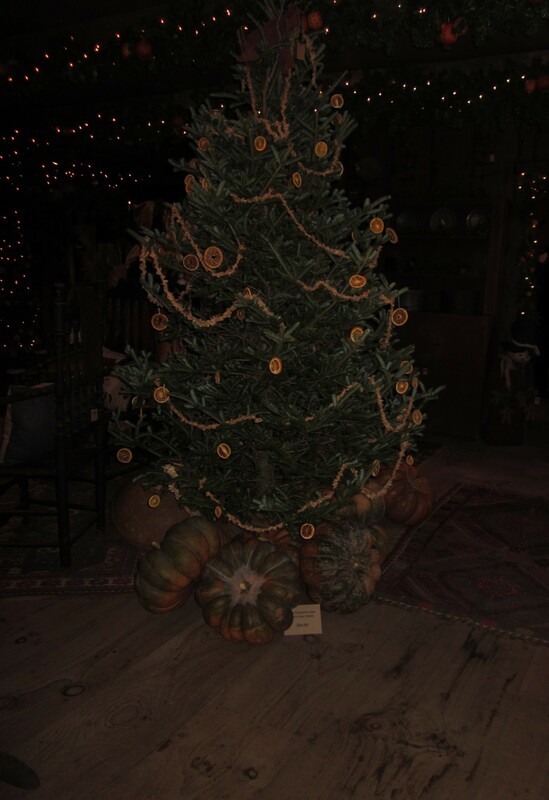 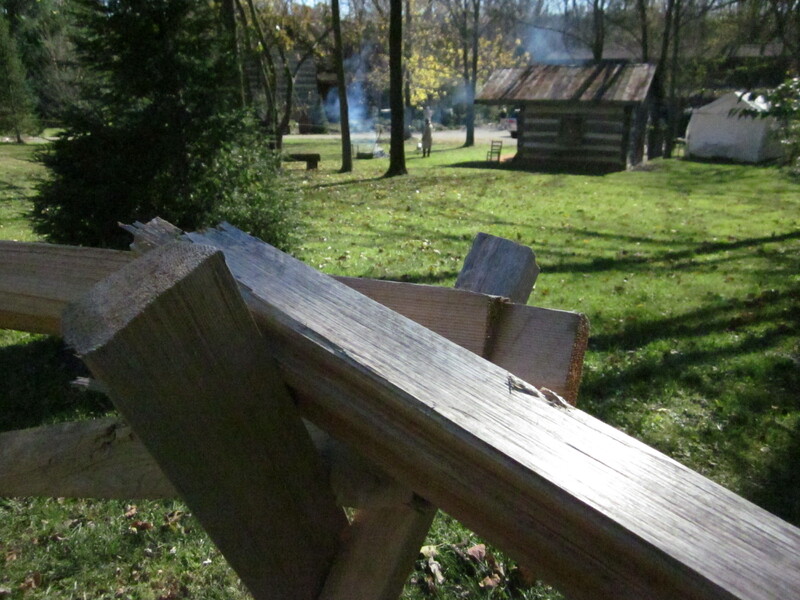 Some of Walker Homestead‘s garlands in the background. 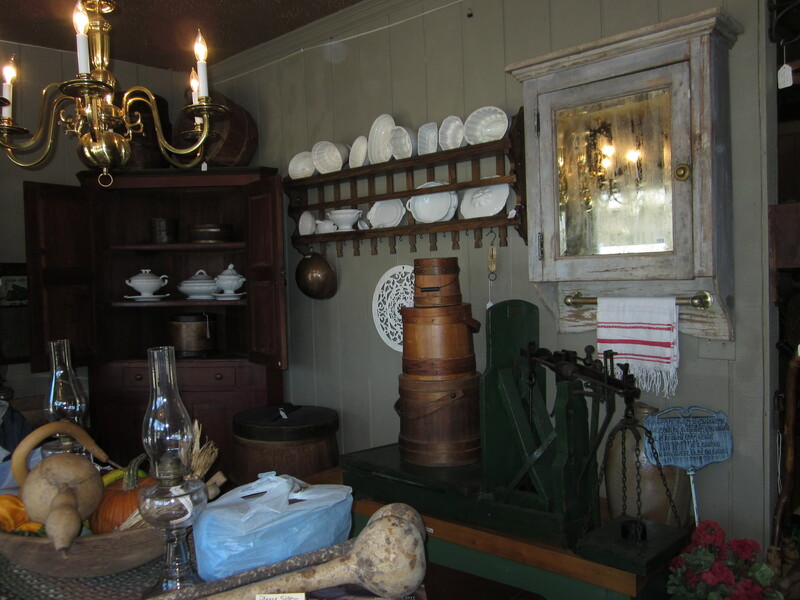 Even the kitchen was filled with sweet gifts; dip mixes, spiced cider mixes, apple crisp mixes, chai mixes, jellies & pumpkin and banana cake rolls… yummmmmmm! 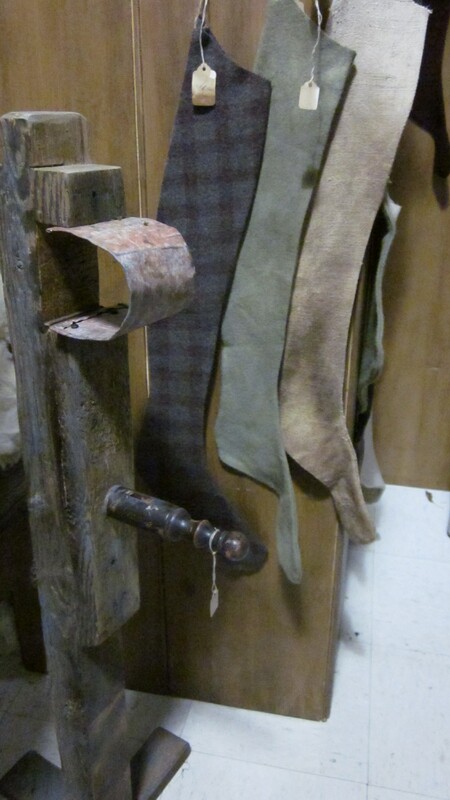 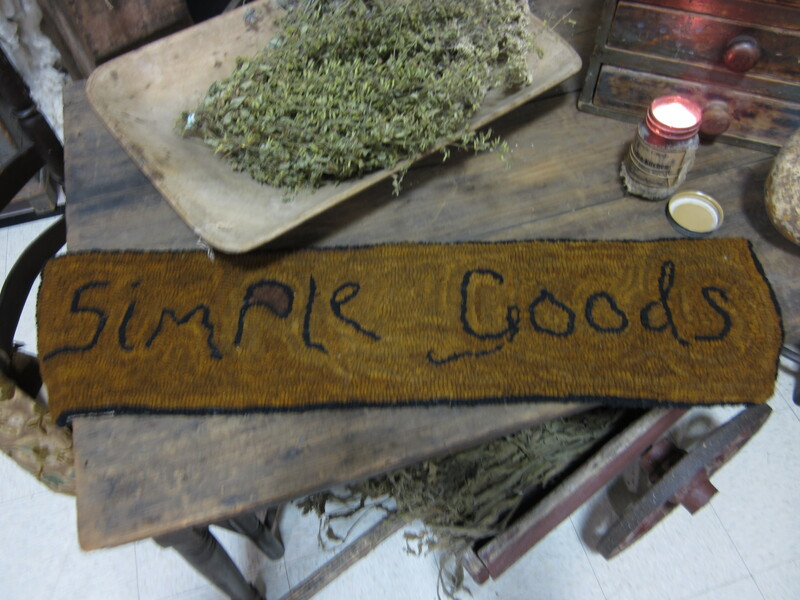 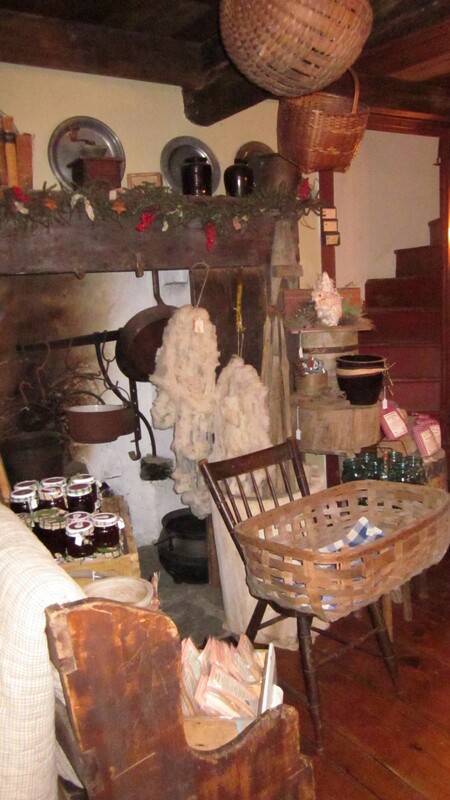 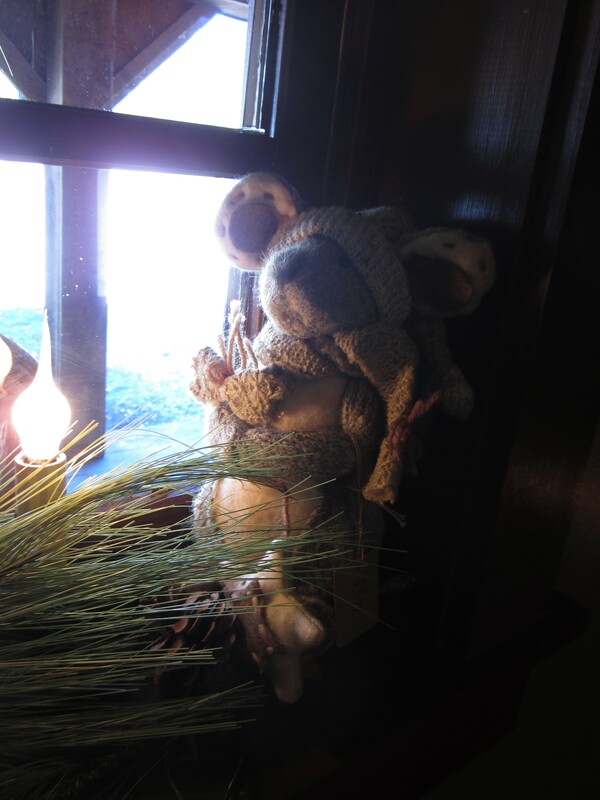 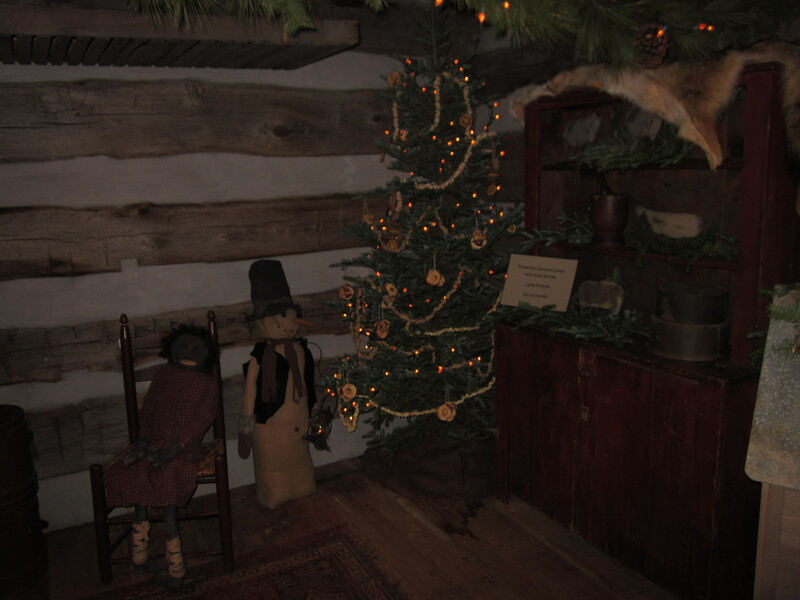 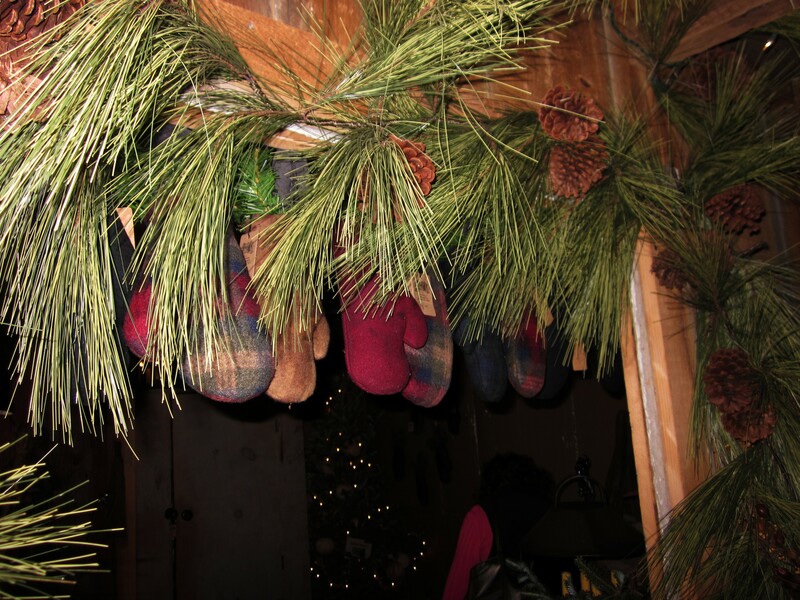 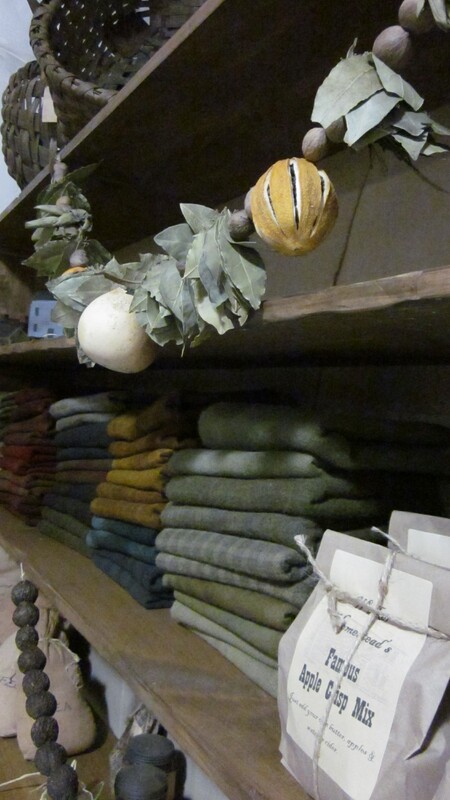 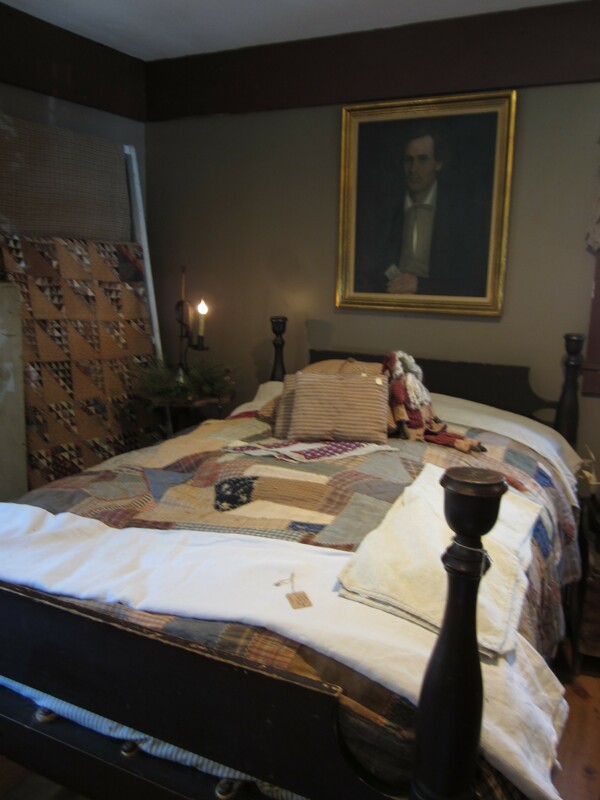 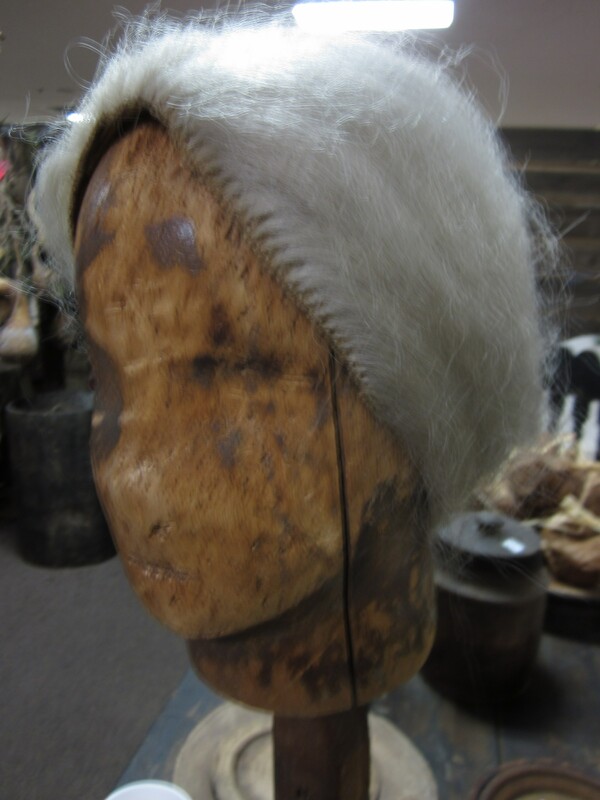 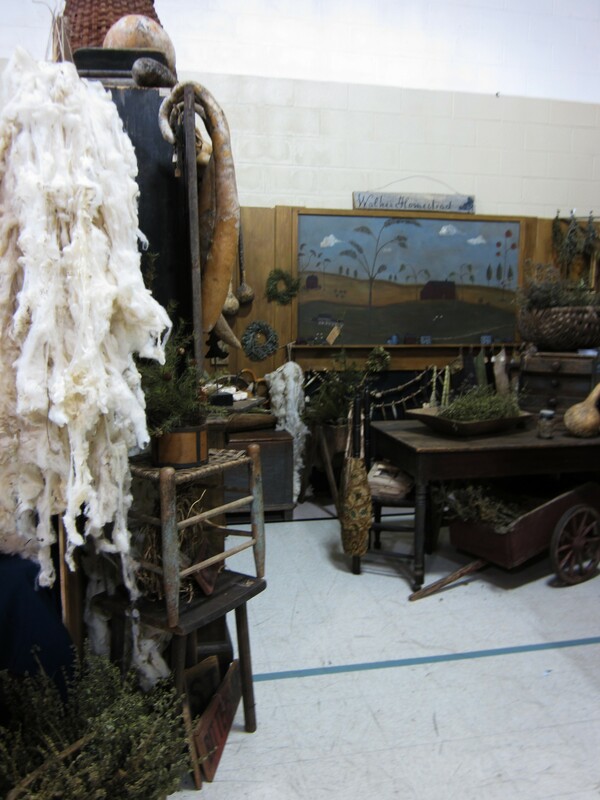 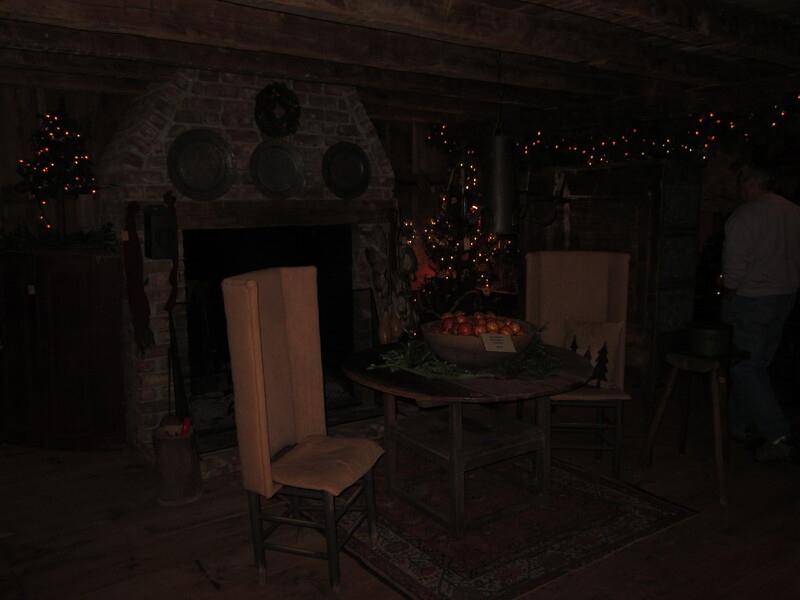 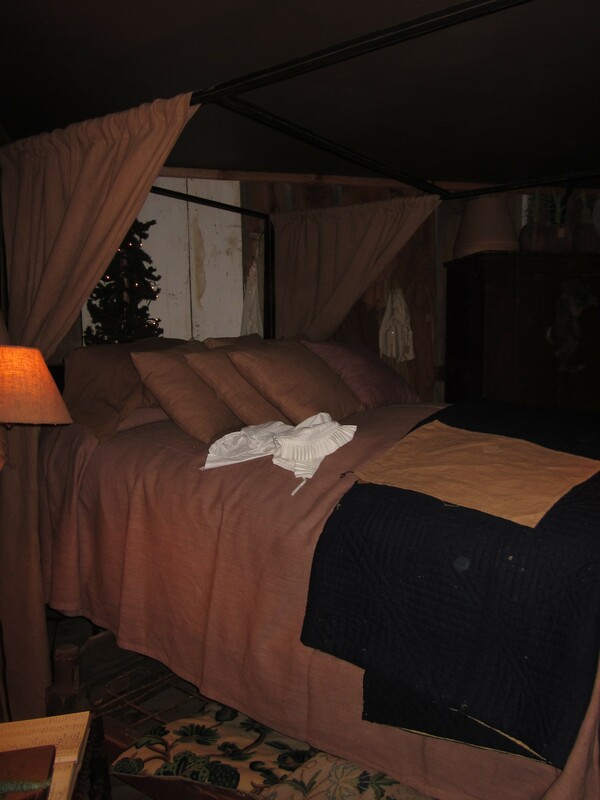 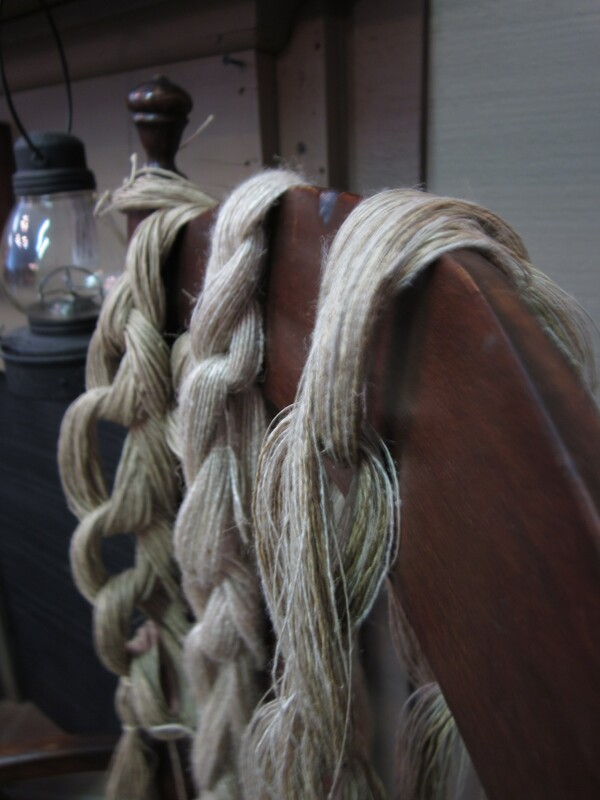 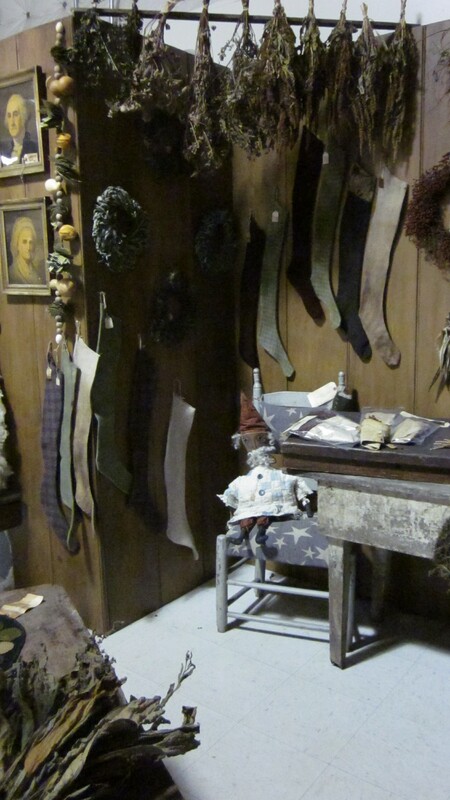 Hmmmmm… I spy some Walker Homestead wool hanks hanging by the fireside! 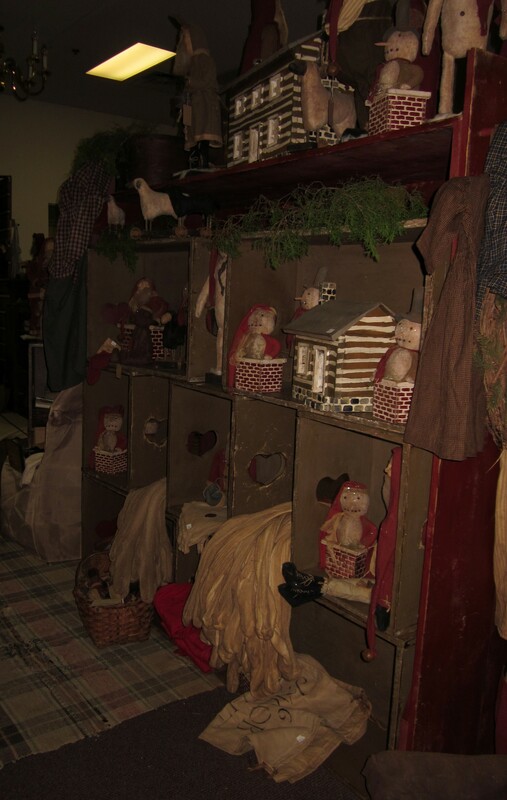 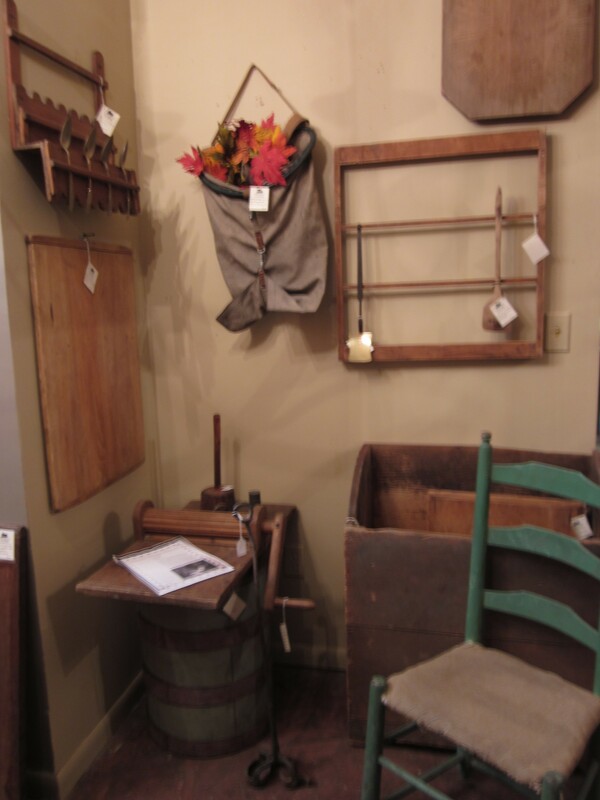 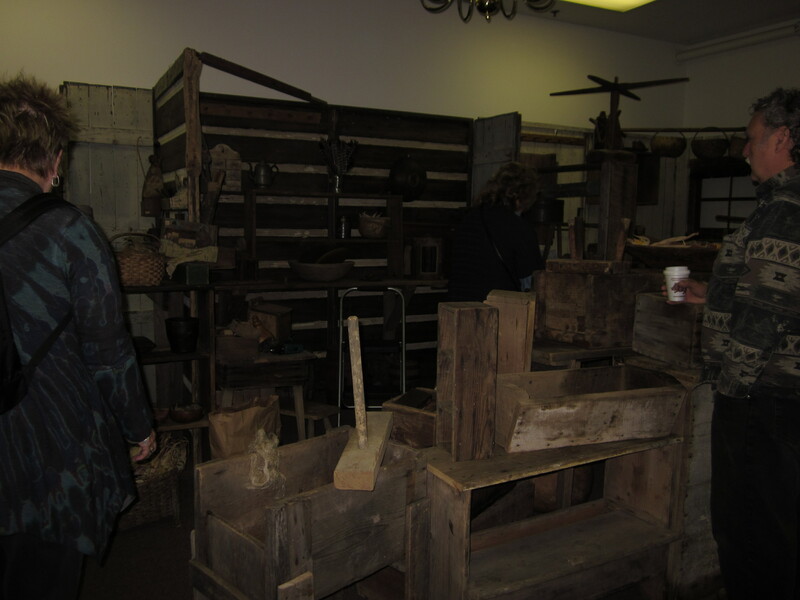 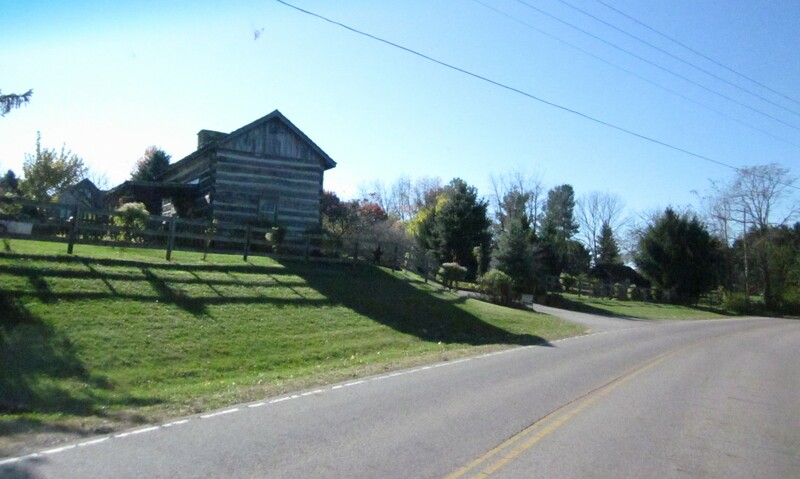 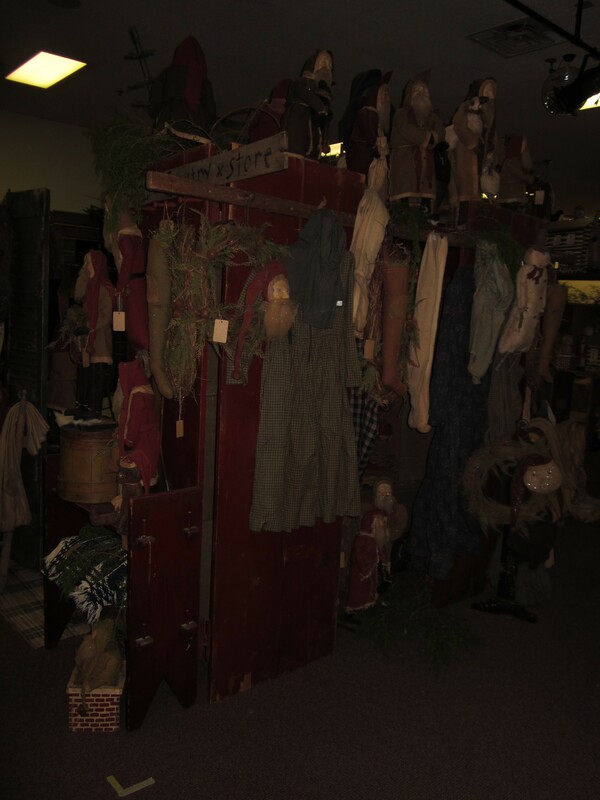 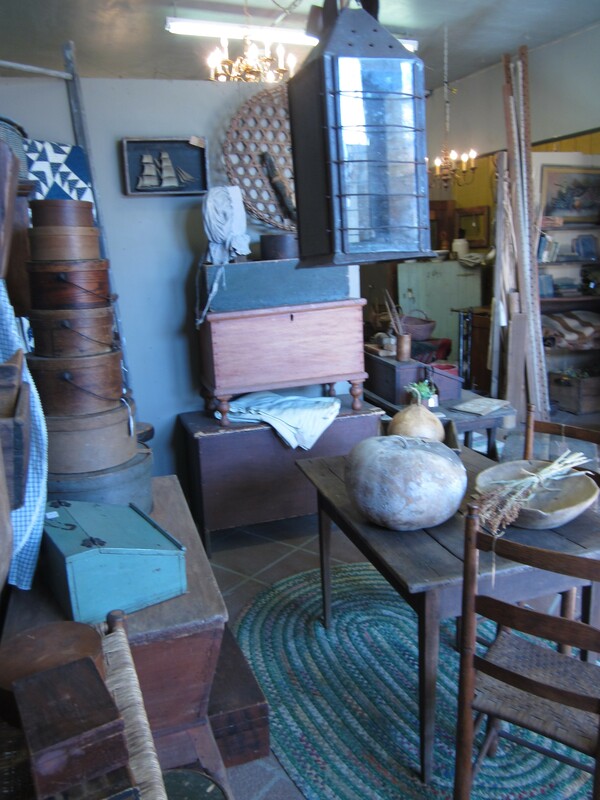 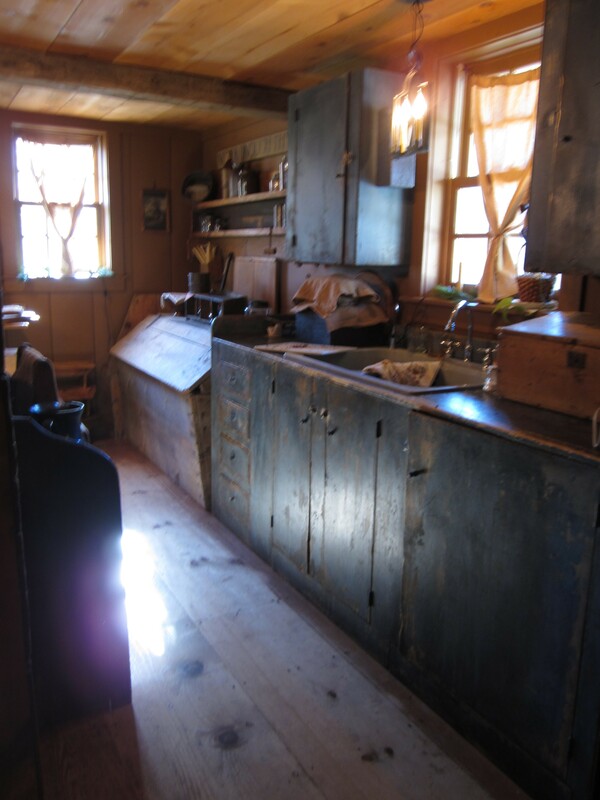 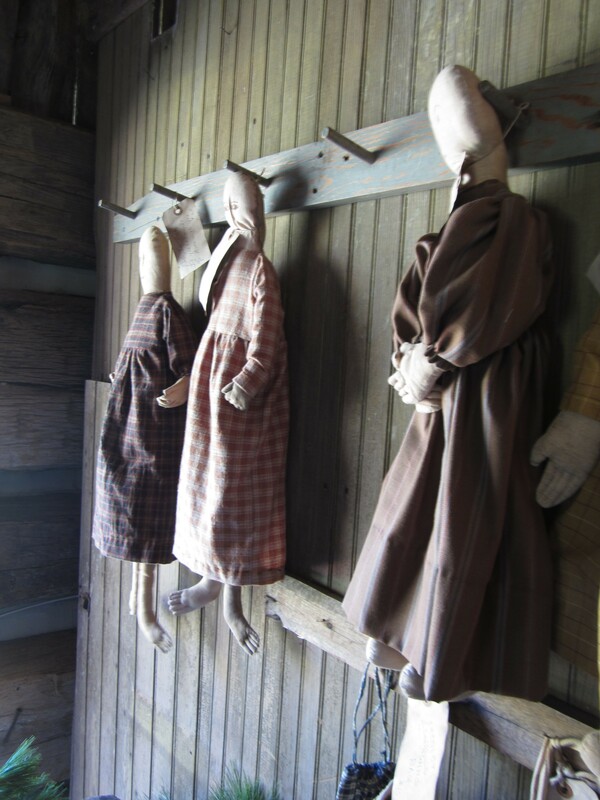 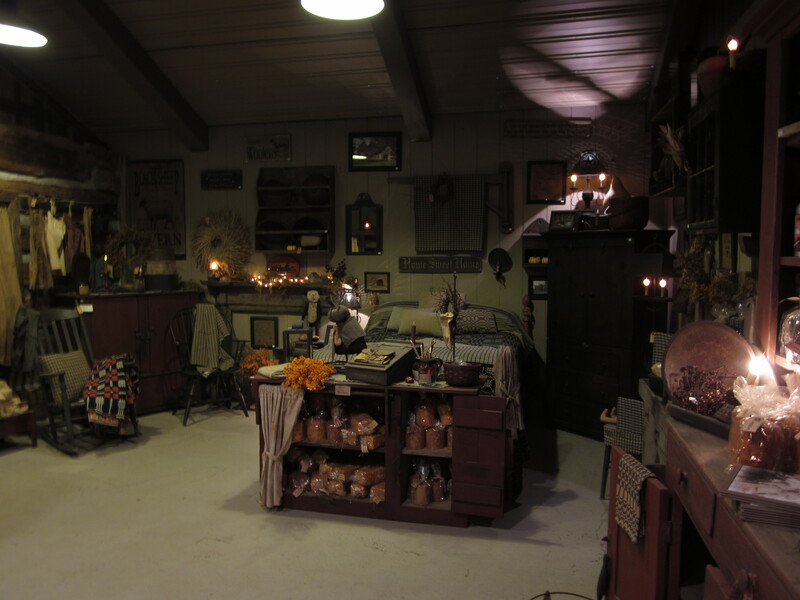 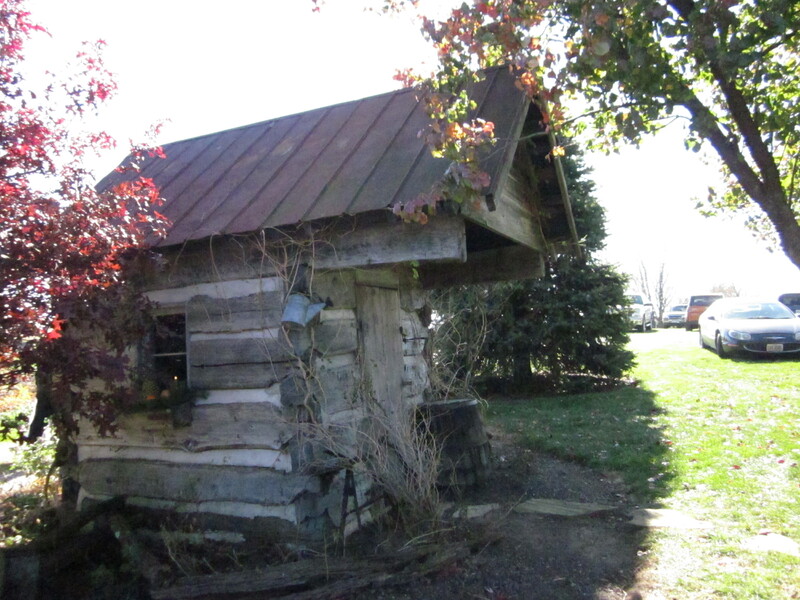 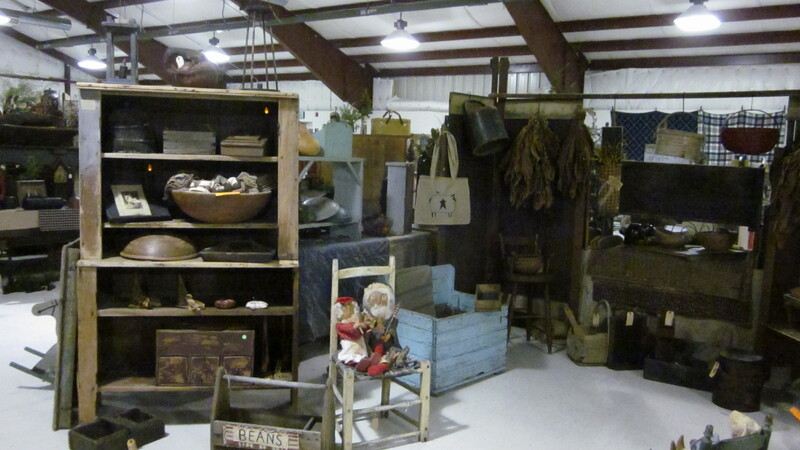 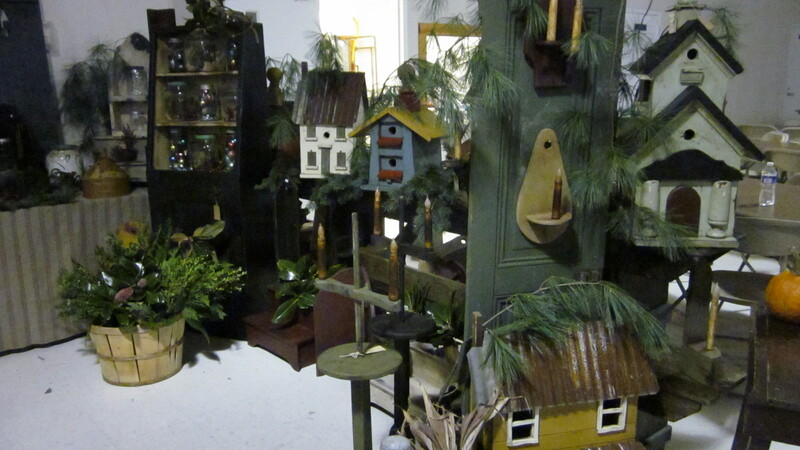 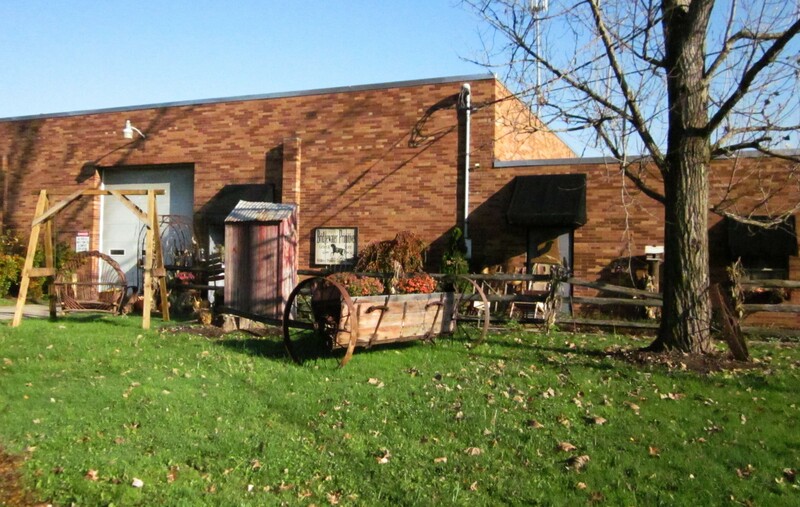 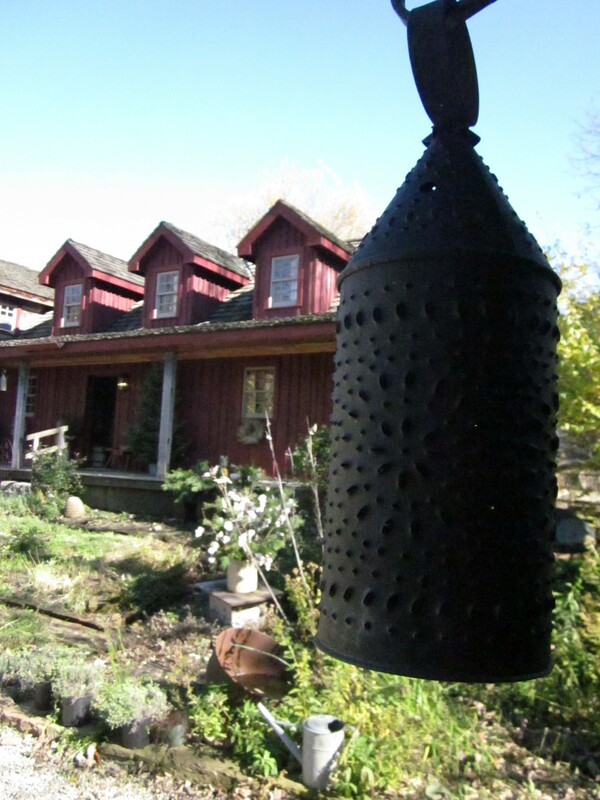 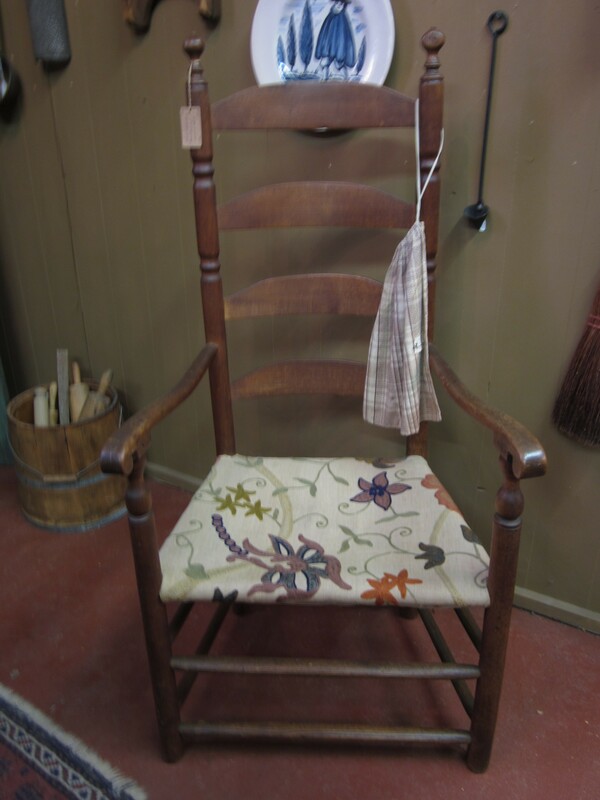 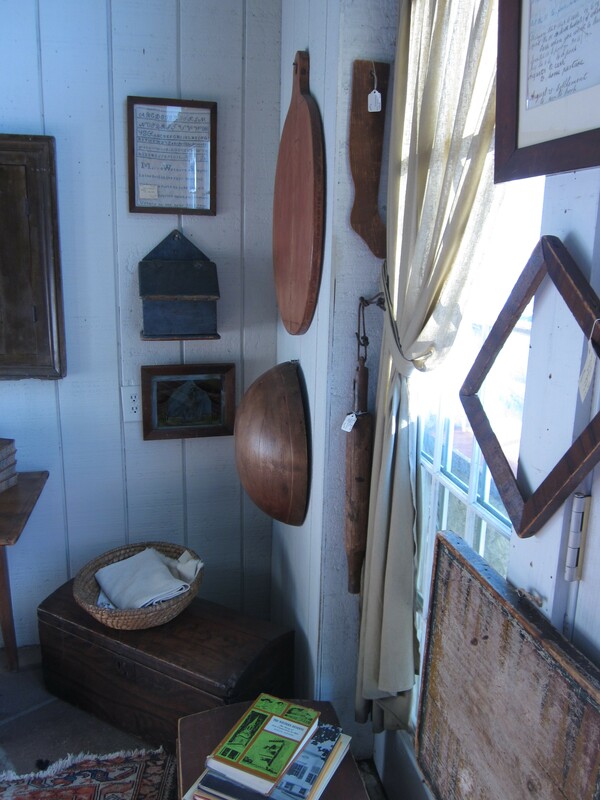 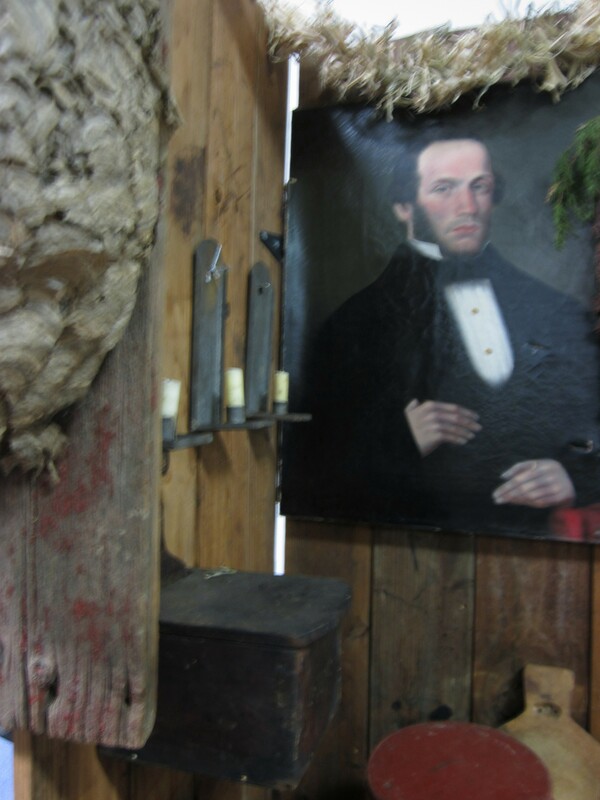 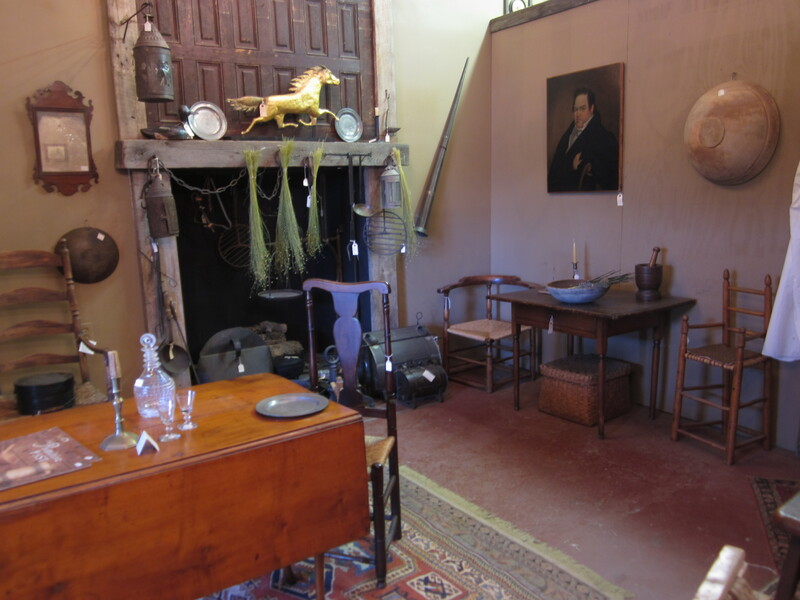 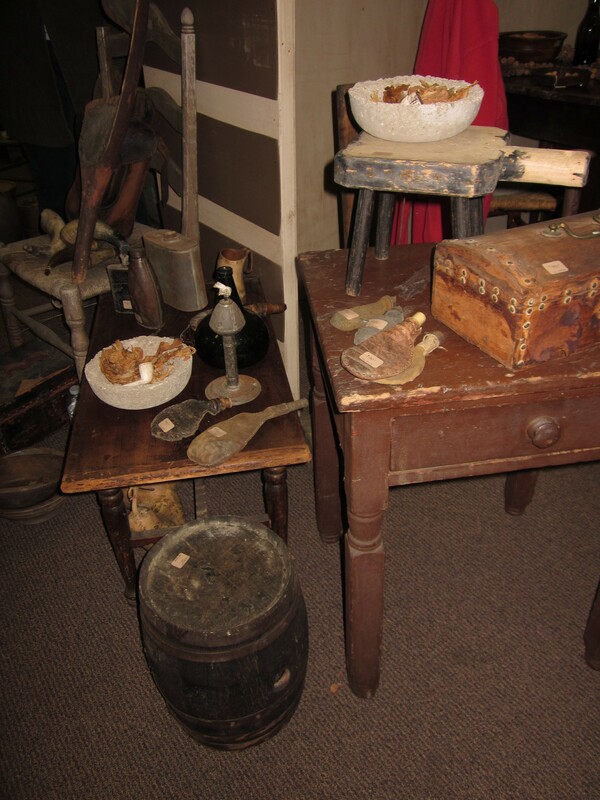 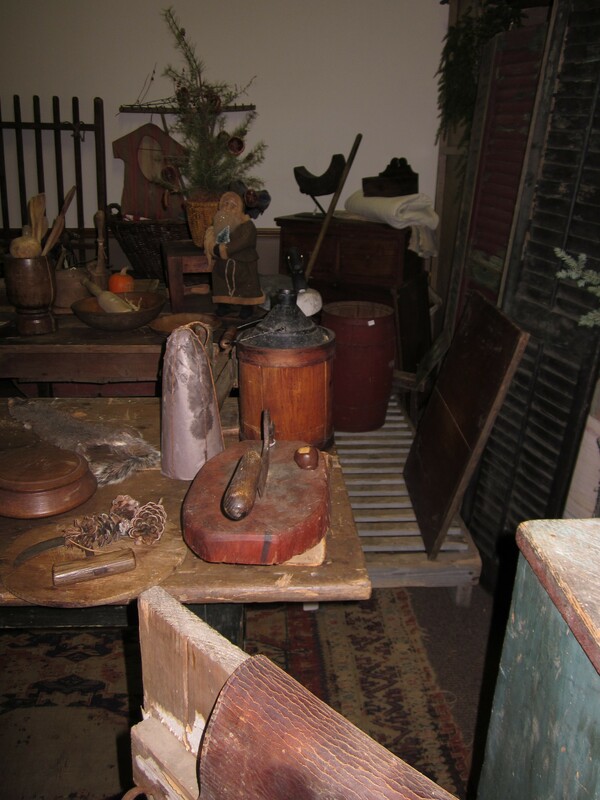 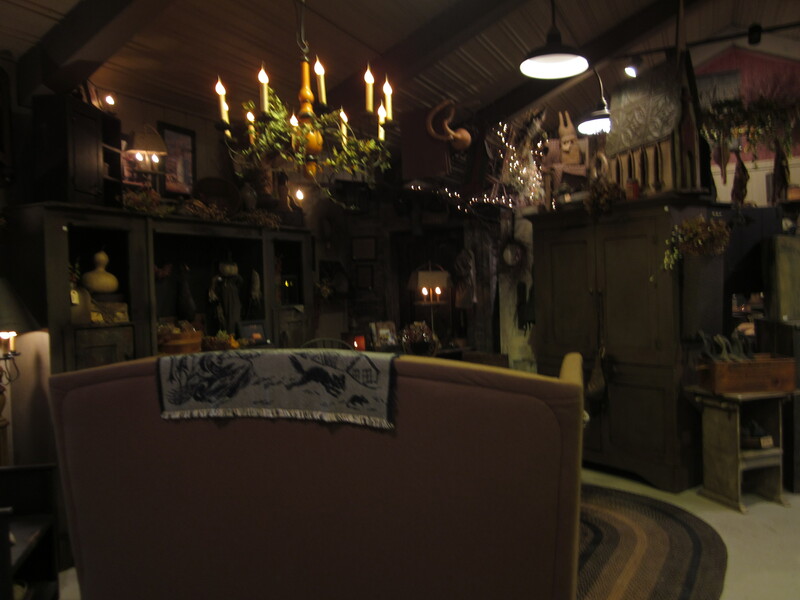 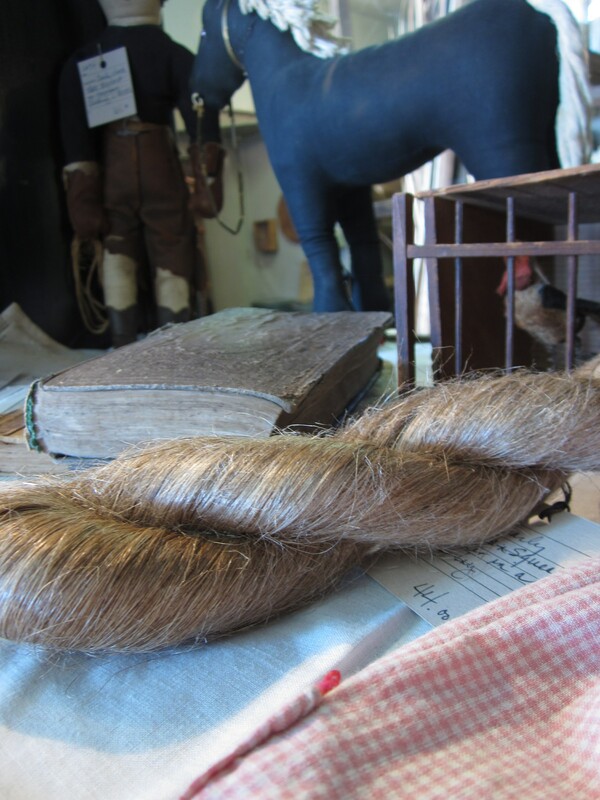 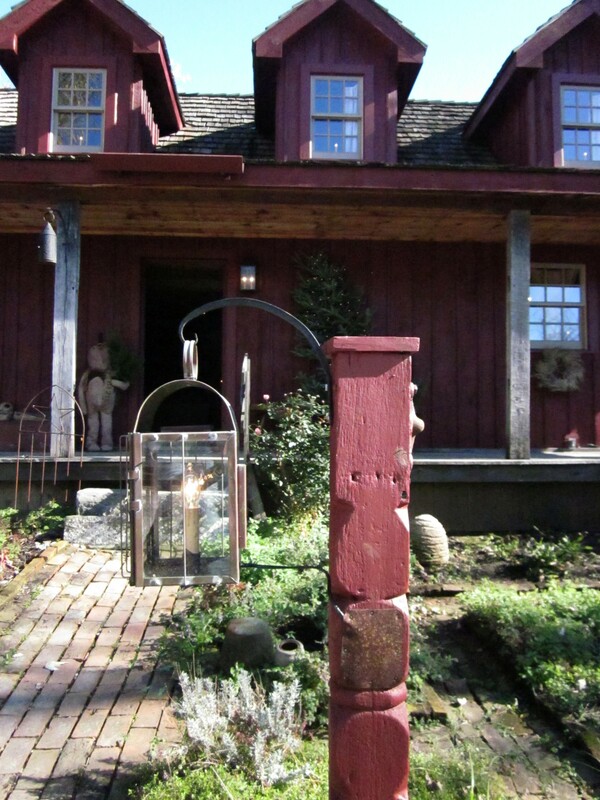 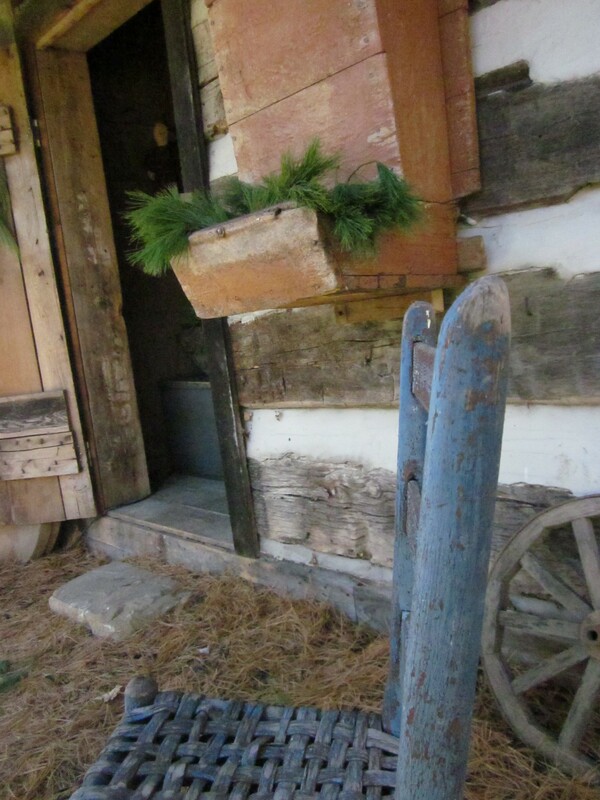 If you like country antiques, Windle’s Log Cabin Antiques is a MUST SEE! 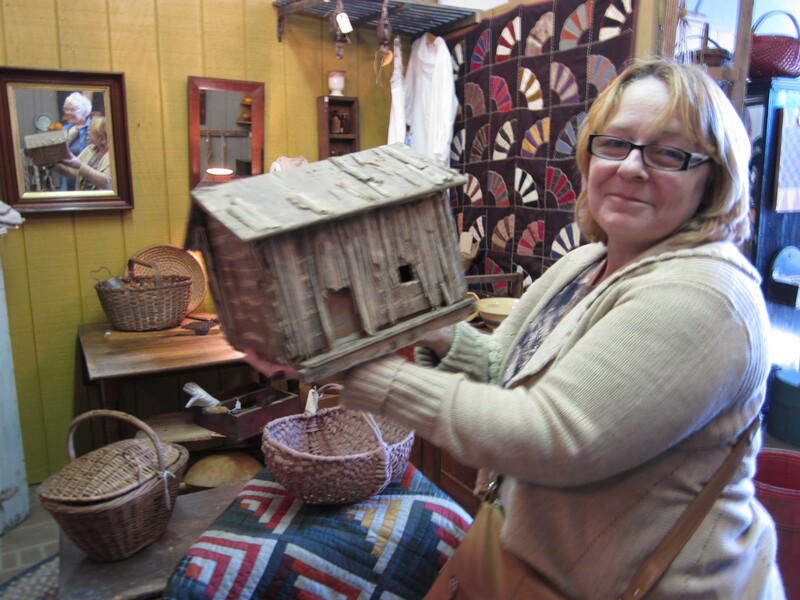 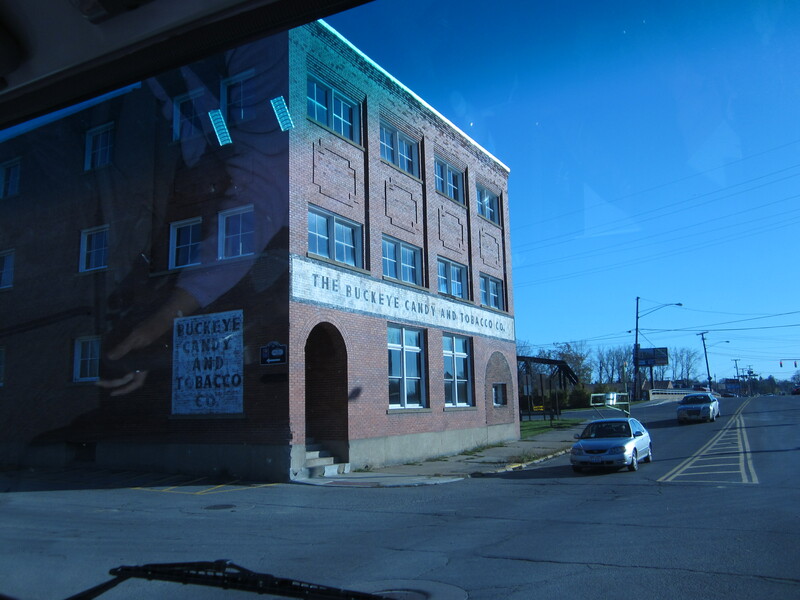 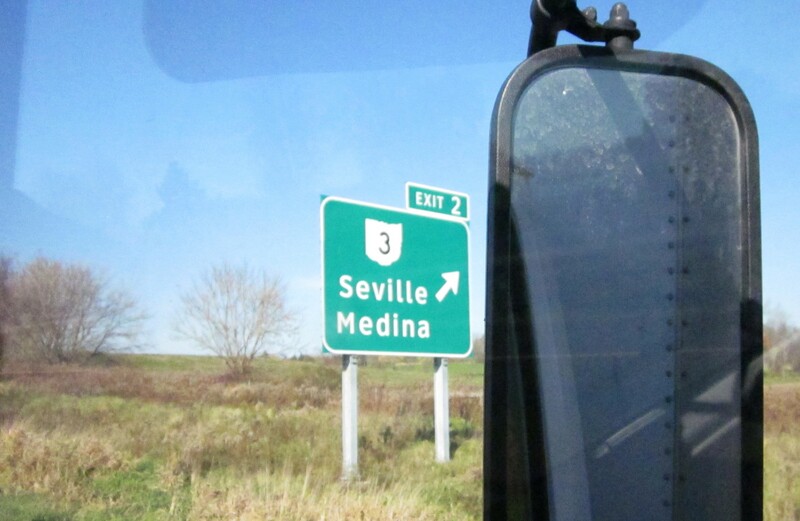 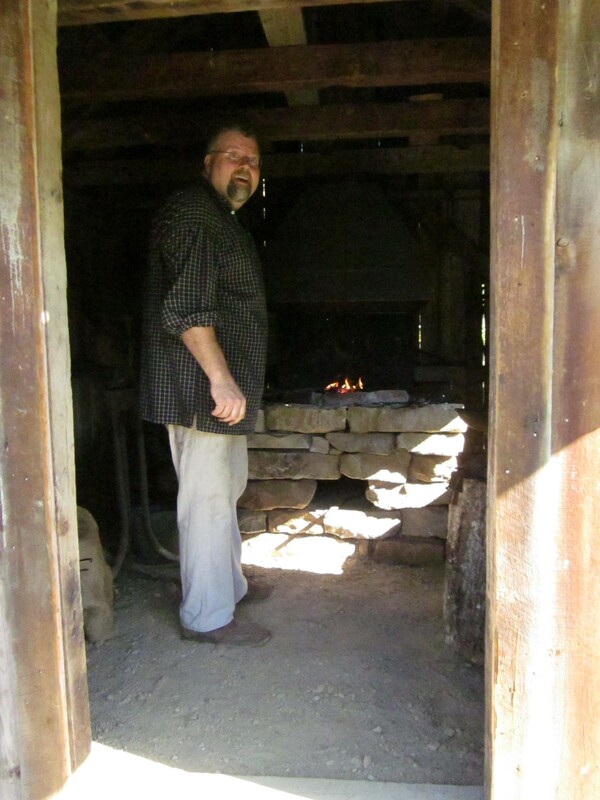 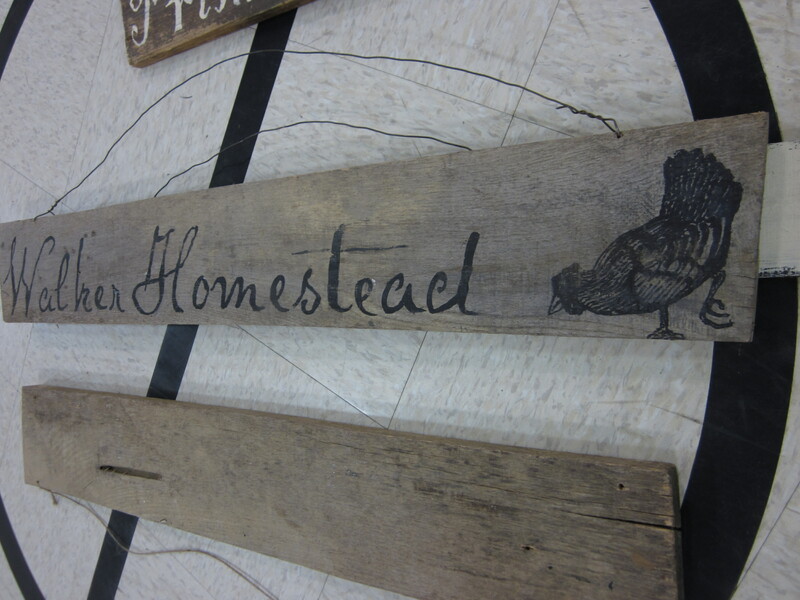 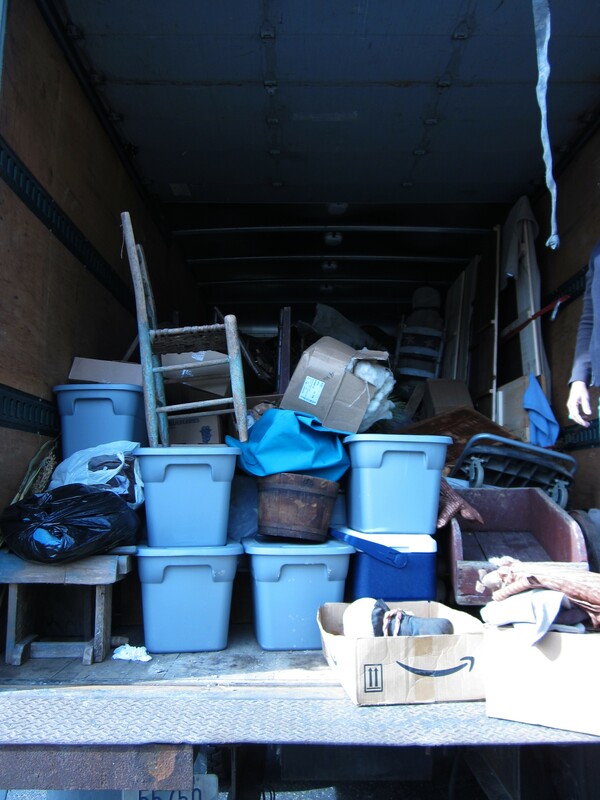 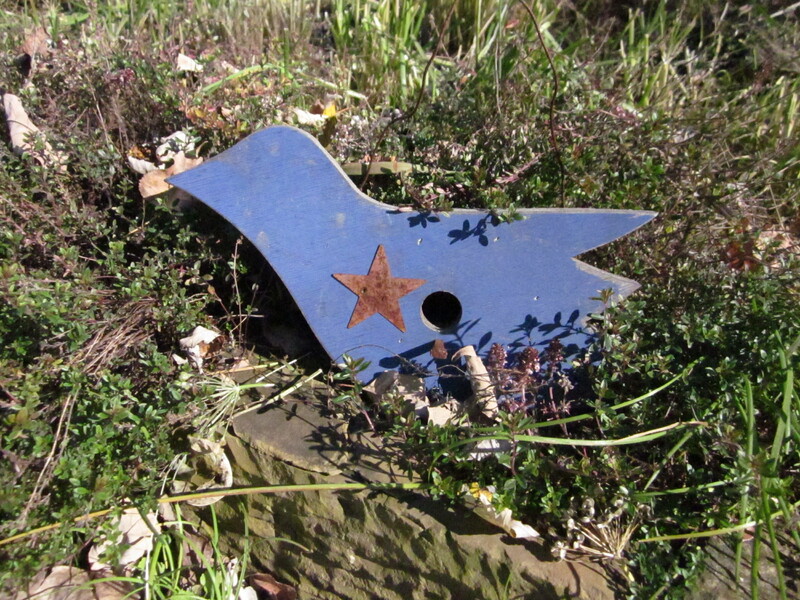 Then we were off to Cecilia Taylor’s Henhouse Primitives in Lewisville, Pennsylvania! 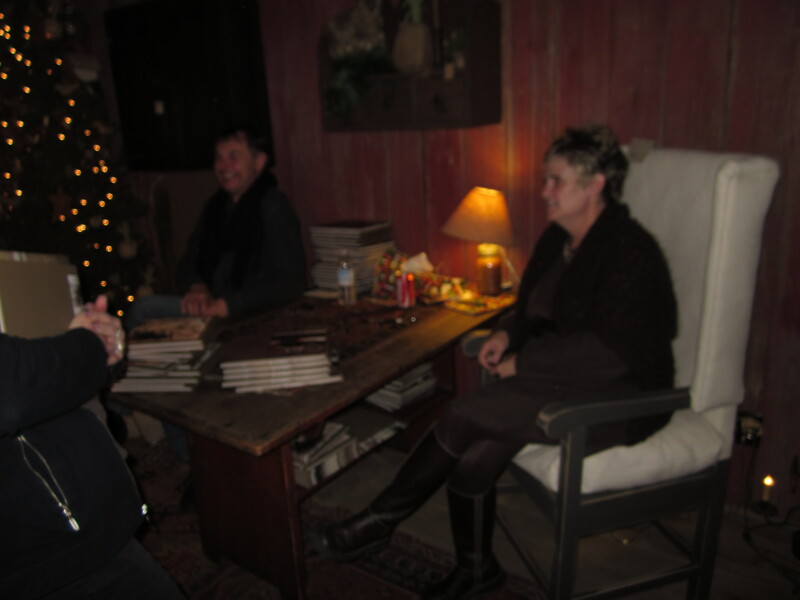 Cecilia was our lovely hostess during our stay… putting up with us, feeding us and taking care of all our needs… what a sweetheart! 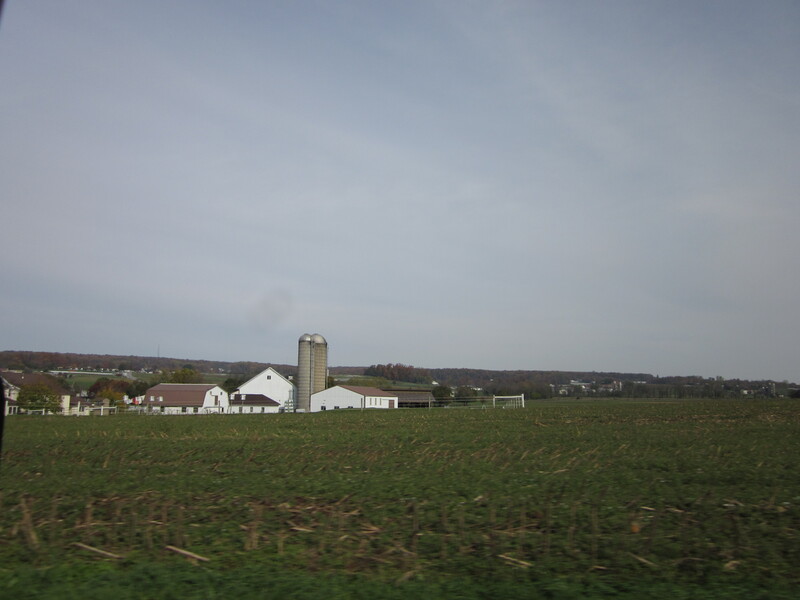 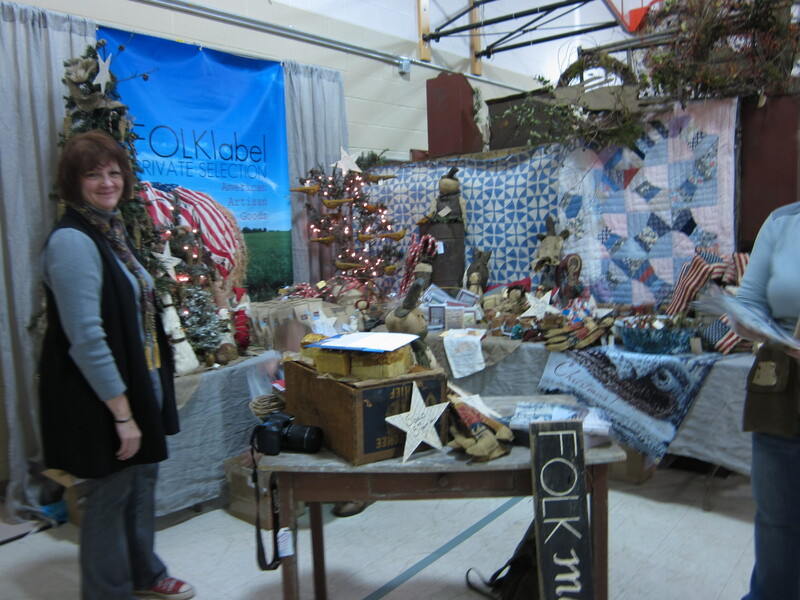 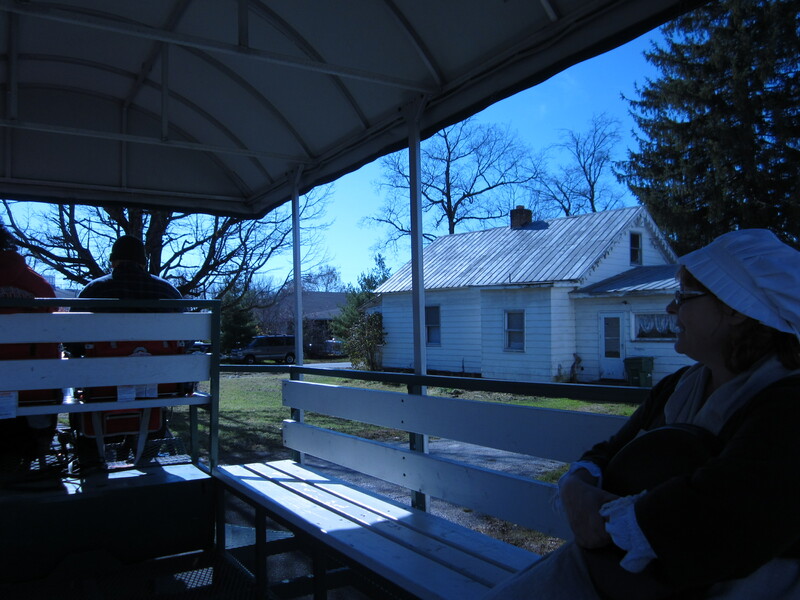 She is also the promoter of From the Farmhouse show in Elkton, Maryland… the next leg of our journey!